Goryu castle (五龍城) is located on Goryu-yama mountain, a long and narrow ridge spreads from Takagoya-yama mountain toward the meeting point of Gonokawa river and Motomuragawa river, like the body and tail of dragon. 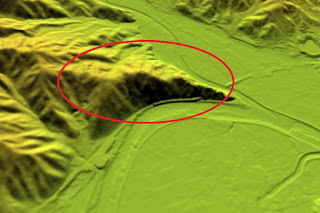 The height of core area is about 100 meter high from hillside and not so aloft one, but being sandwiched by two rivers, the shape of the ridge is a wedge like one with sheer side walls and it is an appropriate place to build a castle. 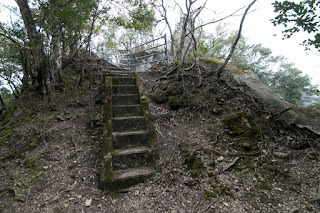 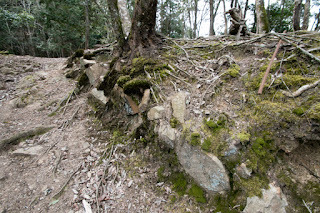 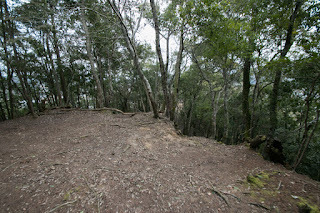 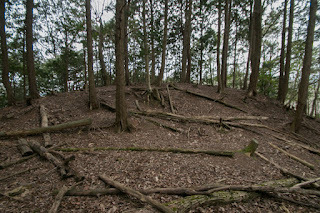 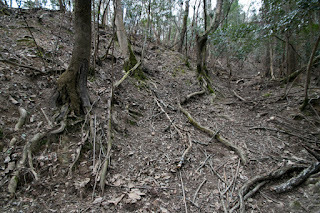 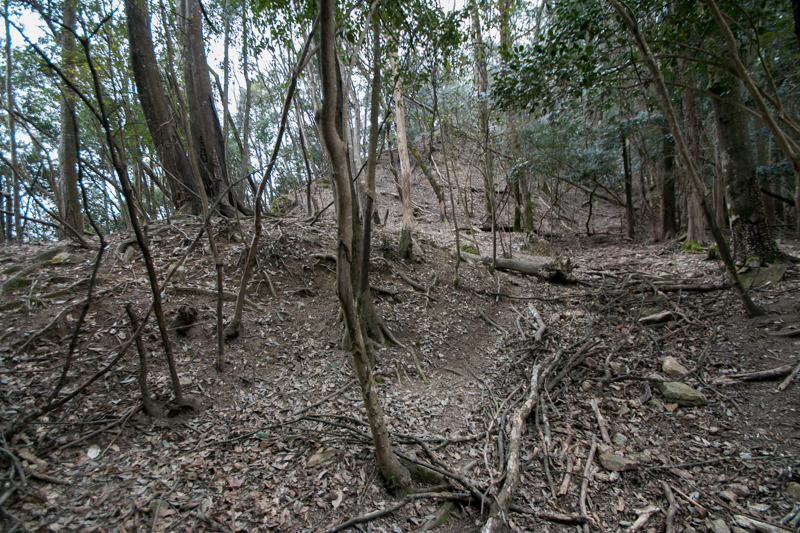 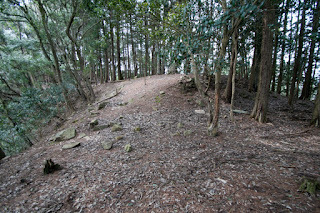 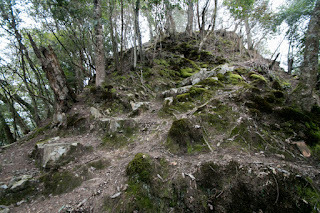 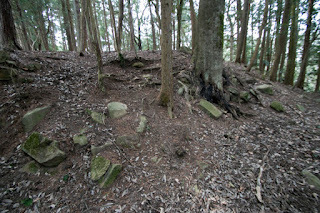 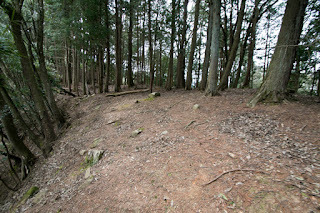 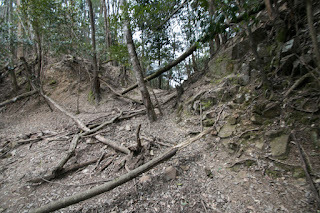 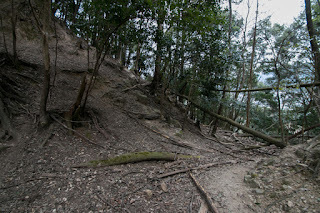 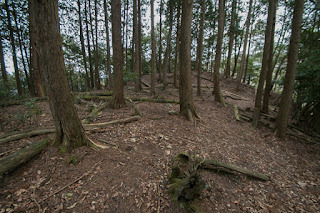 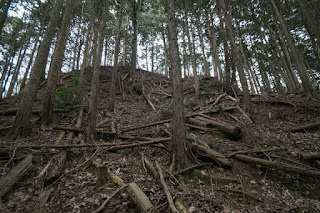 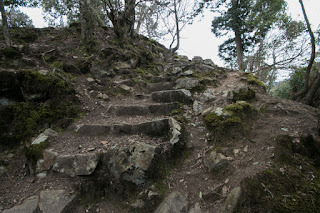 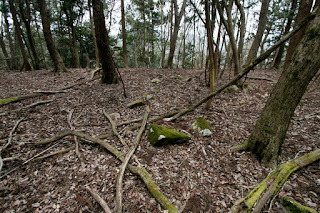 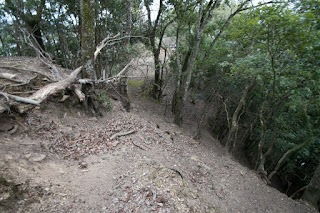 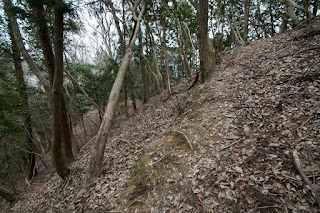 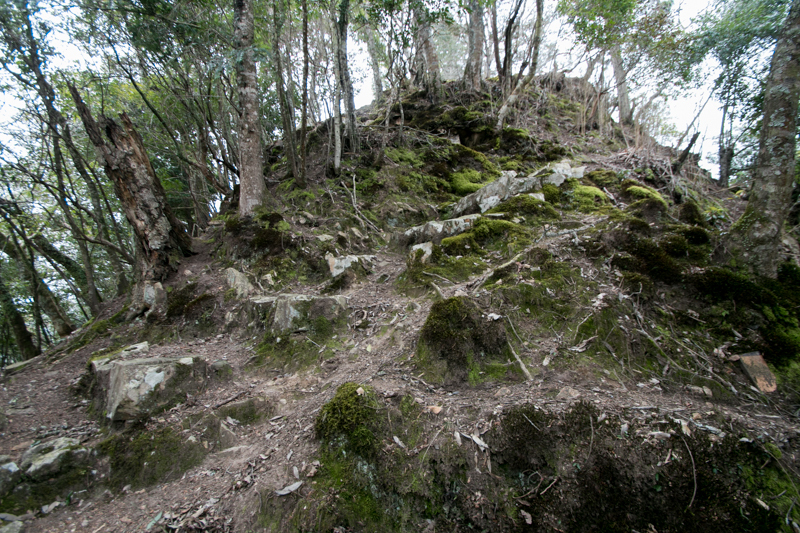 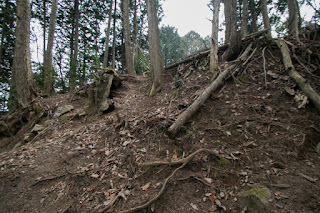 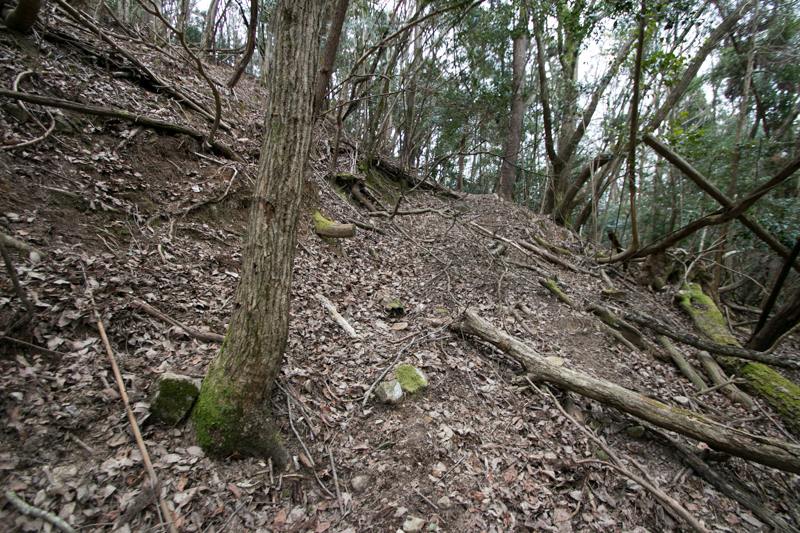 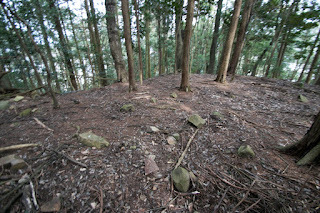 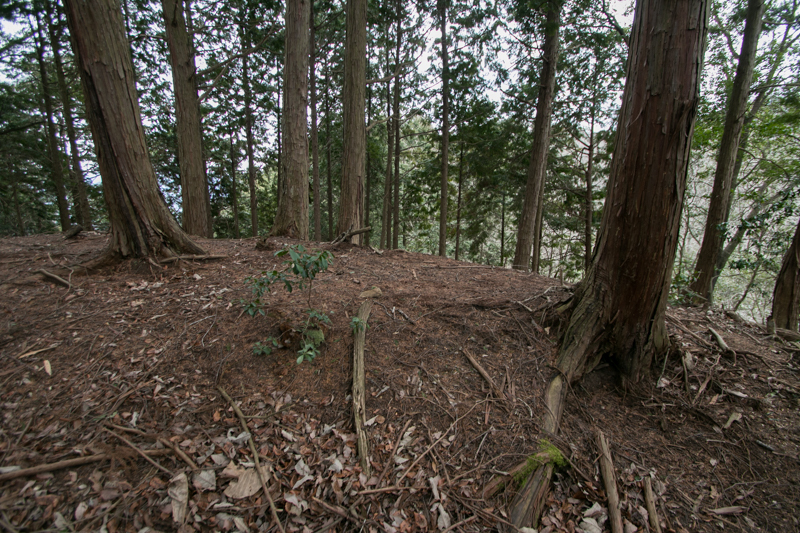 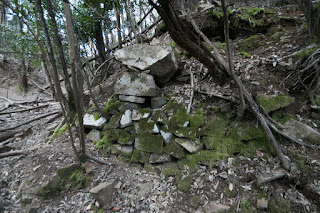 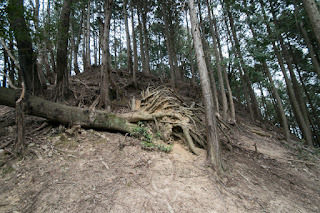 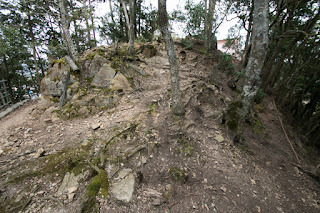 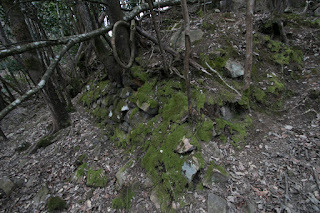 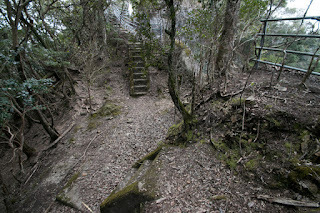 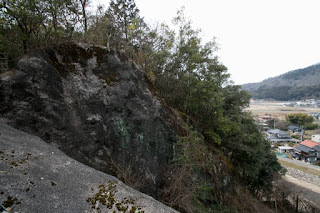 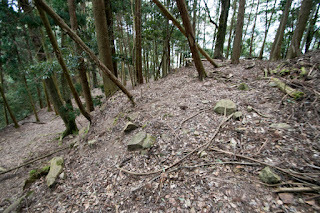 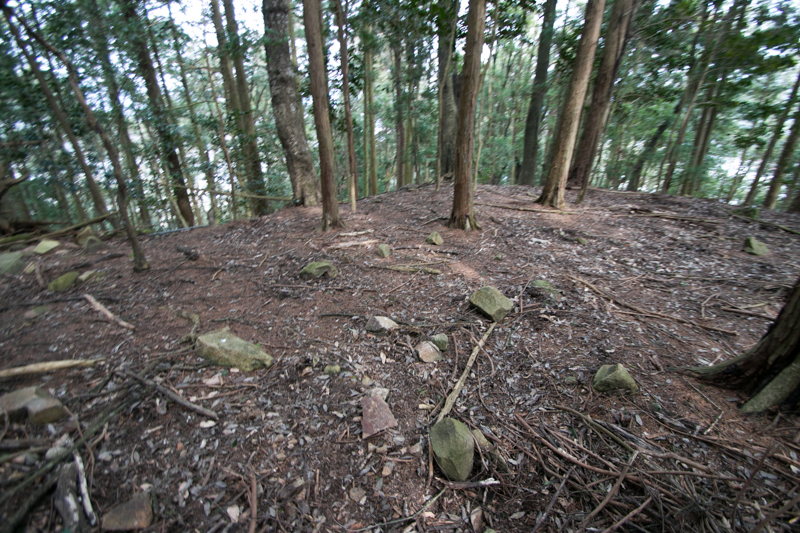 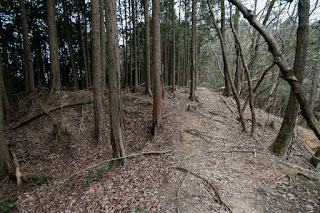 Castle site is only five kilometer downstream of Gono-kawa river from Aki Koriyama castle (Hiroshima prefecture), the main base of Mouri clan which became the ruler of Chugoku region in the middle of 16th century. 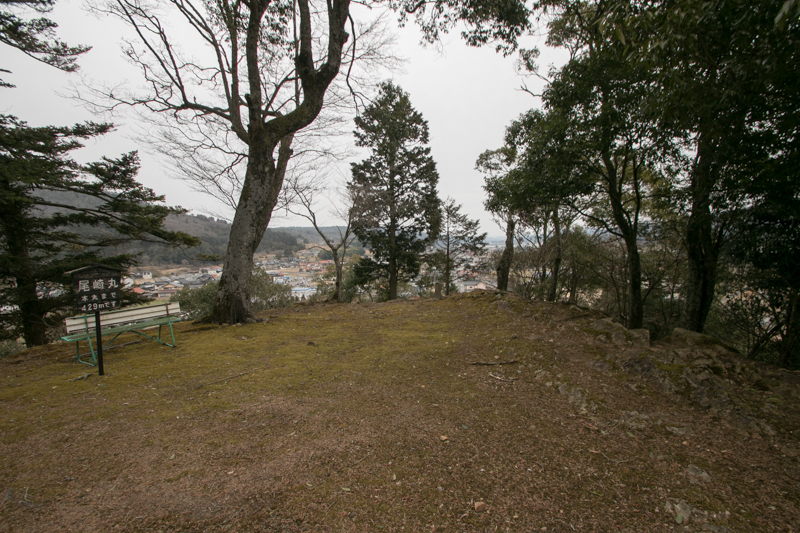 From Aki Koriyama castle. 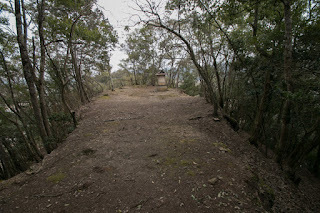 Goryu castle is one the way toward Miyoshi basin, which is the center of communication in the western half of Chugoku province toward current Izumo province (Shimane prefecture) or Bicchu province (Okayama prefecture). 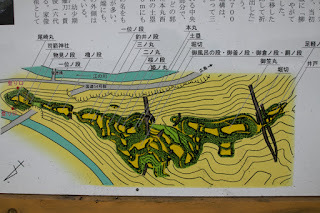 Along with Hinoyama castle (Hiroshima prefecture) at the north, and Niitakayama castle (Hiroshima prefecture) at the southeast, Goryu castle at the southeast, Goryu castle was an important front base and posting point toward northwest. 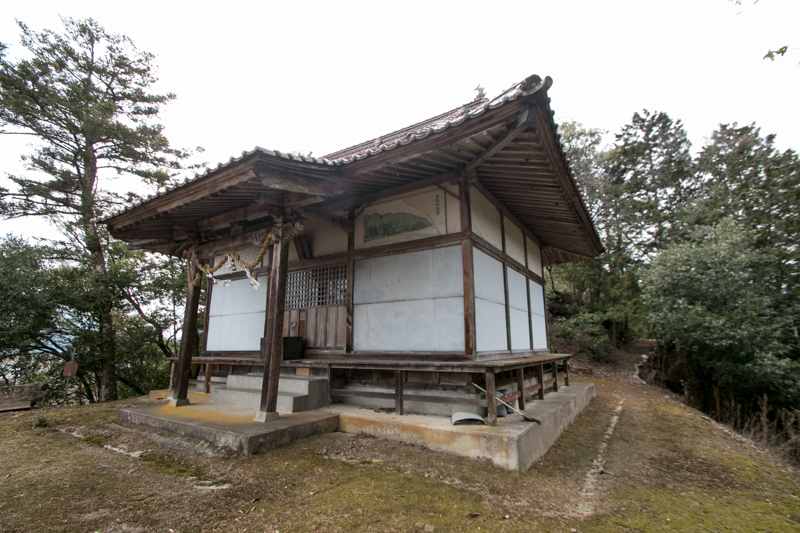 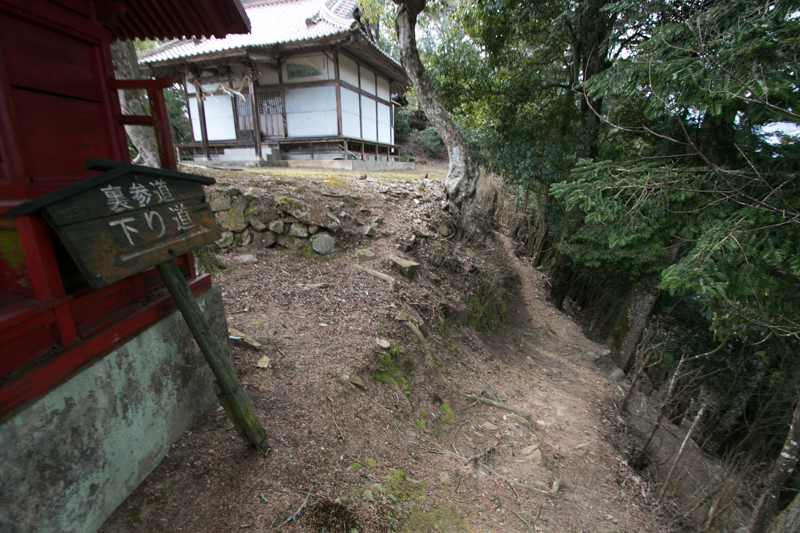 Precise year is unknown but Goryu castle was built by local lord Shishido clan in 14th century. 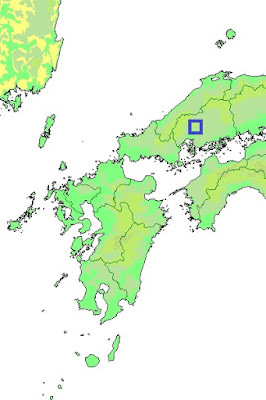 Shishido clan was originally a local retainer of Hitachi province (Ibaraki prefecture), which was a descendant of Tomoie Hatta (1142-1218), and applicable to the distant relative of Utsunomiya clan or Oda clan. 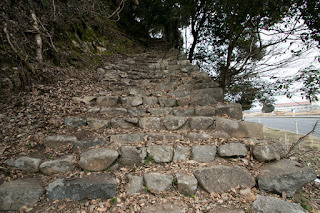 At the fall of Kamakura Shogunate in 1333, Tomoie Shishido (?-? 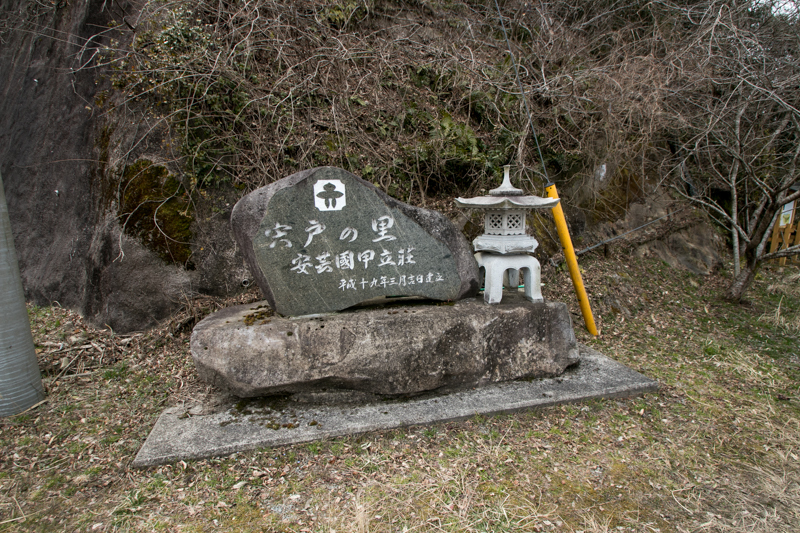 ), the leader of Shishido clan, belonged to Takauji Ashikaga (1305-1358) who was the founder of Muromachi Shogunate and fought with his enemies such as remnants of Kamakura Shogunate or South Court army at various places. 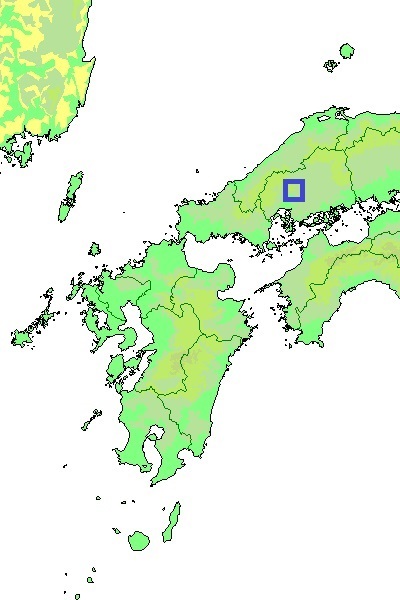 Being evaluated his contribution, Tomoie achieved Kotachi providence and moved there in 1334. Tomoie at first Yanagigajo castle at the north of Goryu castle, but later moved to Goryu-yama mountain which was a secure place protected by rivers and cliffs. 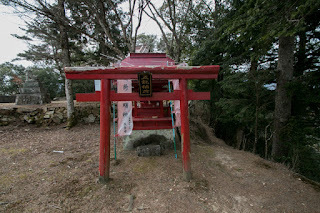 Located at Goryu castle, at the time of Motoie Shishido (1434-1509), Shishido clan gradually grew their power and became regarded as one of major local lords of Aki province along with Mouri clan or Kobayakawa clan. In Muromachi era, Aki Takeda clan or Yamana clan were appointed as the governor of Aki province, but could not build their base at the province. 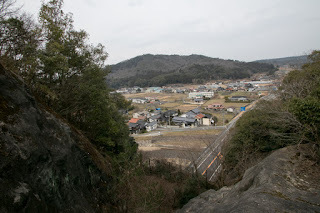 Furthermore, Ouchi clan which was the strong governor of Suo province and Nagato province (Yamaguchi prefecture) also had their territory at Aki province. 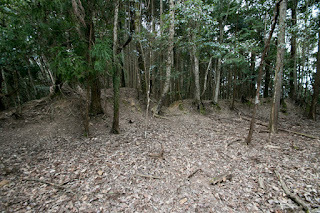 and intervened to the province. 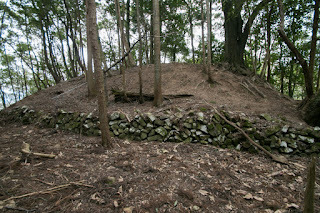 Among such situation, local lords of Aki province allied and made autonomy. 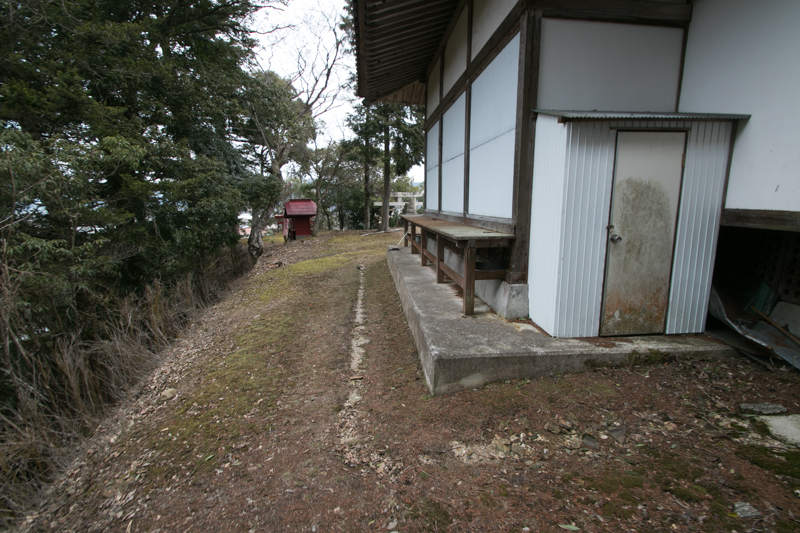 In 1404, local lords of Aki province gathered and resisted to Yamana clan, and Shishido clan became the member of this along with Mouri clan. 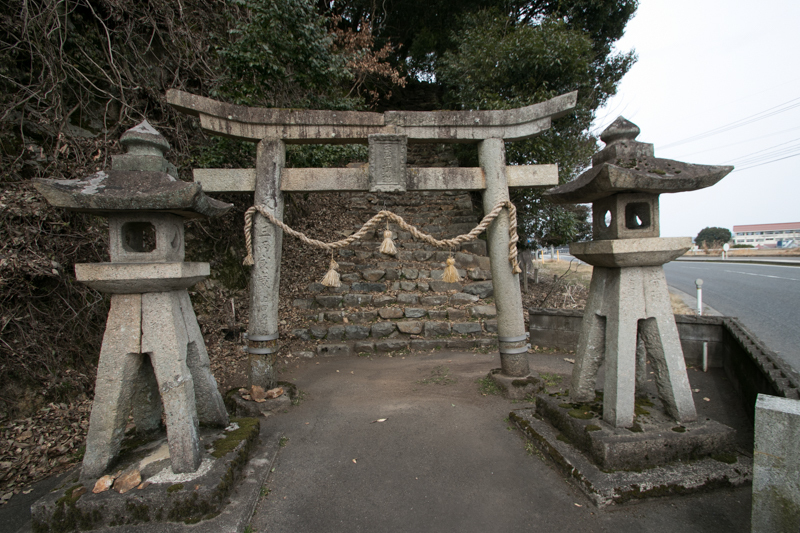 About 100 years after that, in 1511, Mouri clan gathered local lords and made alliance again. 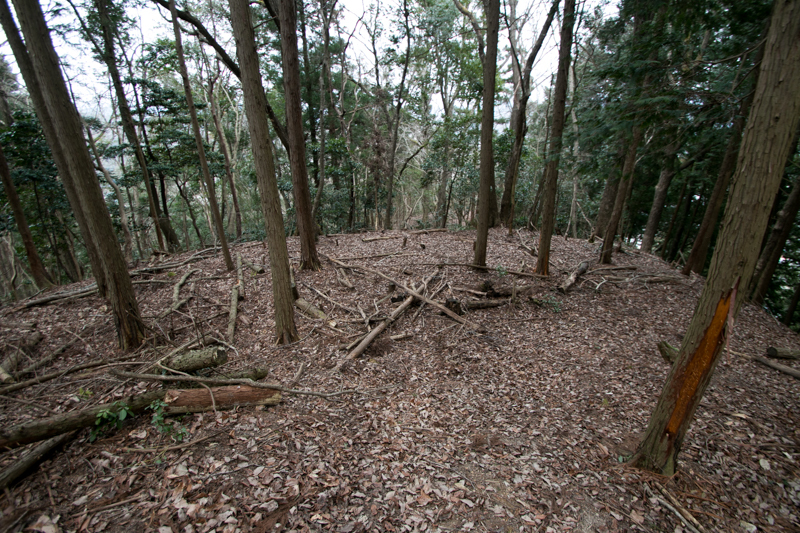 But this time Motoyoshi Shishido (?-1542), the leader of Shishido clan, conflicted with Mouri clan, and did not participate in this alliance. 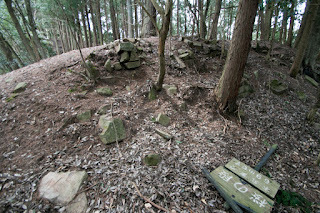 Okimoto Mouri (1492-1516), the leader of Mouri clan attacked Goryu castle several times but Shishido clan rejected that. 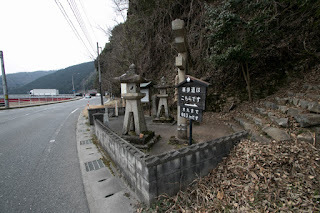 However, in 1533, Motonari Mouri (1497-1571), the younger brother of Okimoto Mouri and who became the leader of Mouri clan, turned to the peace with Shishido clan and let his daughter marry with Takaie Shishido (1528-1592), the successor of Shishido clan. 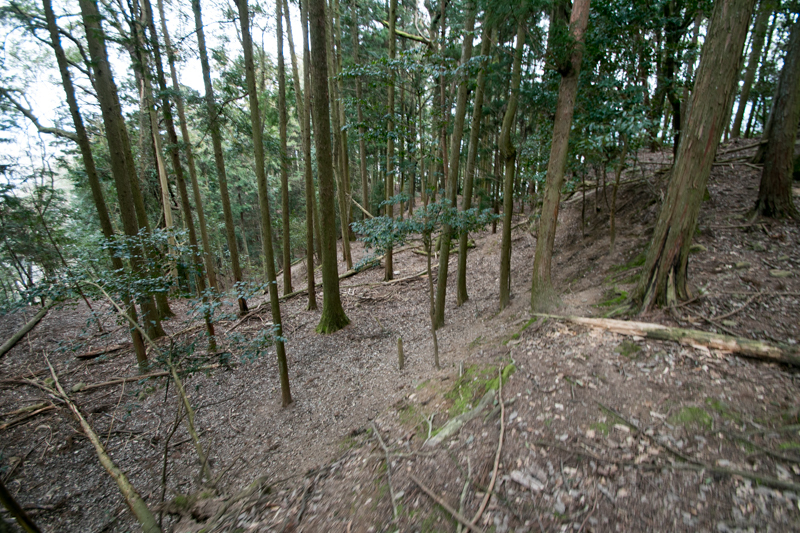 Among the conflict with two superpowers Ouchi clan and Amago clan, Motonari needed to secure his main base and also needed strong army of Shishido clan. 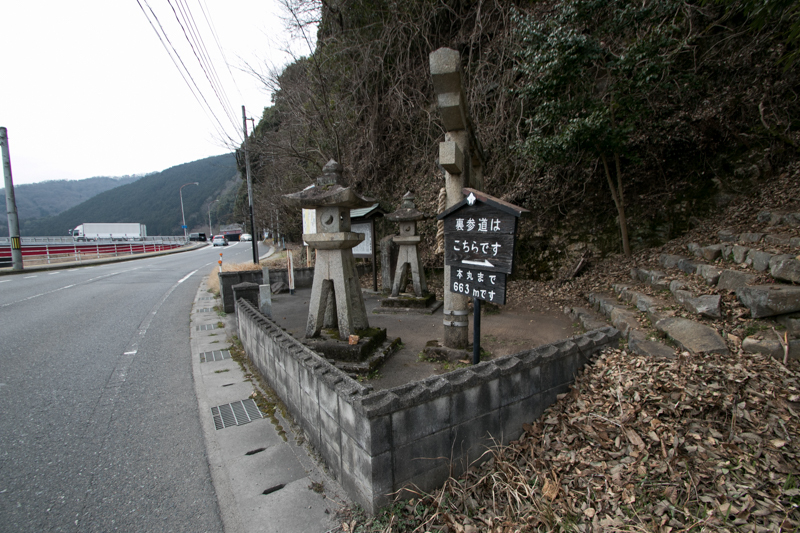 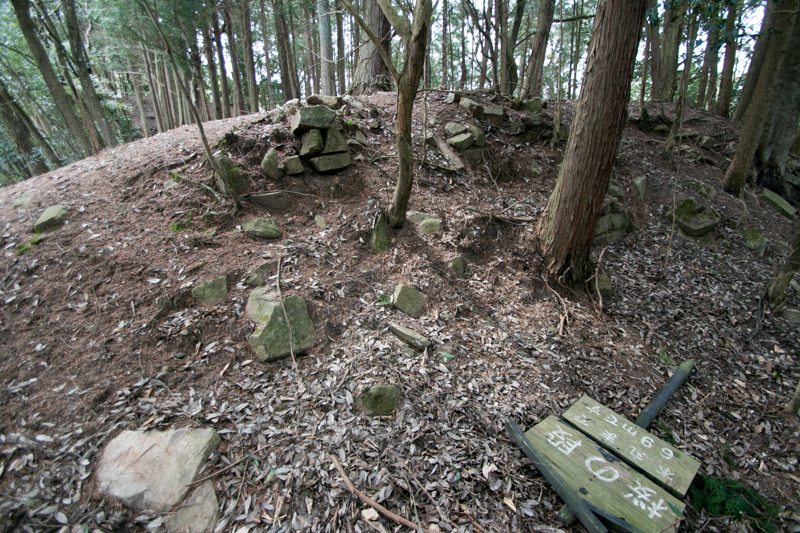 In 1540, Amago clan sent a large army of 40,000 soldiers to Yoshida Koriyama castle, the main base of Mouri clan. 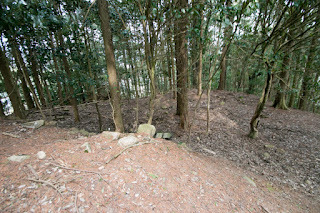 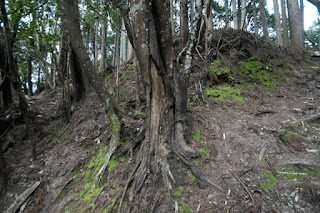 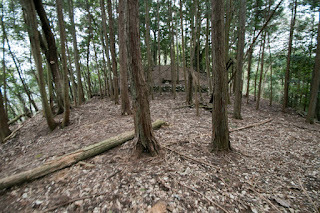 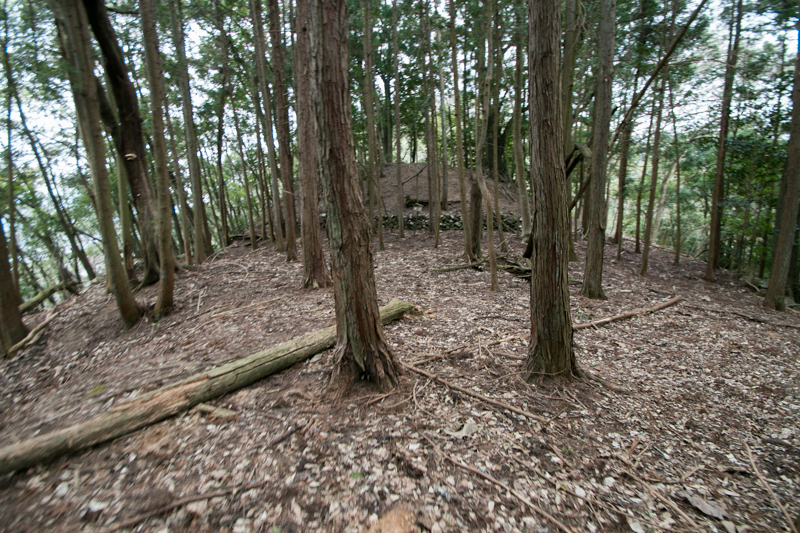 Shishido clan well kept Goryu castle on the way from Izumo province where was the main territory of Amago clan, and obstructed the supply of Amago army. 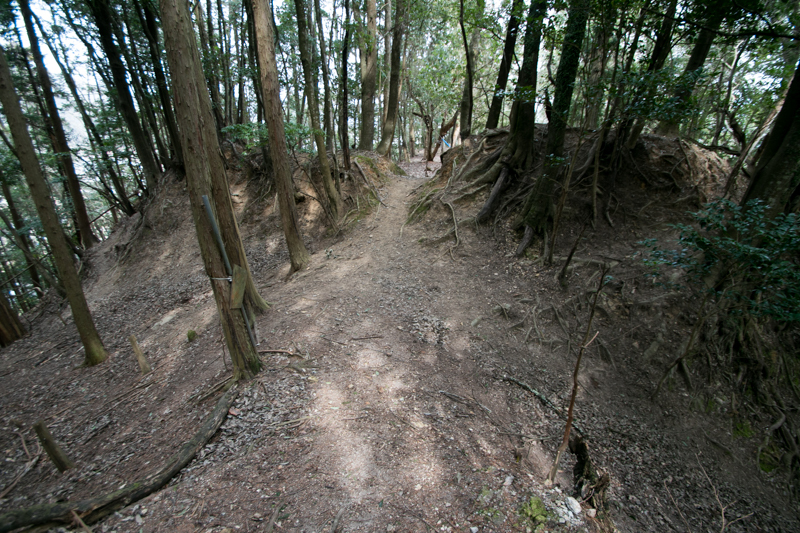 Furthermore, Takaie entered Yoshida Koriyama castle with reinforcement army and well fought, then contributed to the victory of Mouri clan. 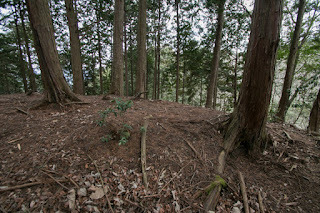 After that Shishido clan became the first positioned retainer of Mouri clan, and Goryu castle was expanded into a large castle suitable for their position. Goryu castle is built over a long and narrow ridge gradually goes down from east to west, with small height. 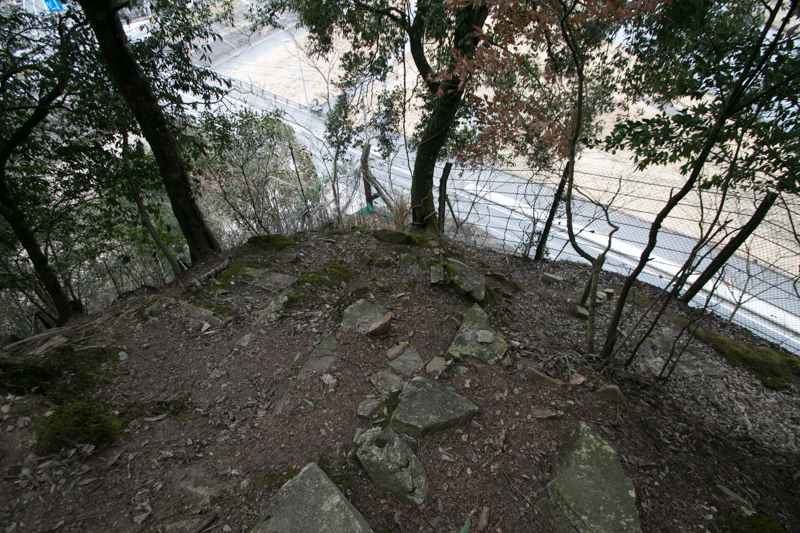 Central area of the castle is a rectangular terrace of 50 meter long and 20 meter width, with a watchtower basement at its western edge. 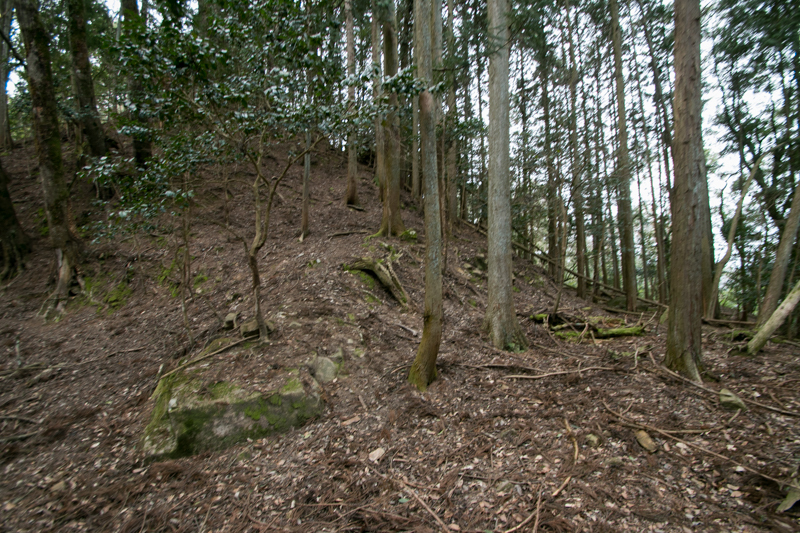 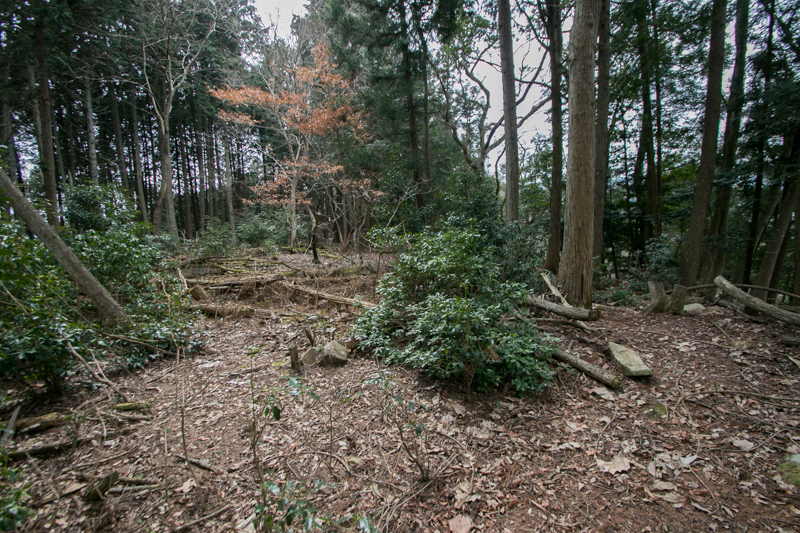 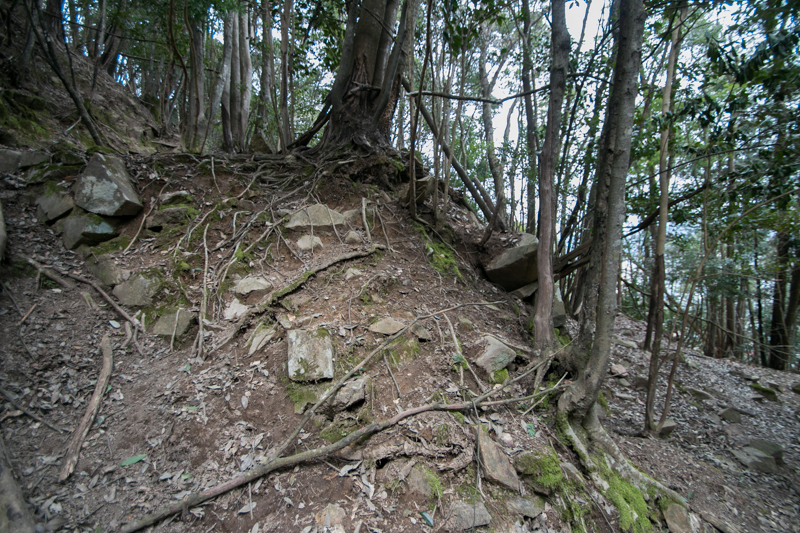 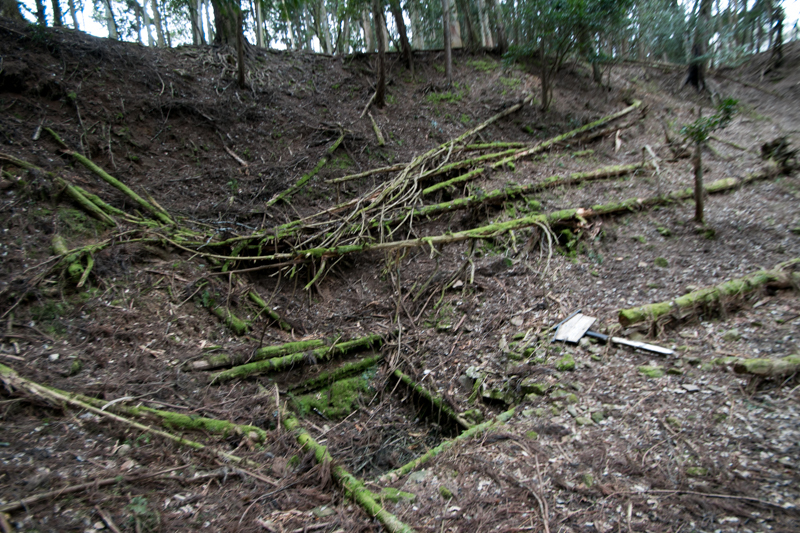 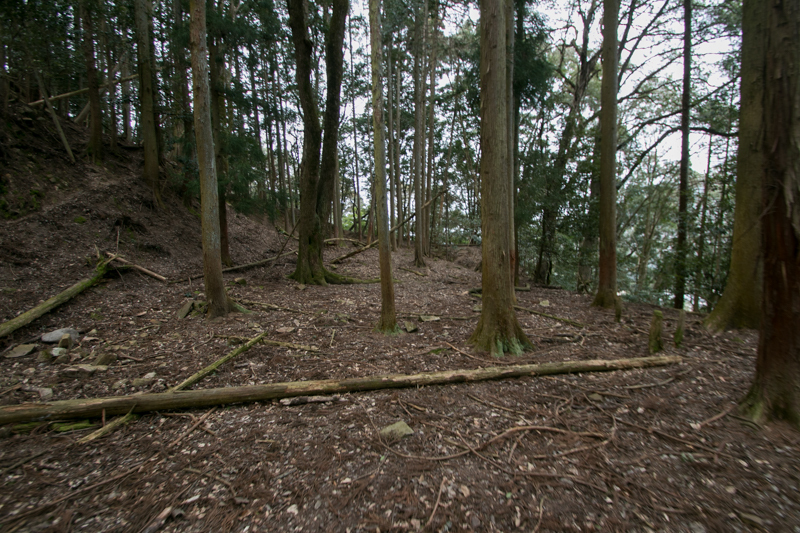 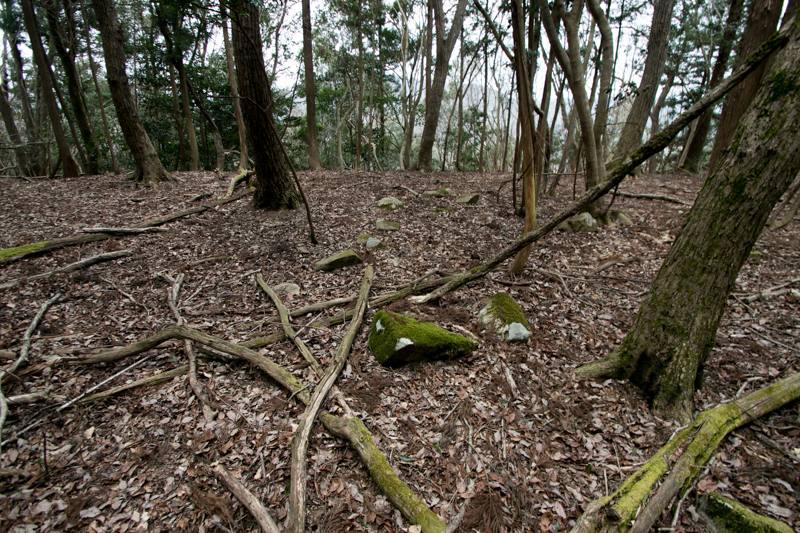 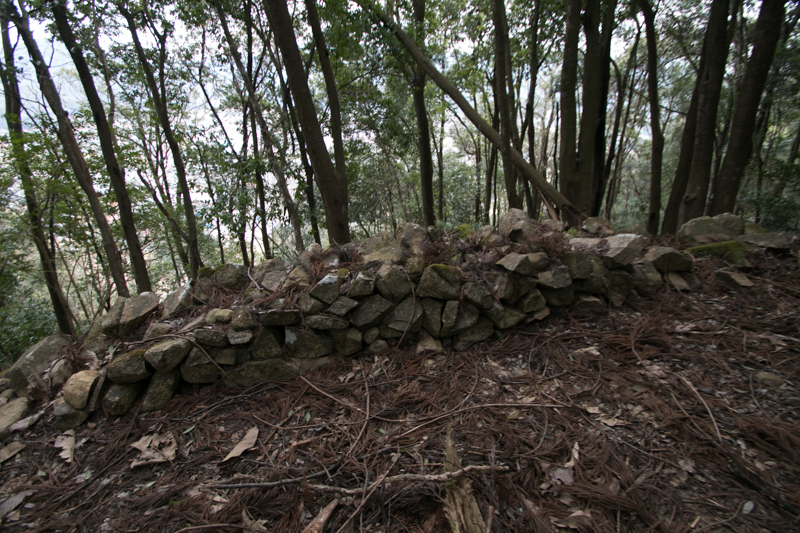 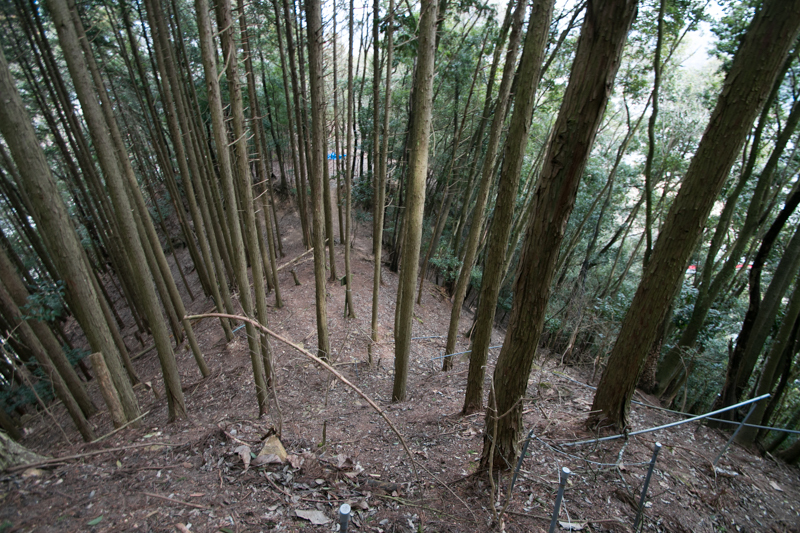 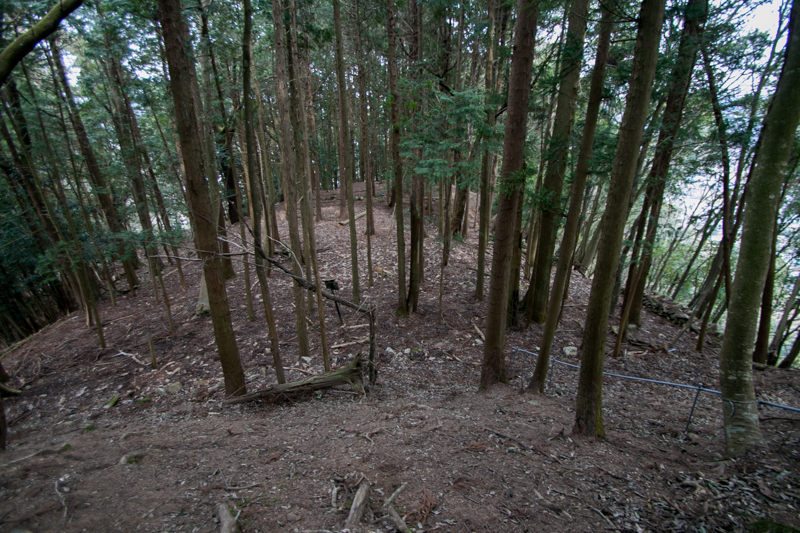 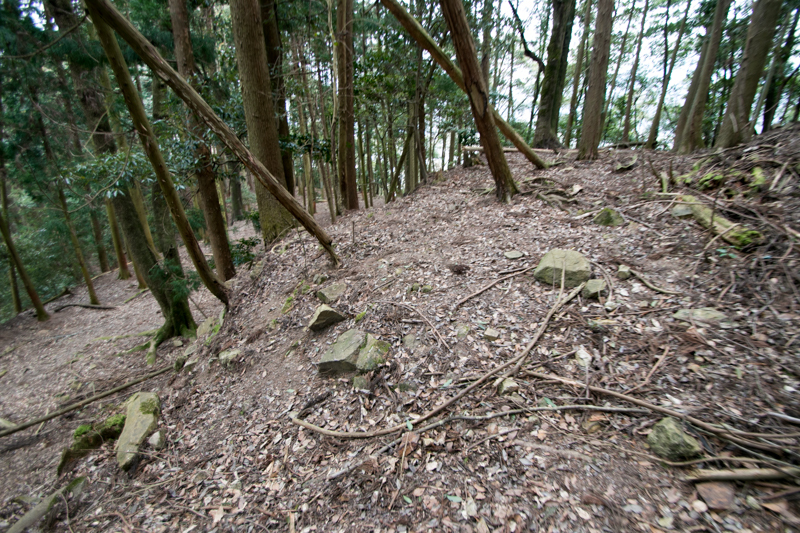 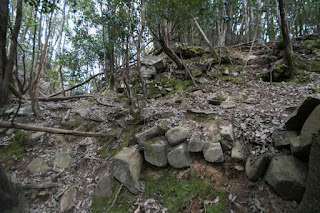 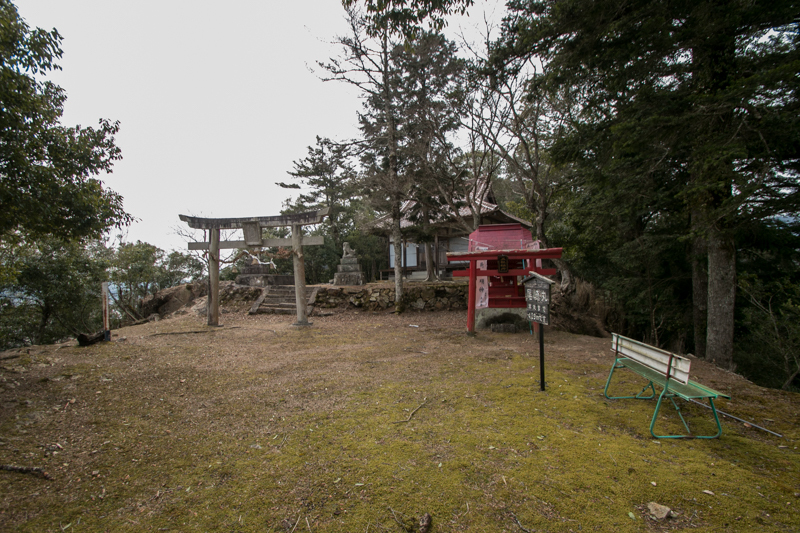 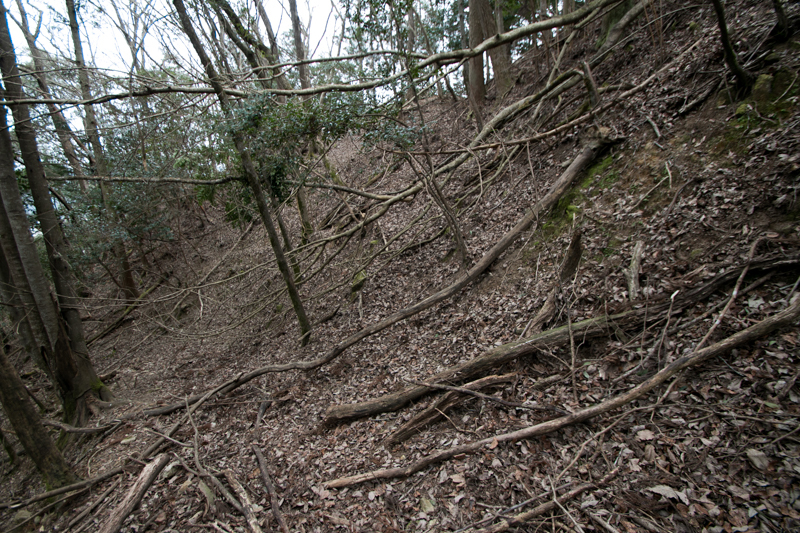 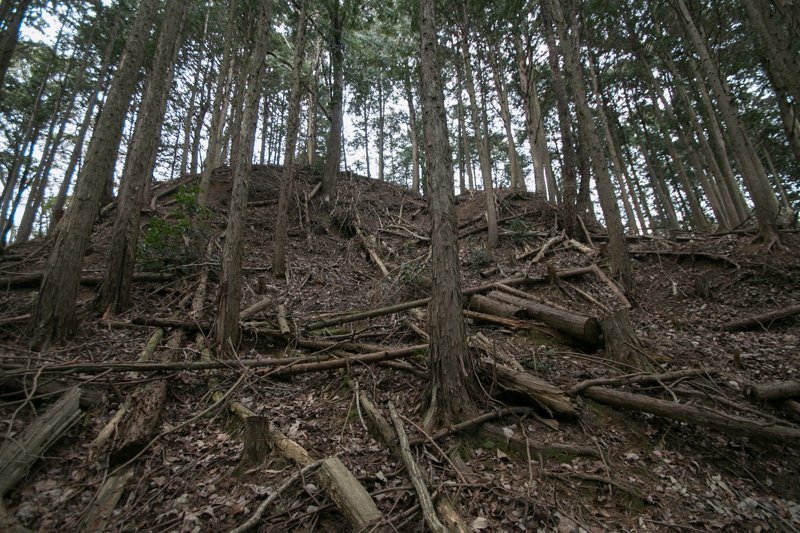 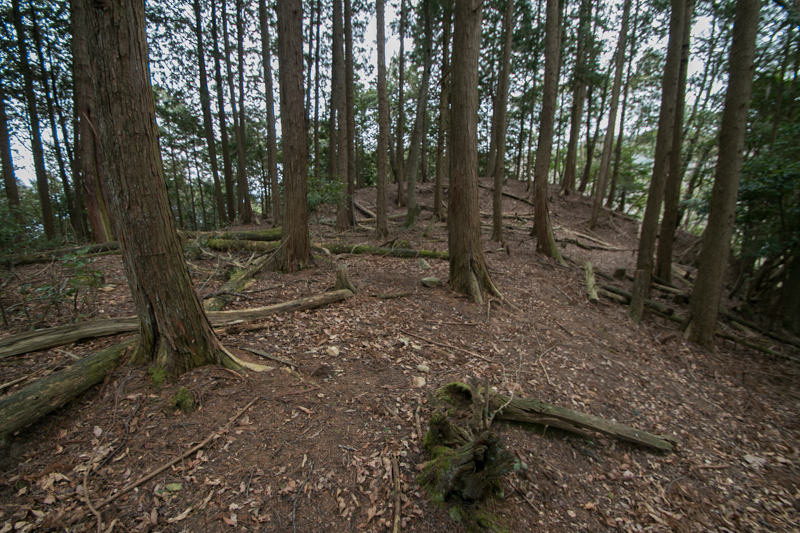 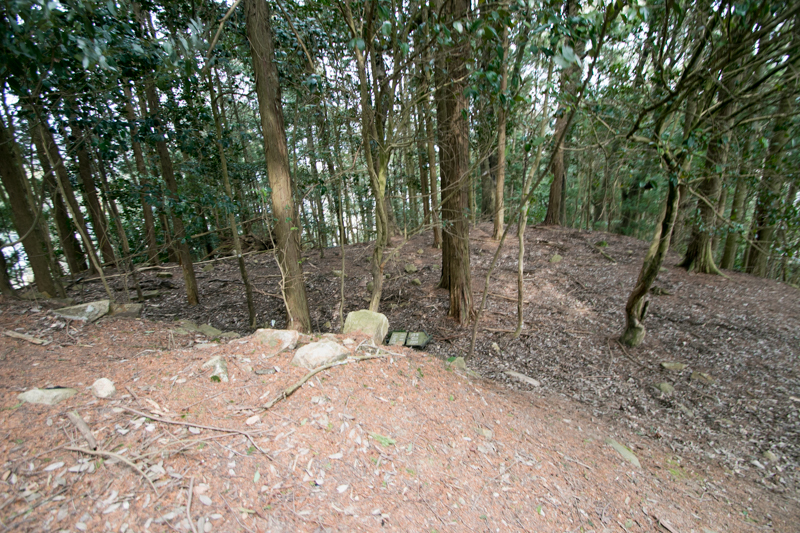 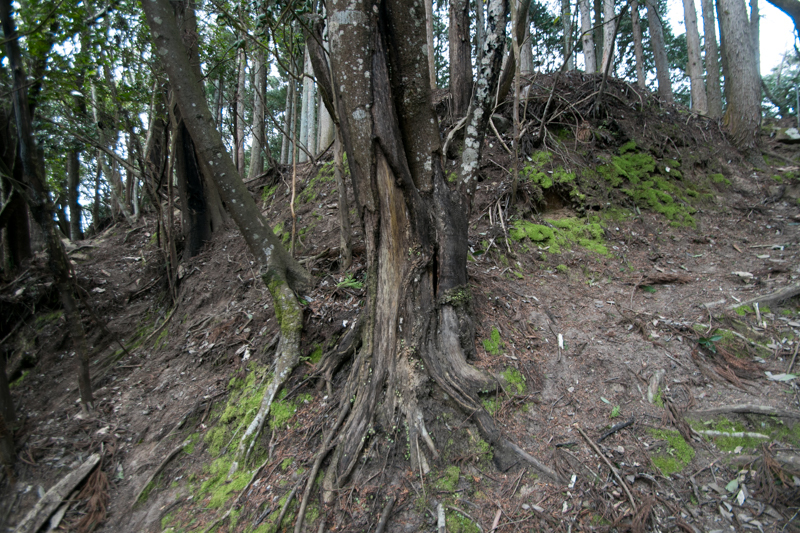 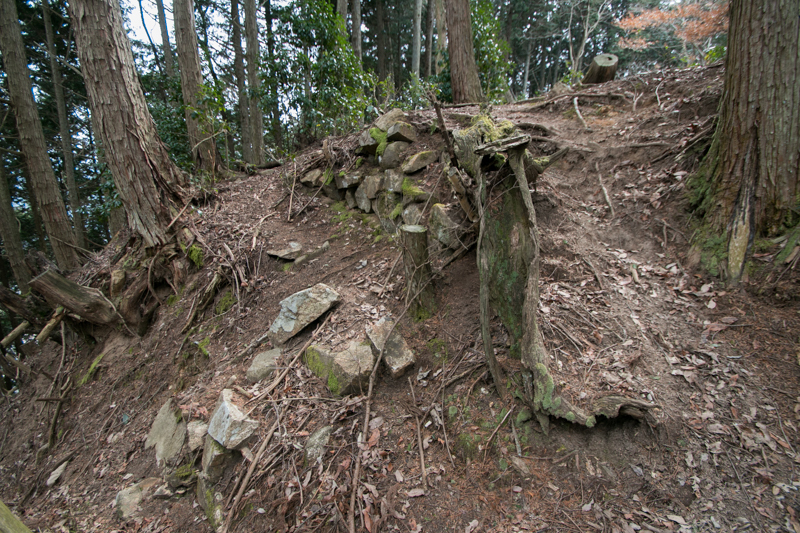 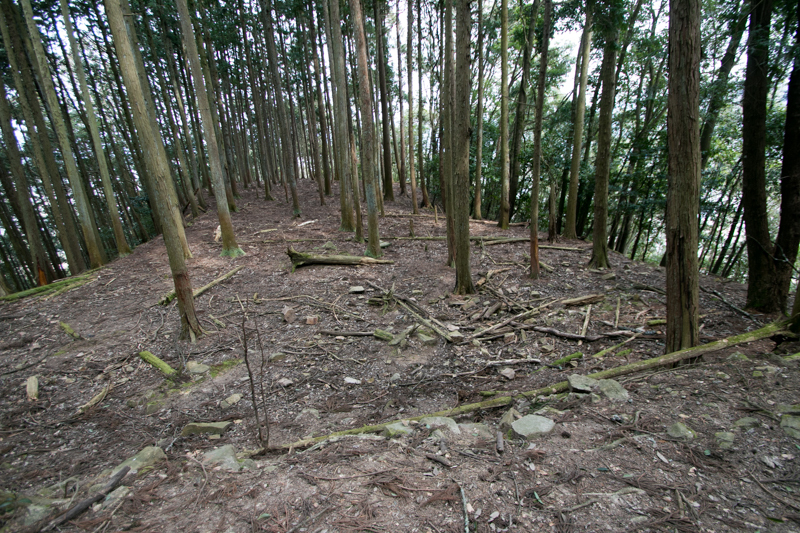 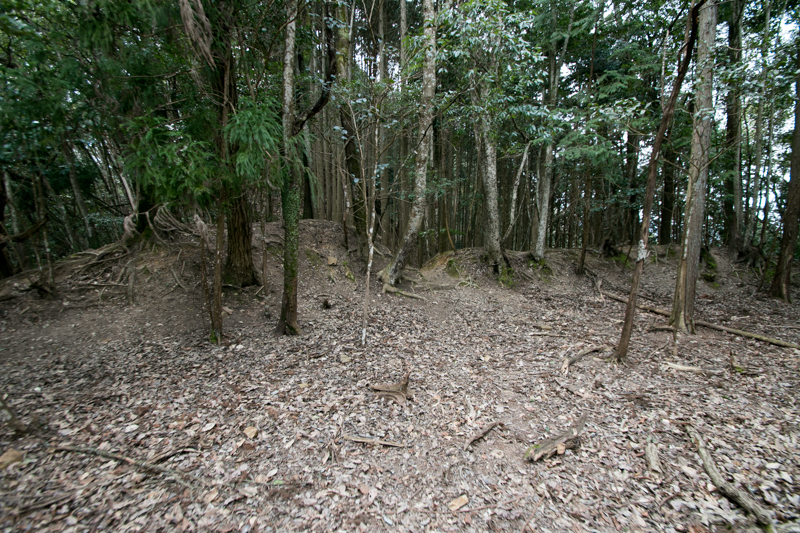 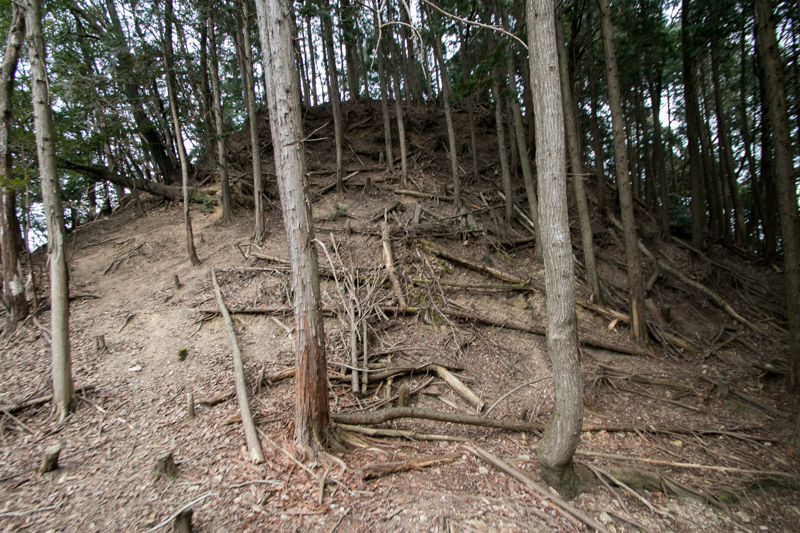 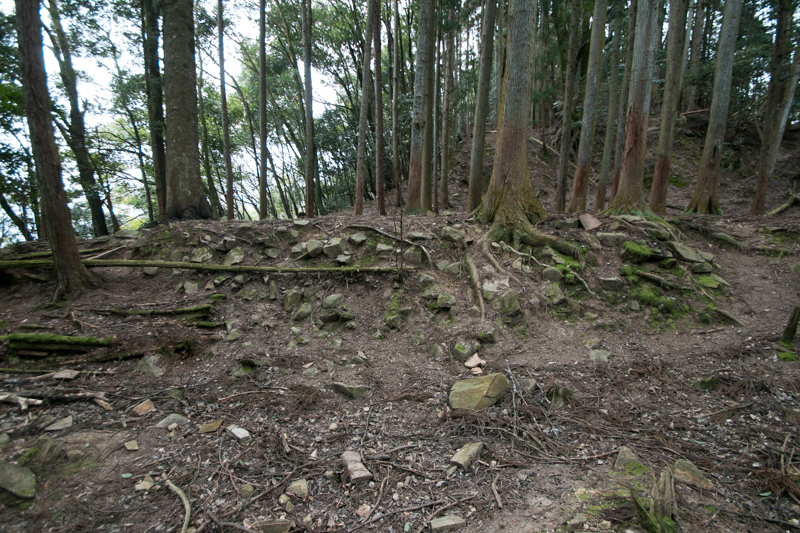 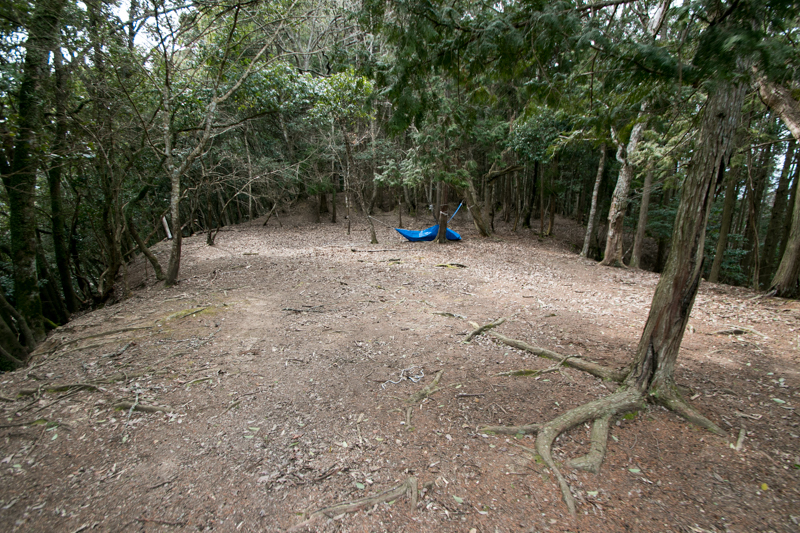 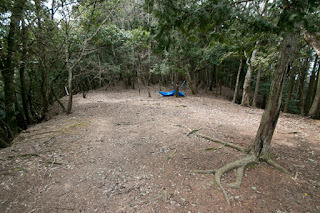 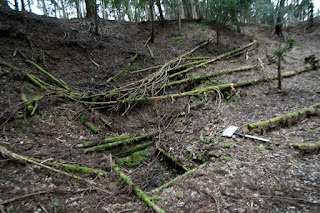 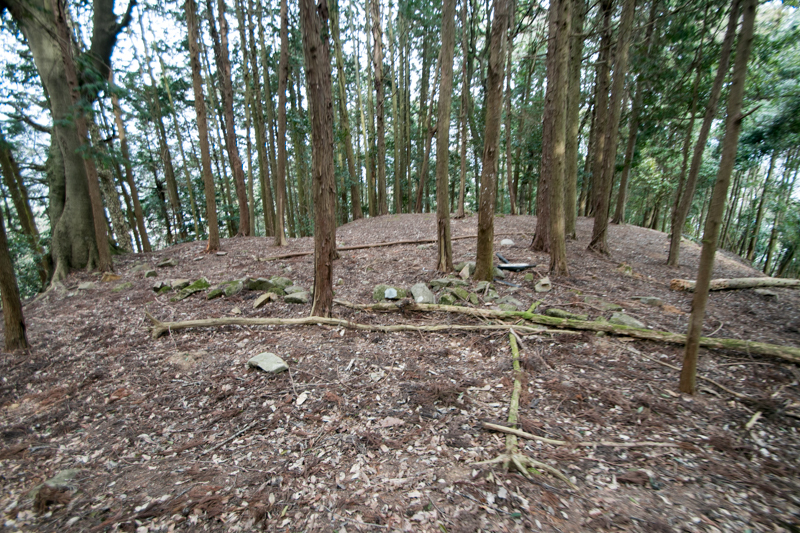 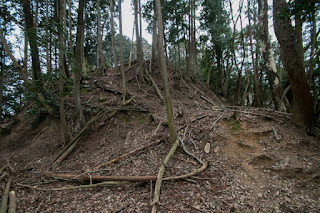 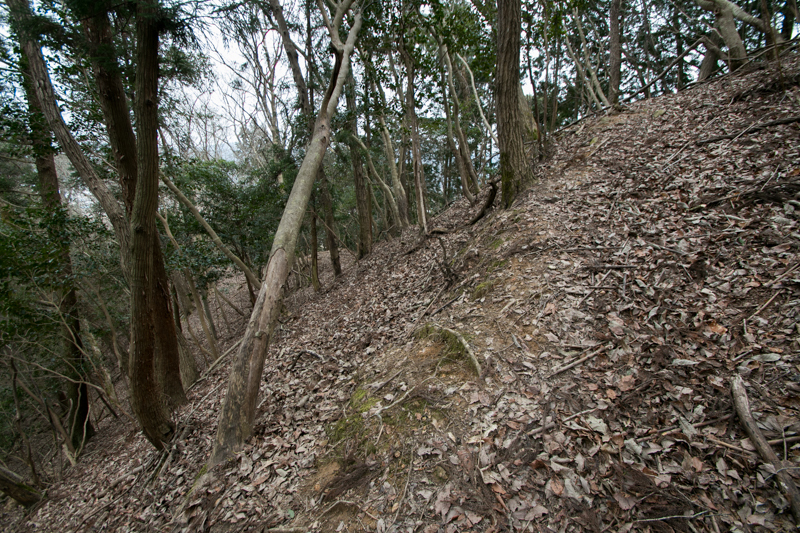 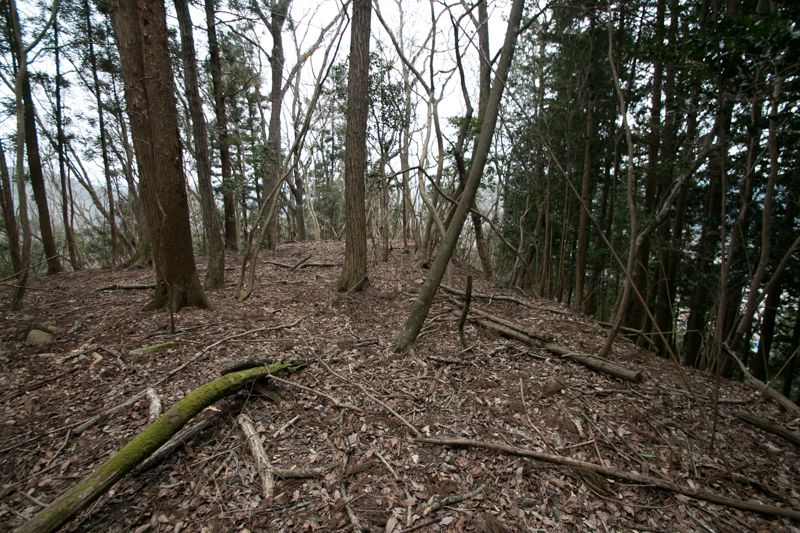 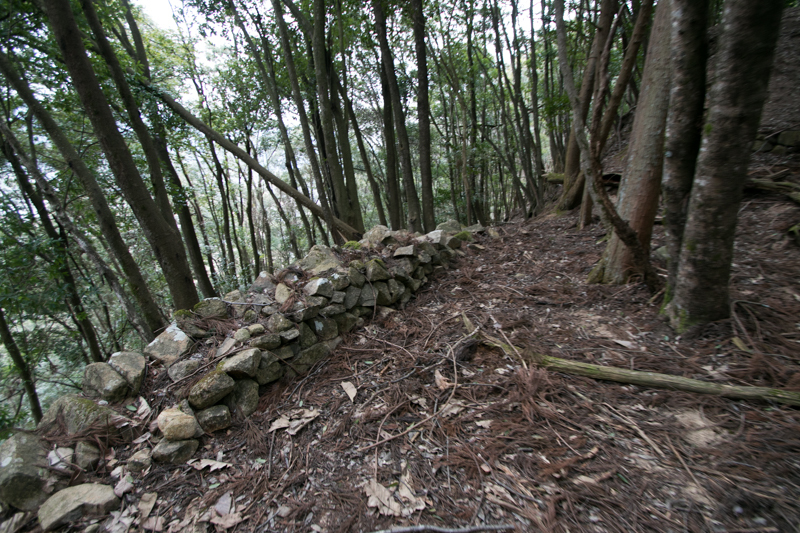 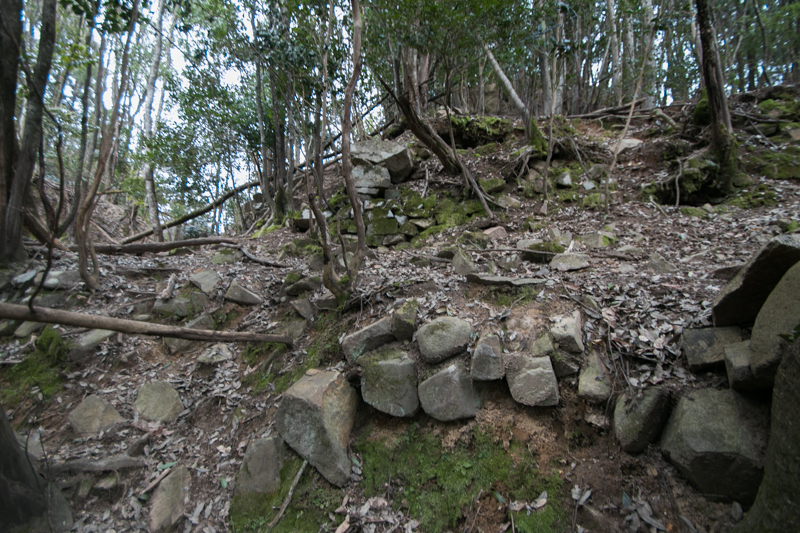 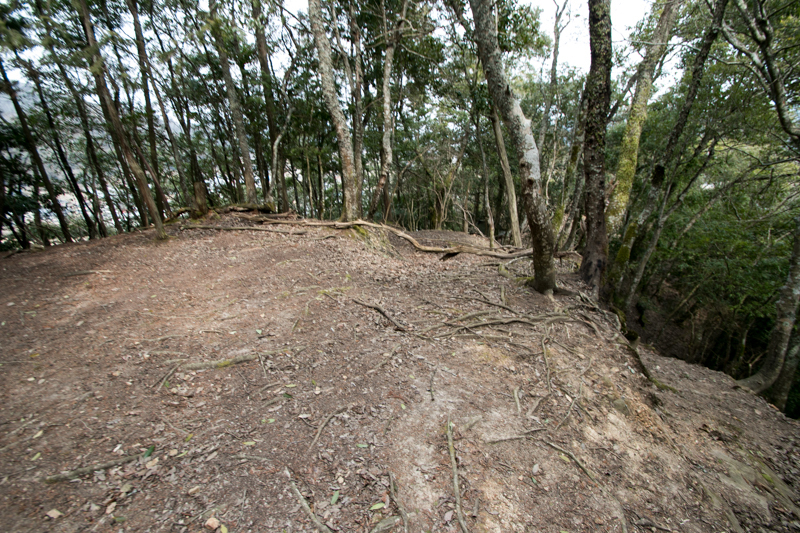 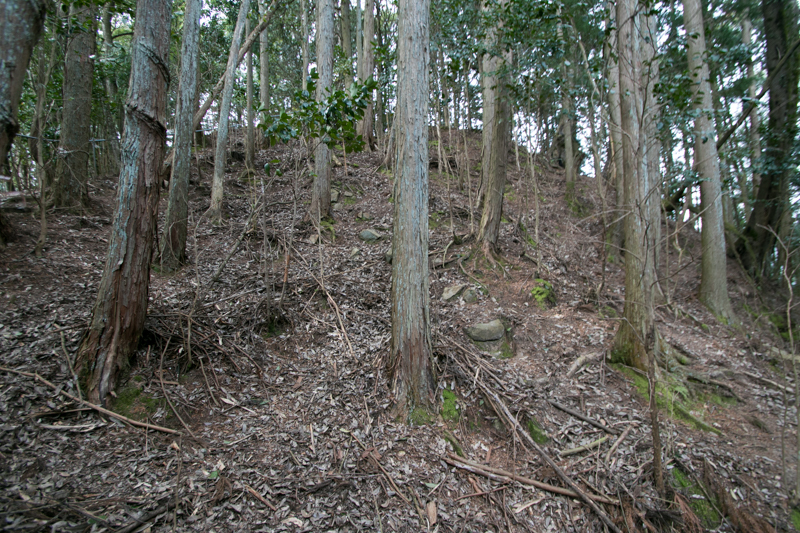 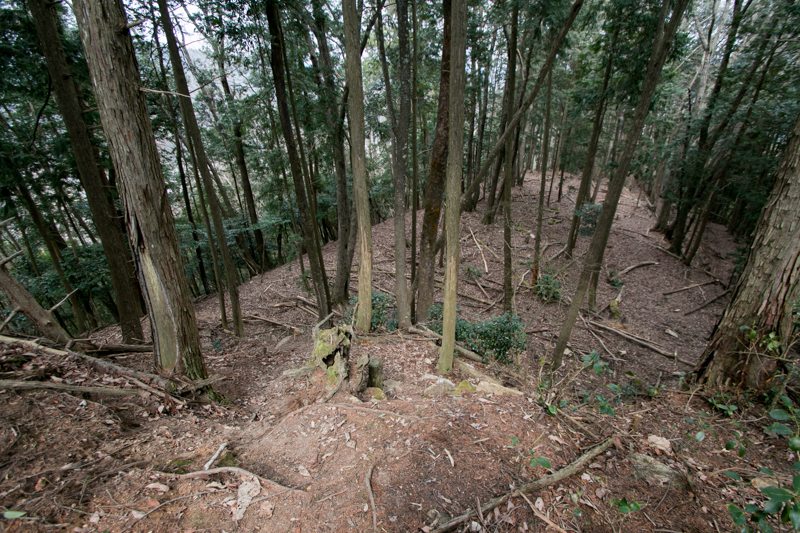 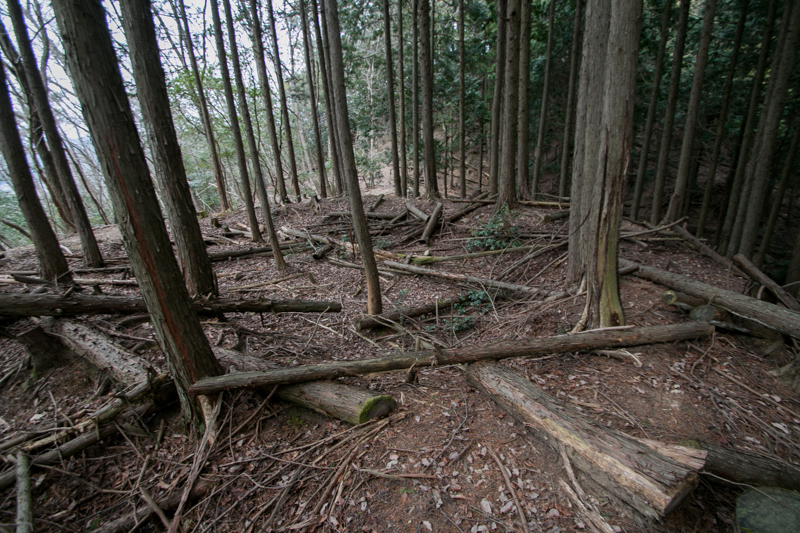 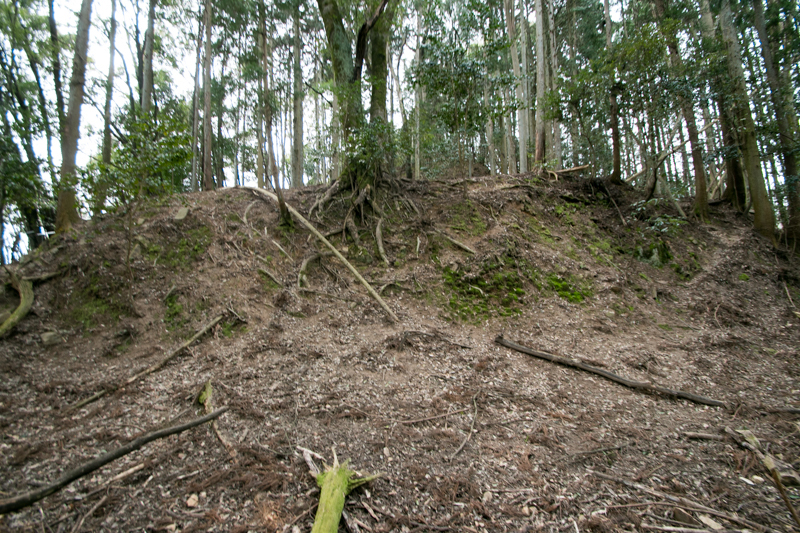 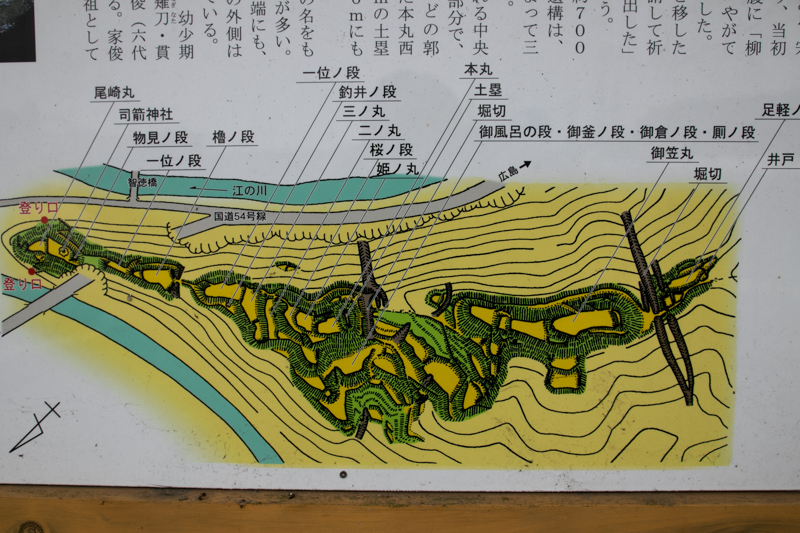 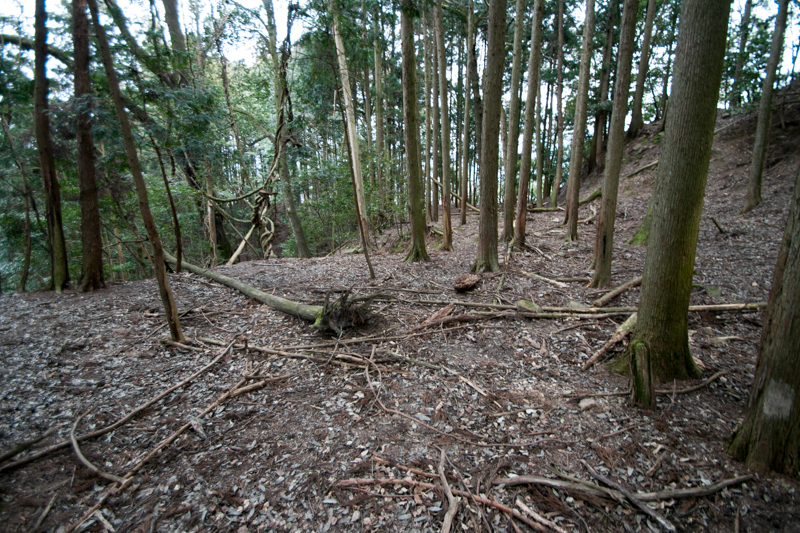 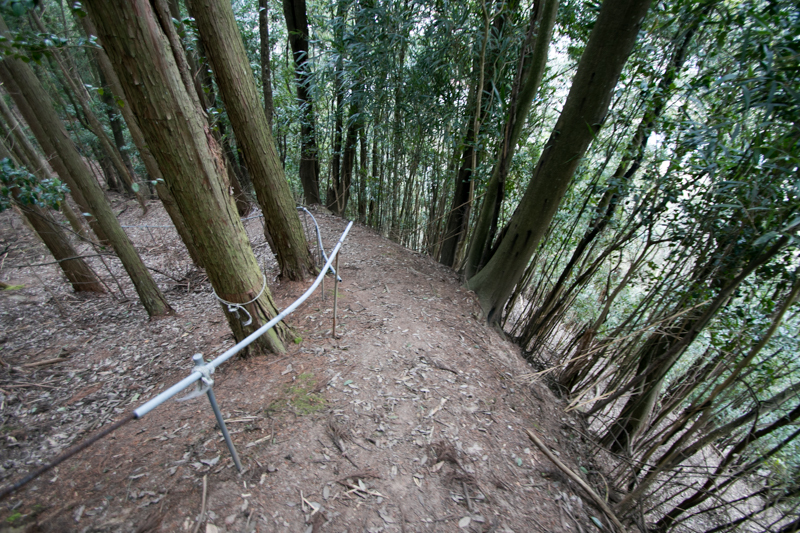 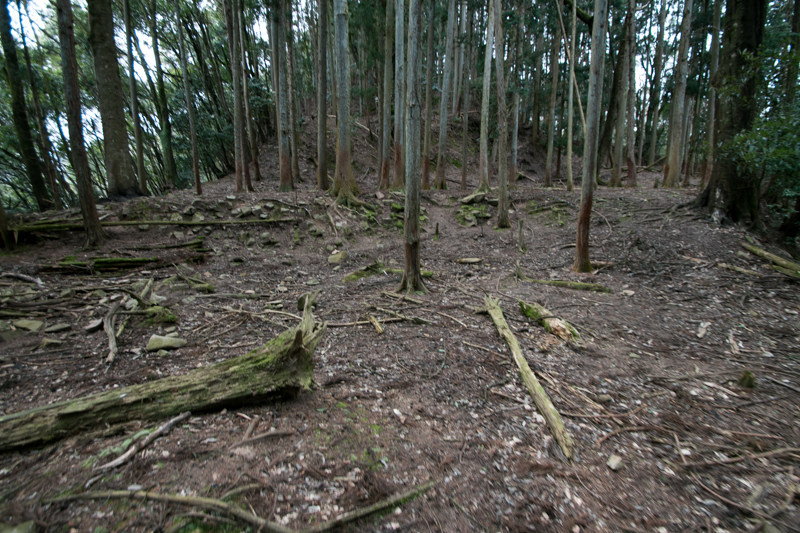 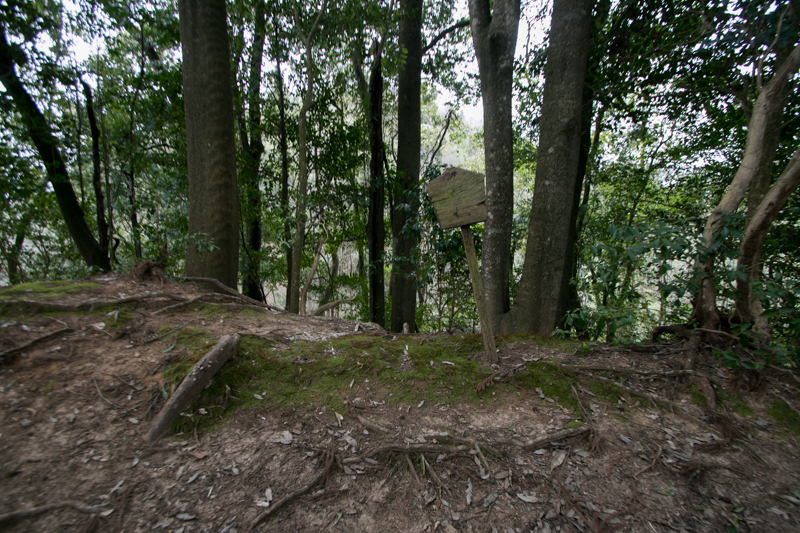 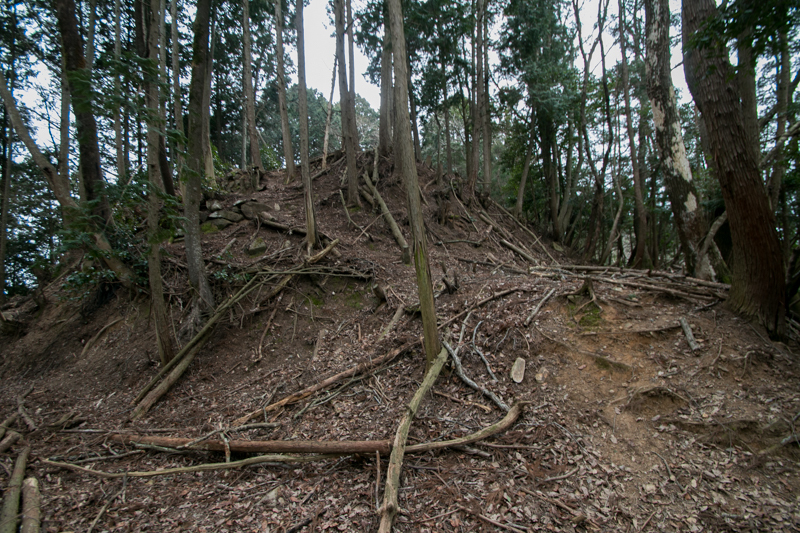 At the east of central area, there are several terraces such as Himenomaru area, secondary area, third area or Yaguranodan area are built to protect the front side of central area. 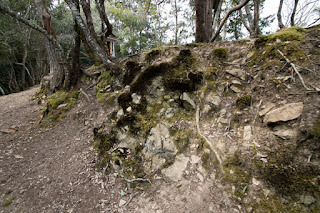 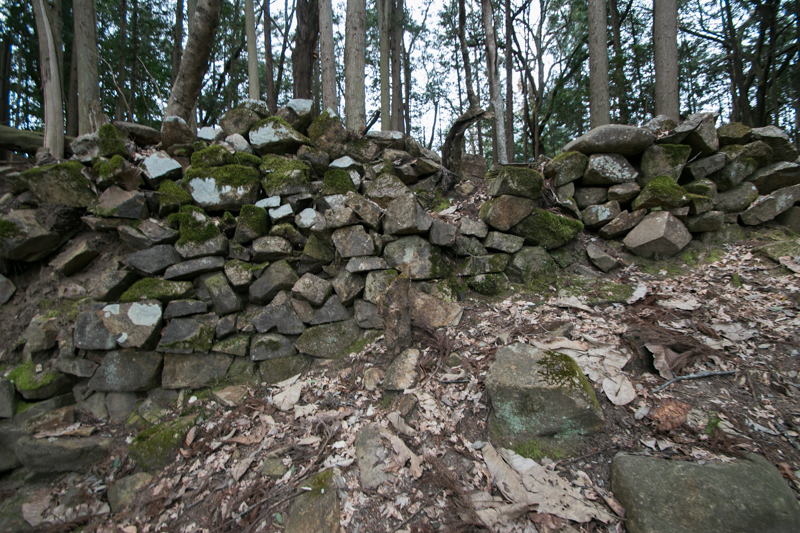 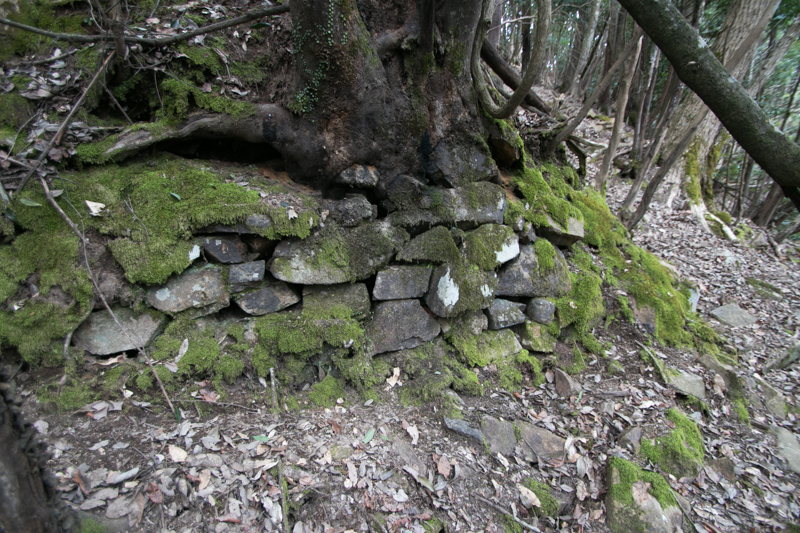 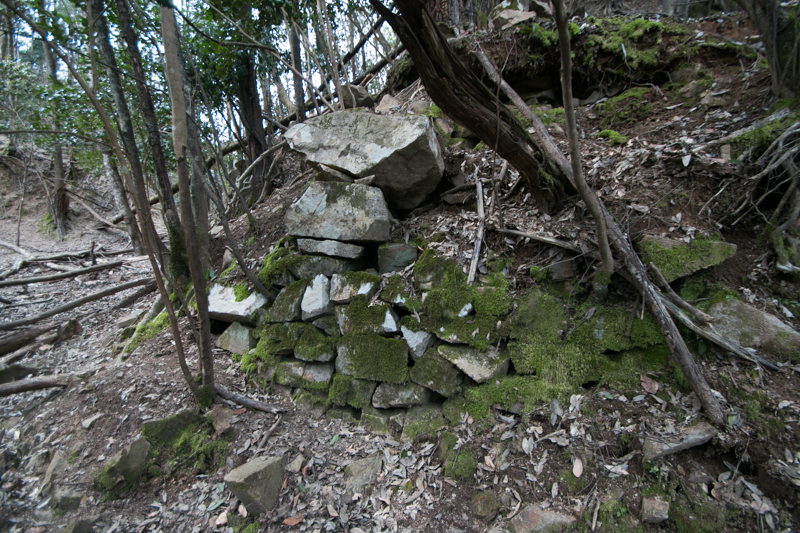 Stone walls partially remain at these core areas. 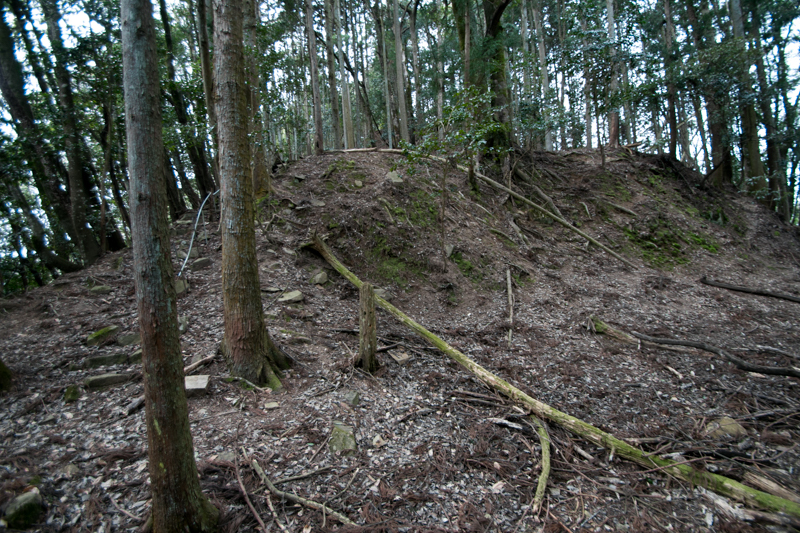 At the east of these core areas, there are front forts such as Monominodan or Ozakimaru area. 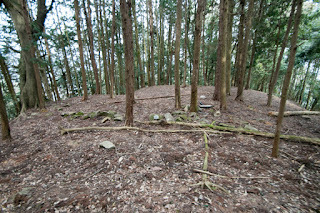 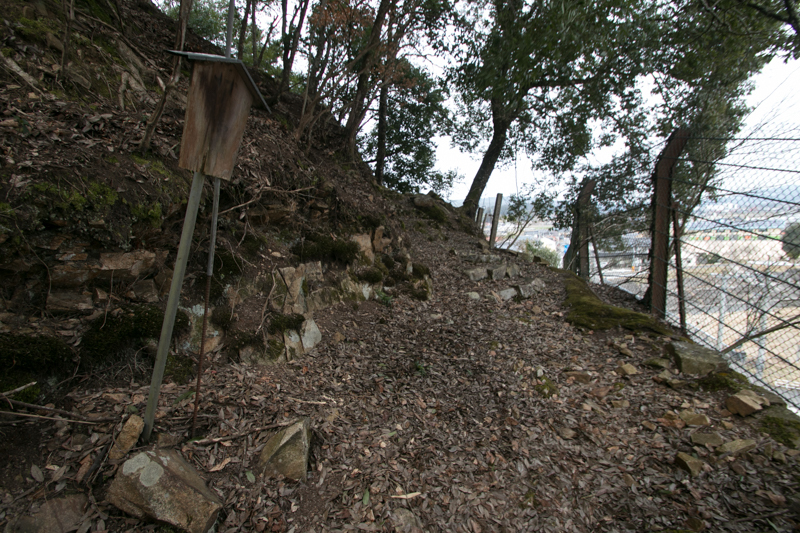 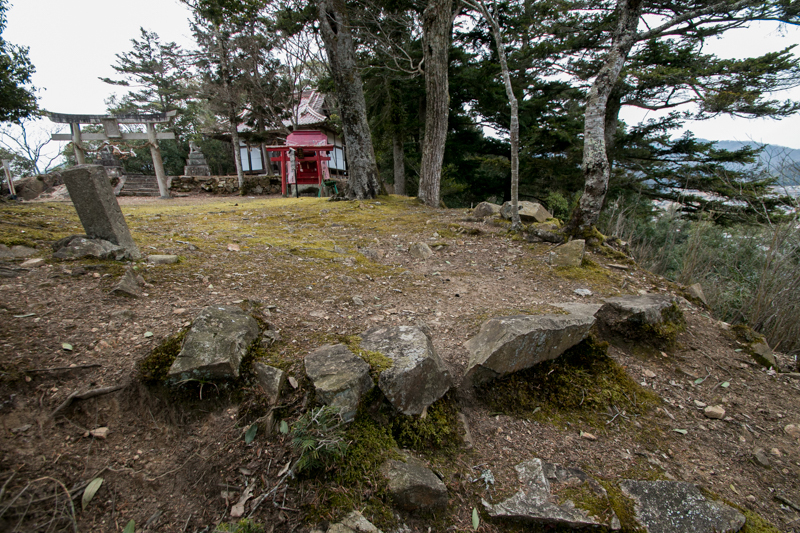 Ozakimaru area is the main gate of this castle and only 30 meter height from hillside. 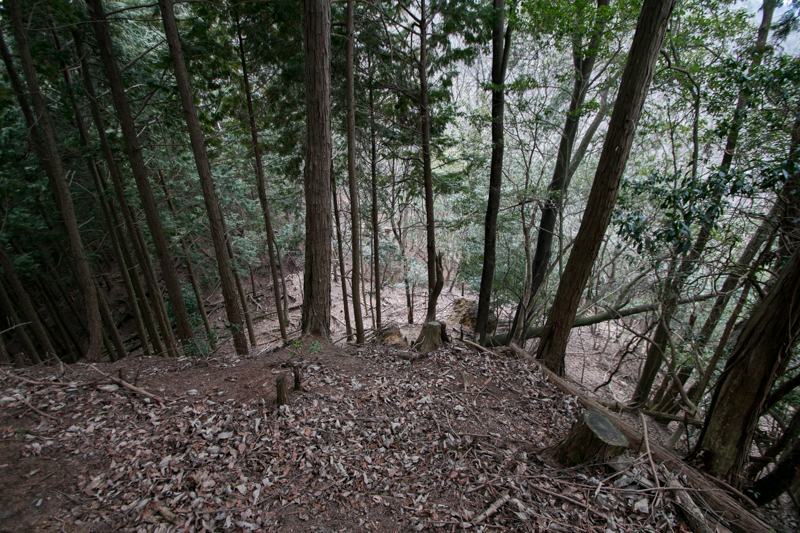 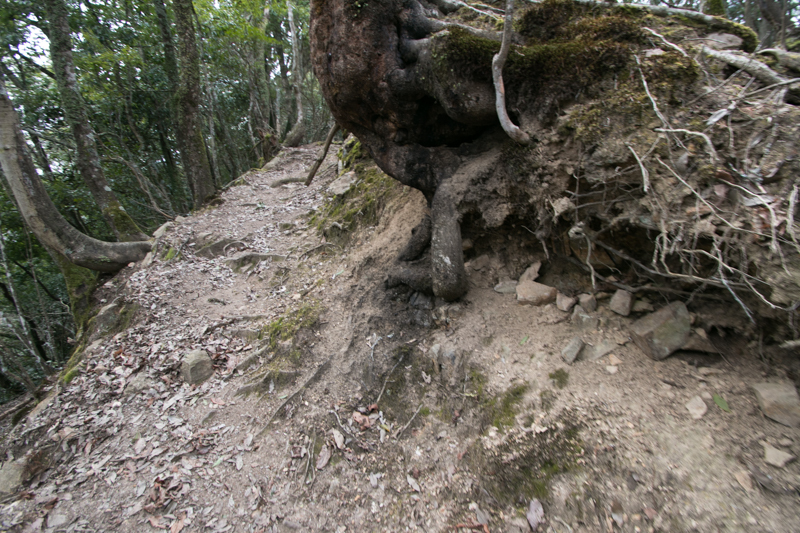 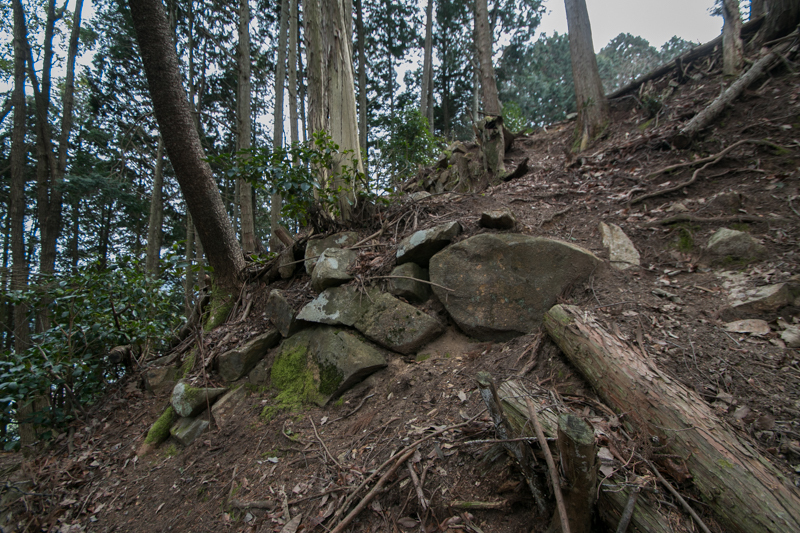 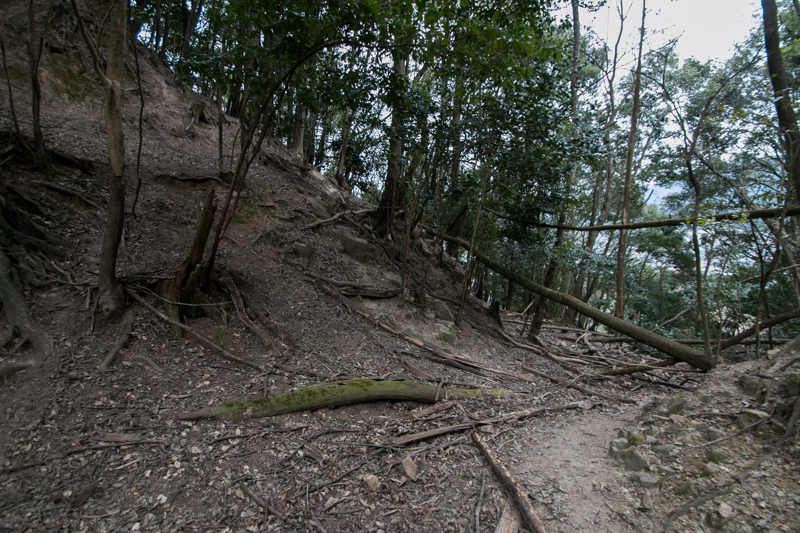 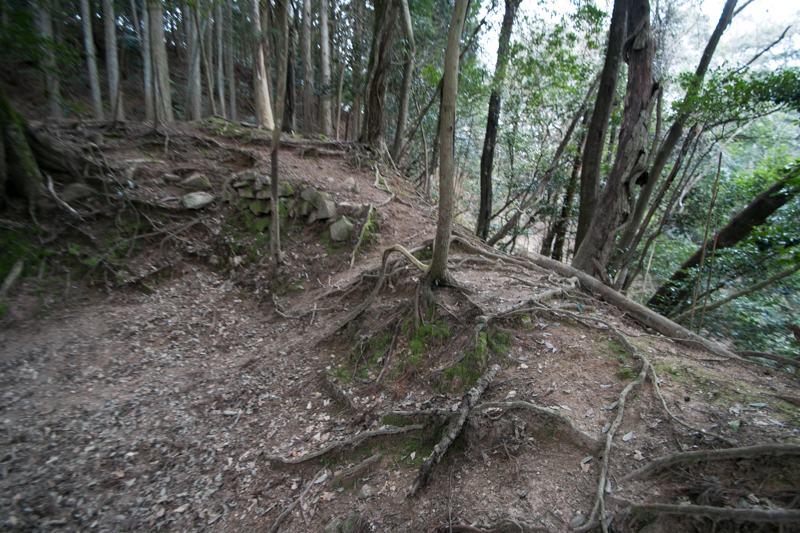 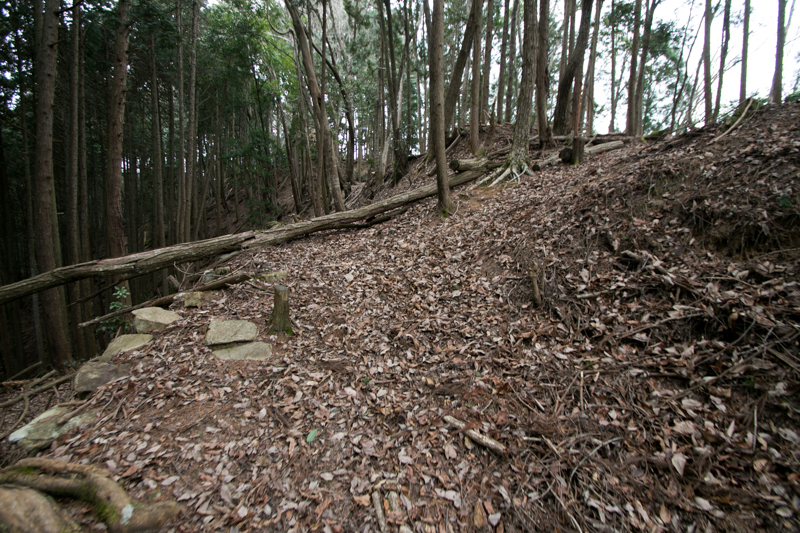 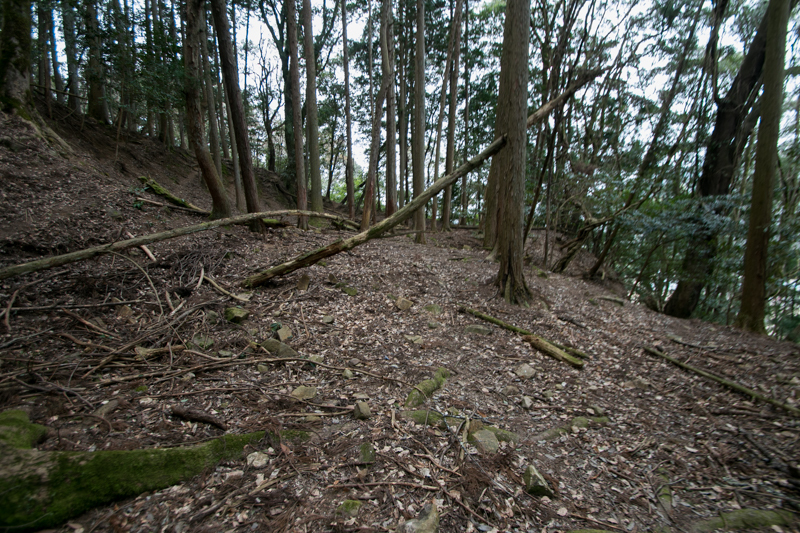 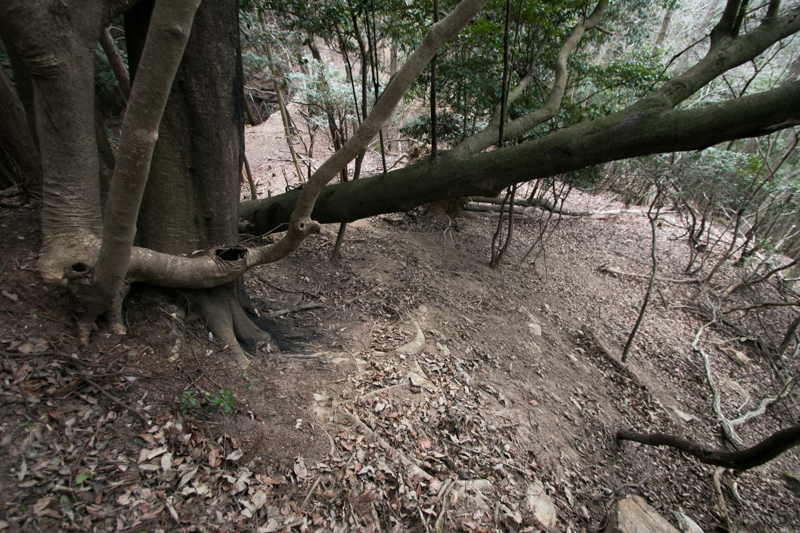 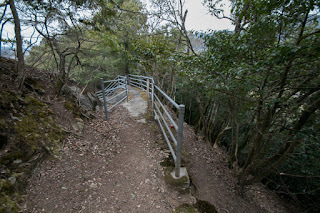 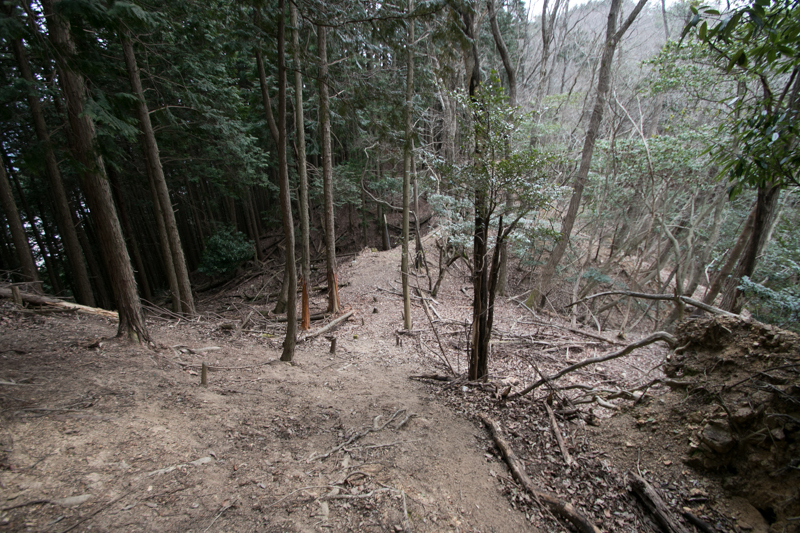 At the middle of Ozakimaru area and Monominodan area there is a narrow path sandwiched by cliffs and works as a natural gate. 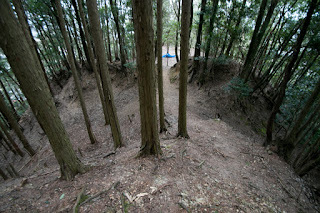 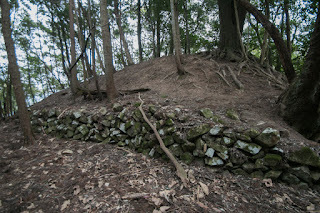 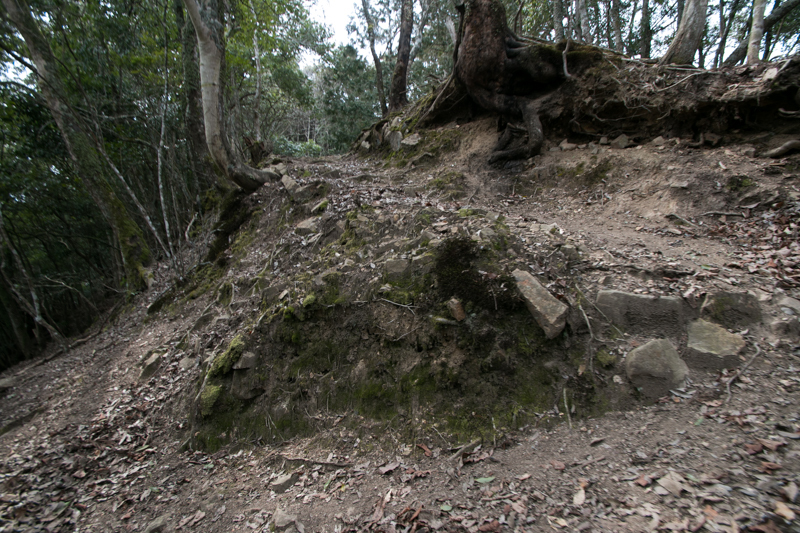 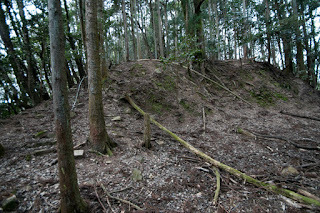 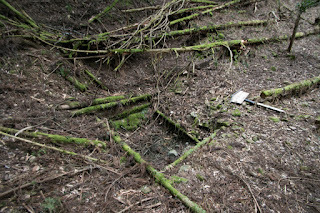 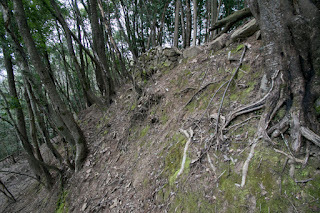 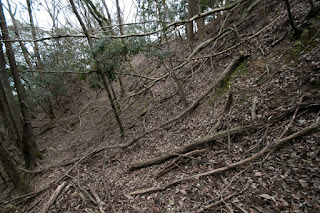 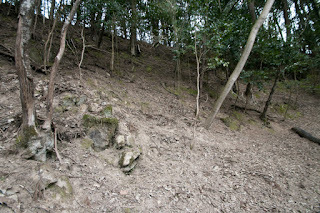 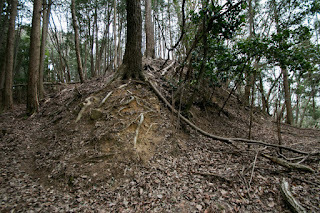 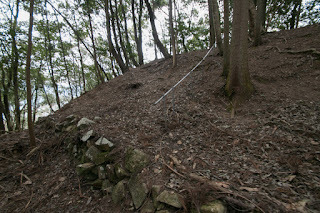 At the backside of central area, ahead of deep dry moat of 15 meter depth, there are inner part built at small peak. 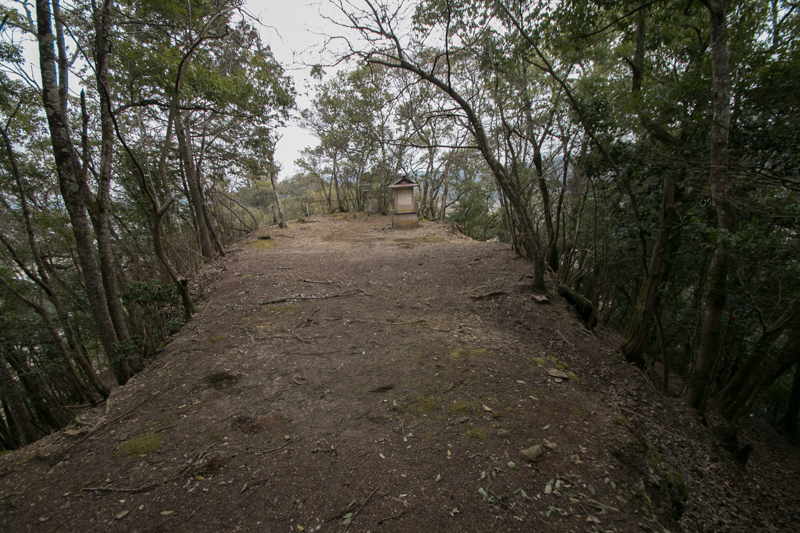 Main body of this inner part of Mikasamaru area which is also a 50 meter long and 15 meter wide rectangular area equips watchtower at its western side. 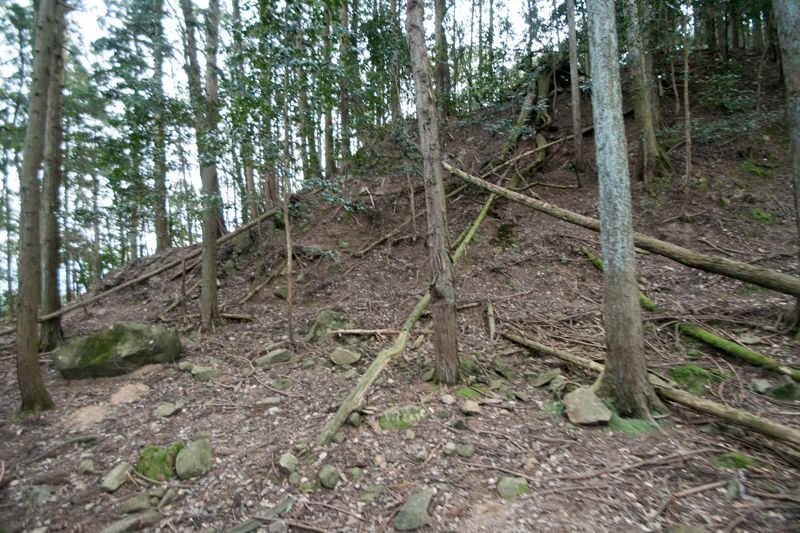 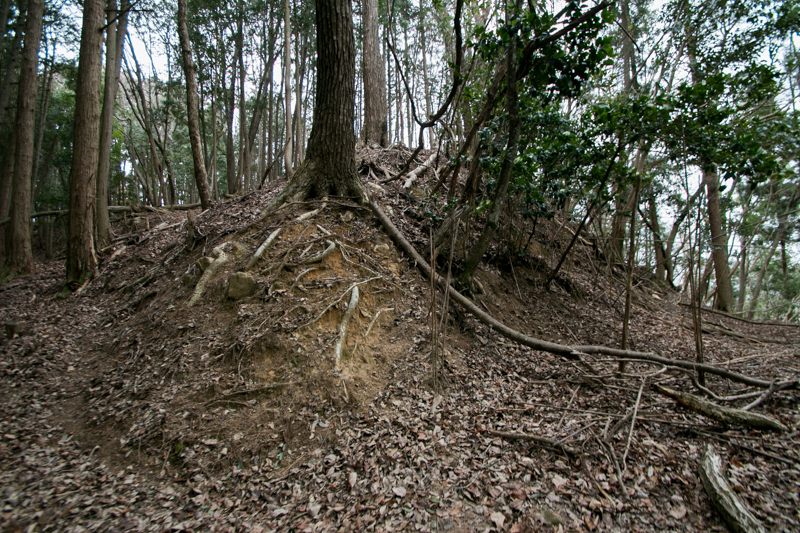 There are several terraces at the eastern slope of this peak, which spread from hilltop to halfway and partially have stone walls. 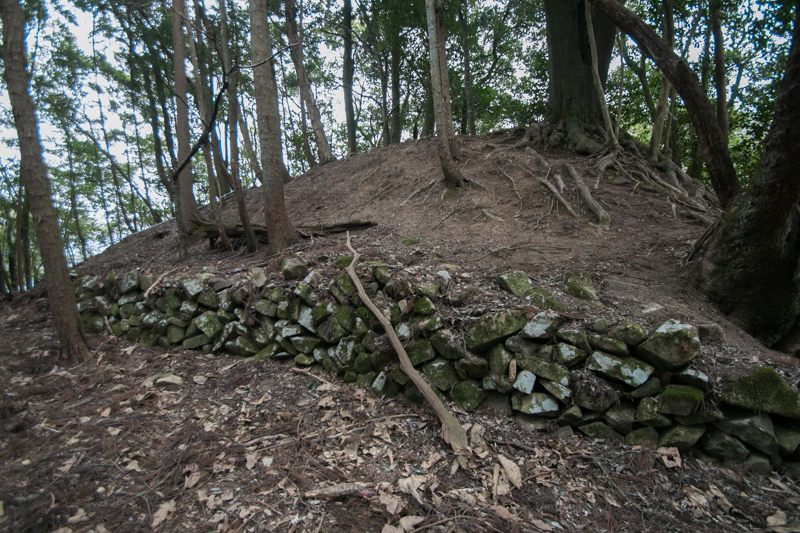 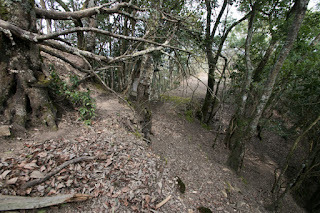 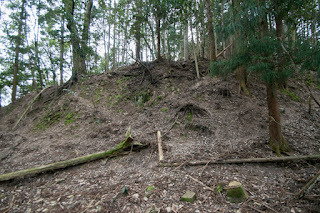 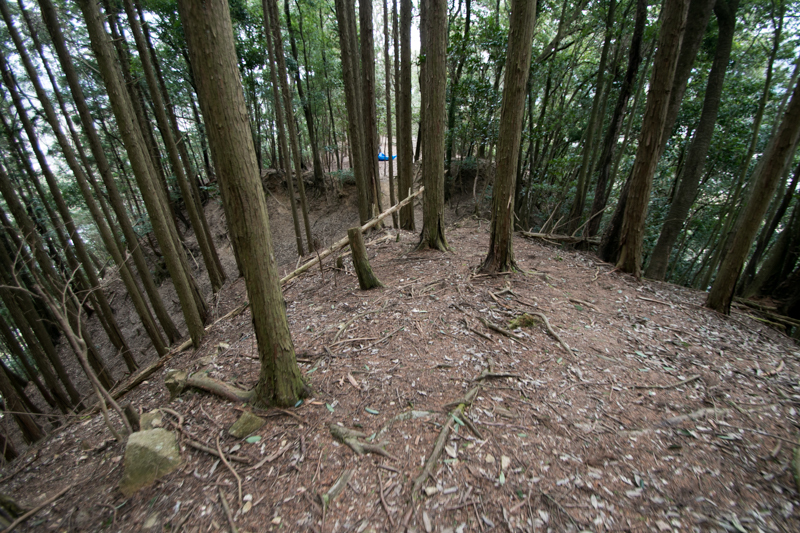 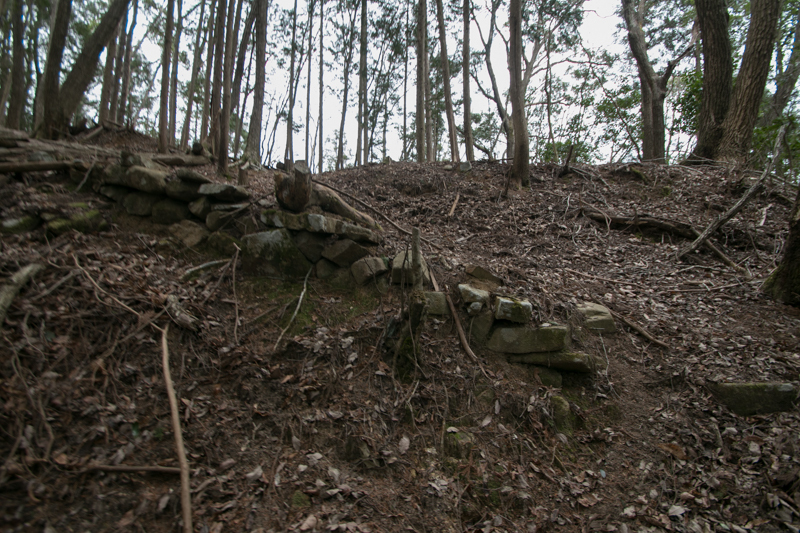 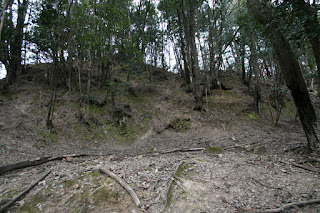 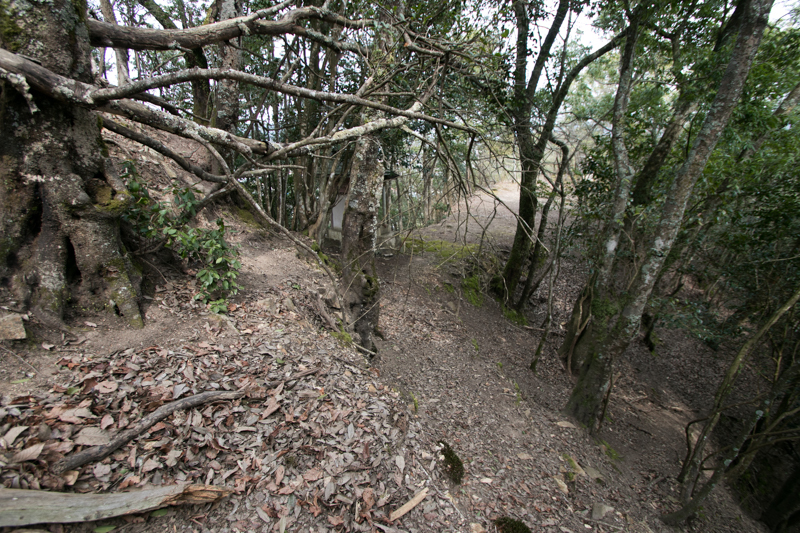 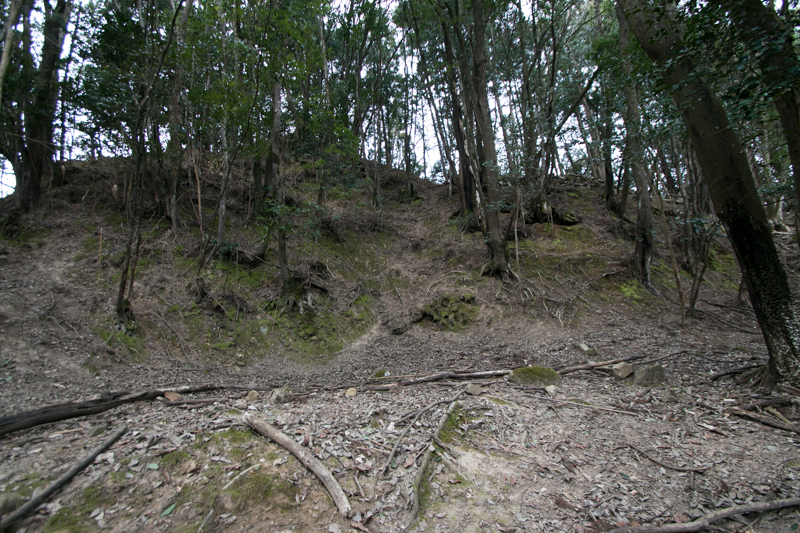 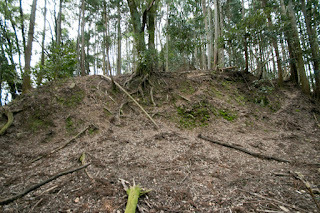 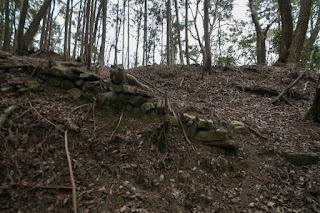 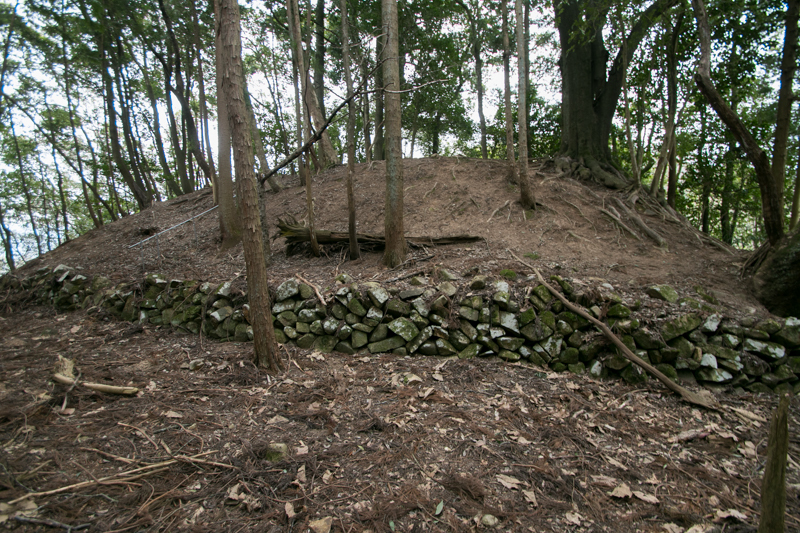 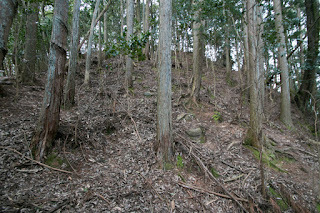 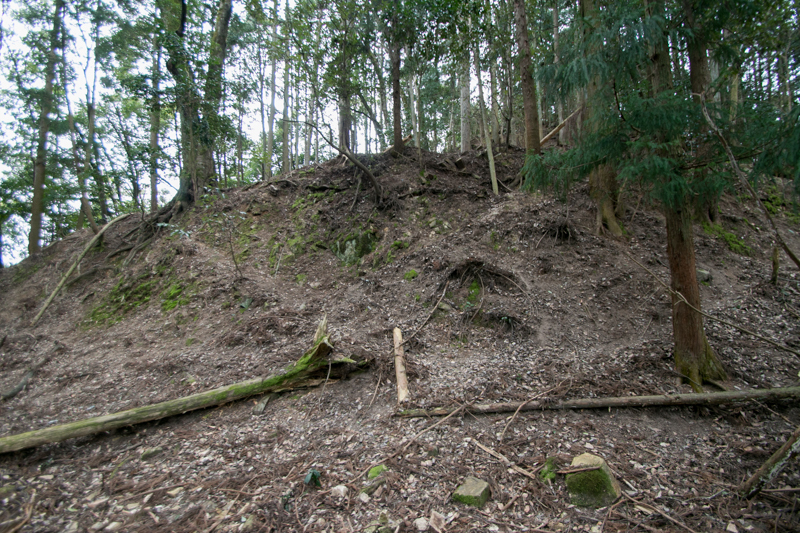 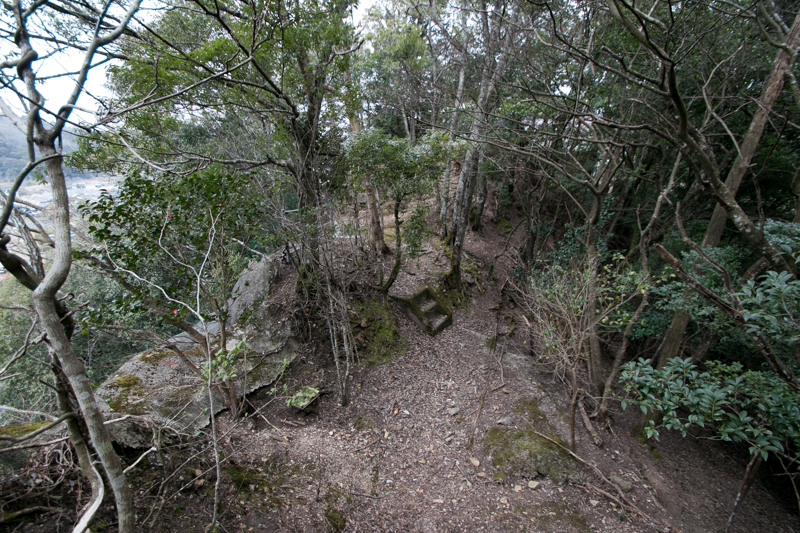 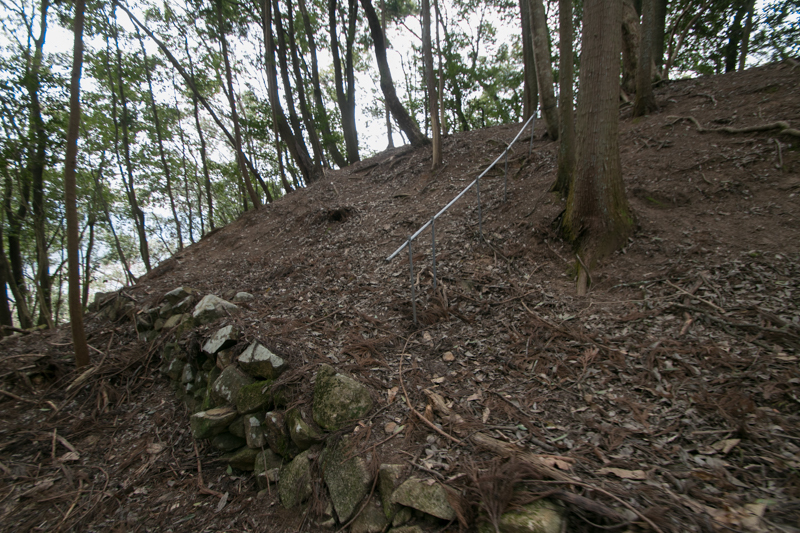 The western sidewall of Mikasamaru area is also separated by deep dry moat, and ahead of this is a backside gate of the castle with small hollow, which might work both for water source and water moat. 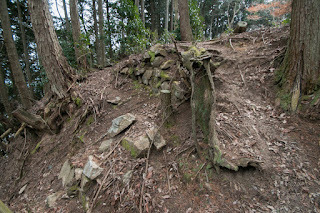 Total length of the castle is about 700 meter long, and winding terrain of the castle at narrow ridge exactly seems the back of the dragon. 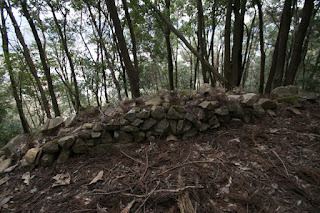 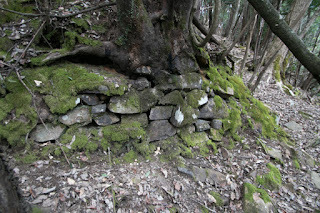 Half broken old style stone walls remain here and there looks like scales of the dragon. 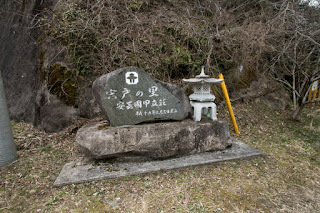 Takaie Shishido accompanied with Motoharu Kikkawa (1530-1586), the second son of Motonari Mouri and who was the regional commander of Sanin region, and activated at many battles. 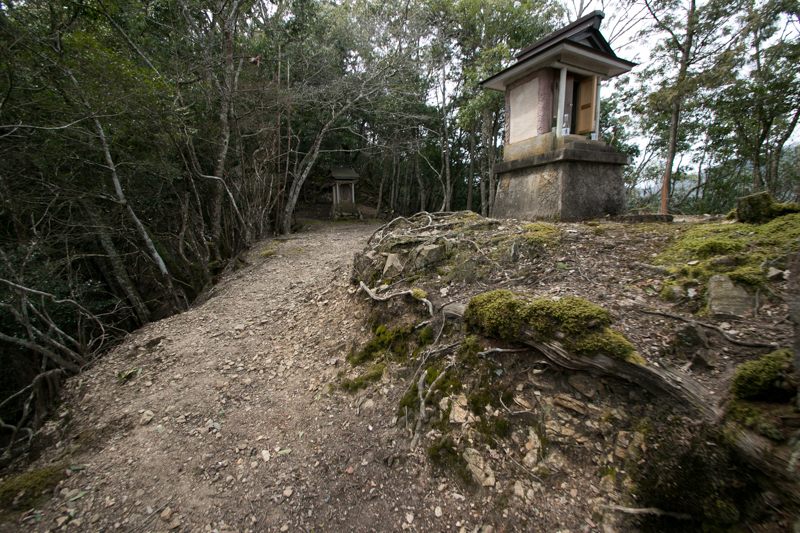 Along with the expansion of Mouri clan, the territory of Shishido clan increased to 150,000 Koku (unit of rice cultivation), which was regarded as a large feudal lord at Edo era. 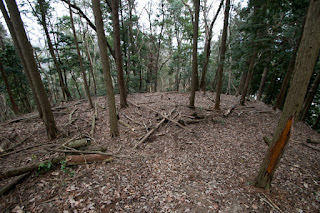 Exactly Shishido clan was at the moment of rising dragon, same as the shape of their main base. 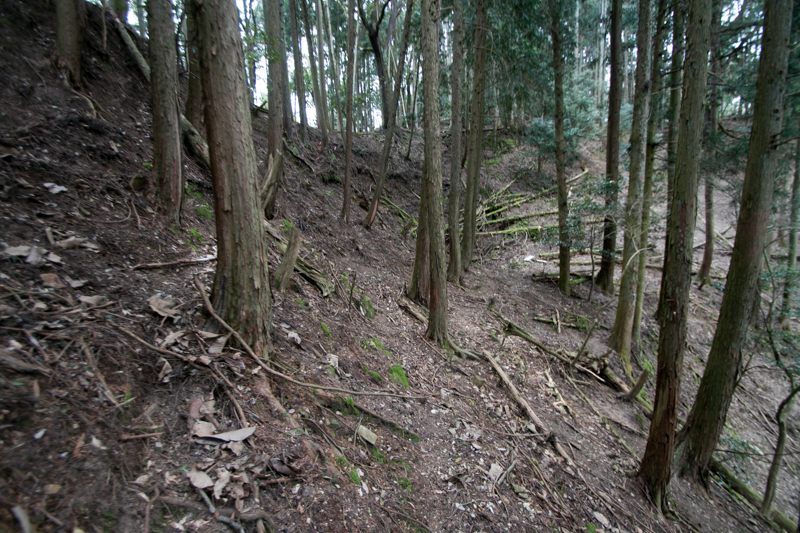 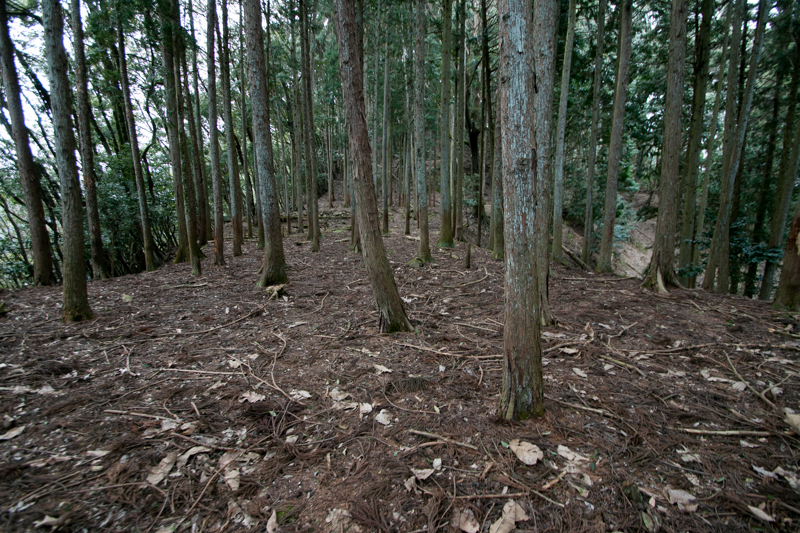 However, in 1600, as a result of the battle of Sekigahara, Mouri clan barely escaped extinction but lost most part of its territory including Aki province. 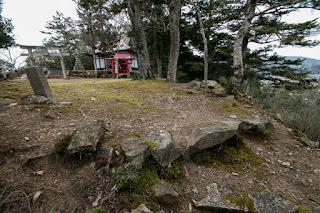 Along with Mouri clan, Shishido clan moved to Suo province but kept its status as the first positioned retainer of Mouri clan. 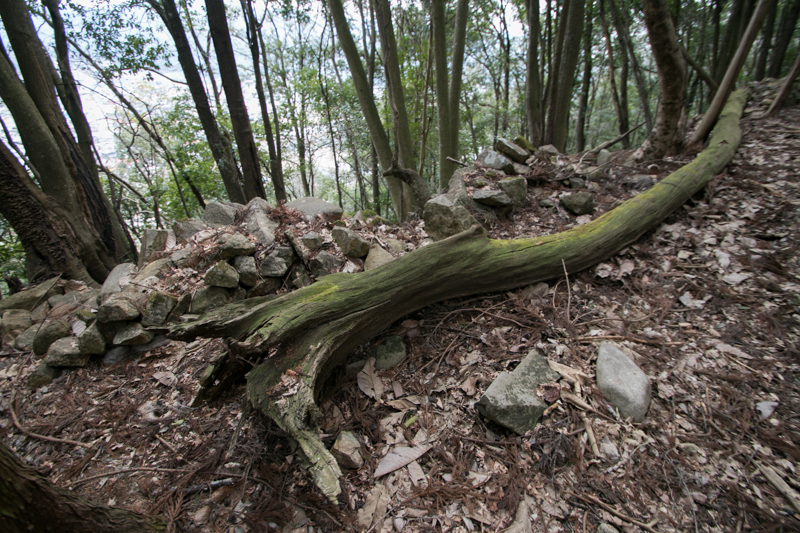 The dragon flew away to the sky, and only empty shell remains as a ruin of the castle. 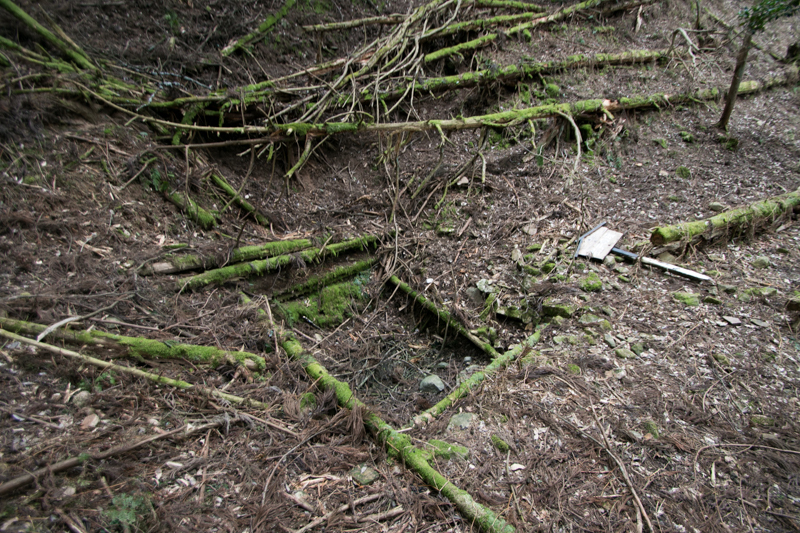 Now all building was lost but structure of the castle well remain along with the ridge, with partially remaining ruin of stone walls. 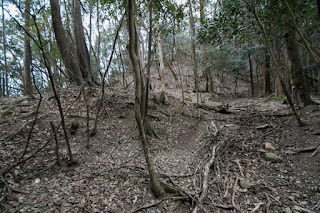 Approach to the castle is relatively easier than other medieval castle, but layers of terraces at different heights is a powerful one, along with deep tall watchtower basement and deep dry moats. 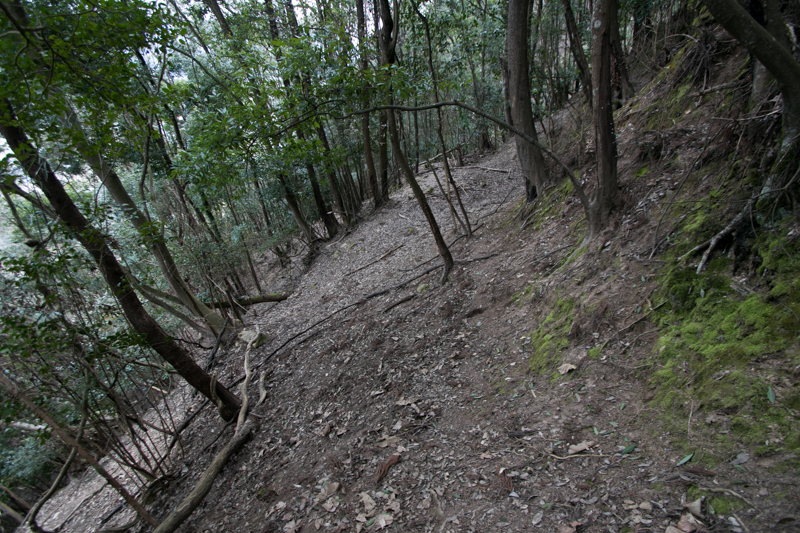 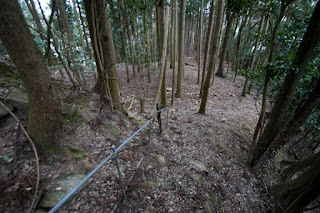 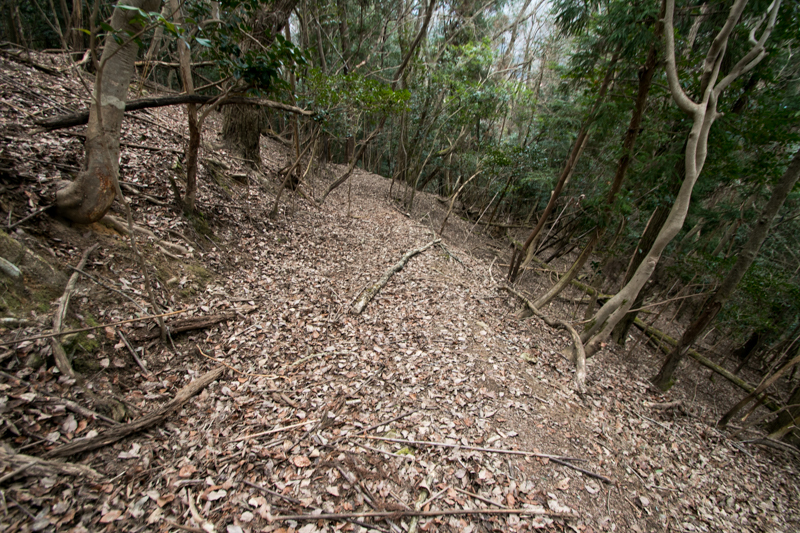 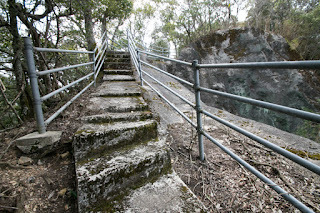 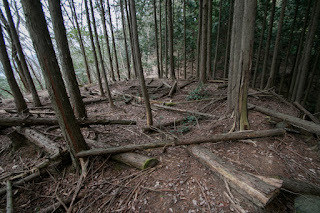 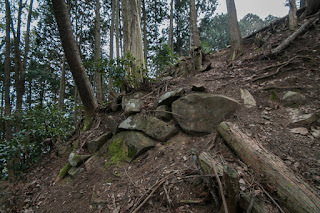 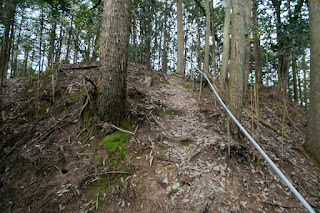 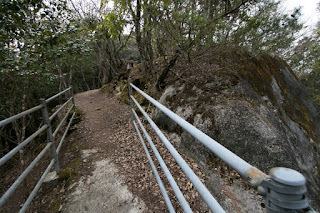 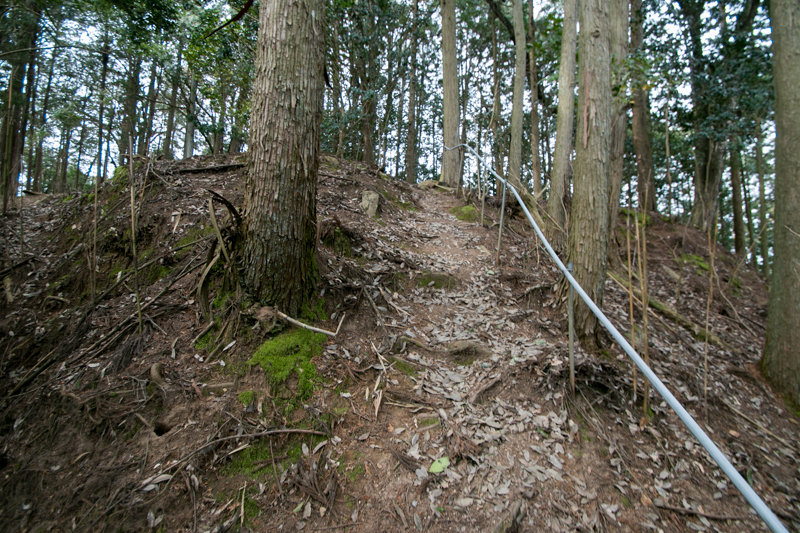 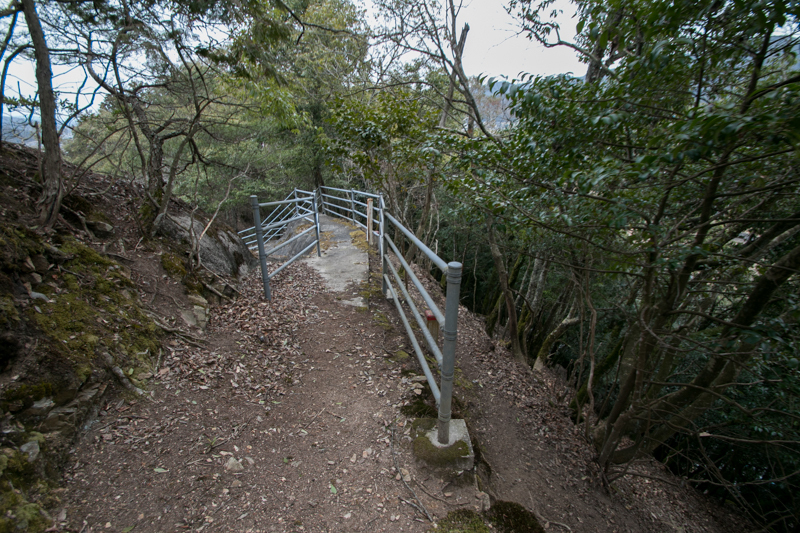 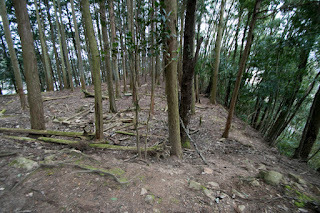 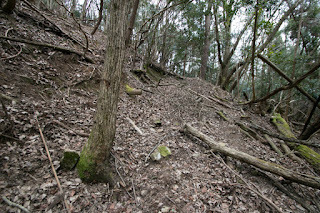 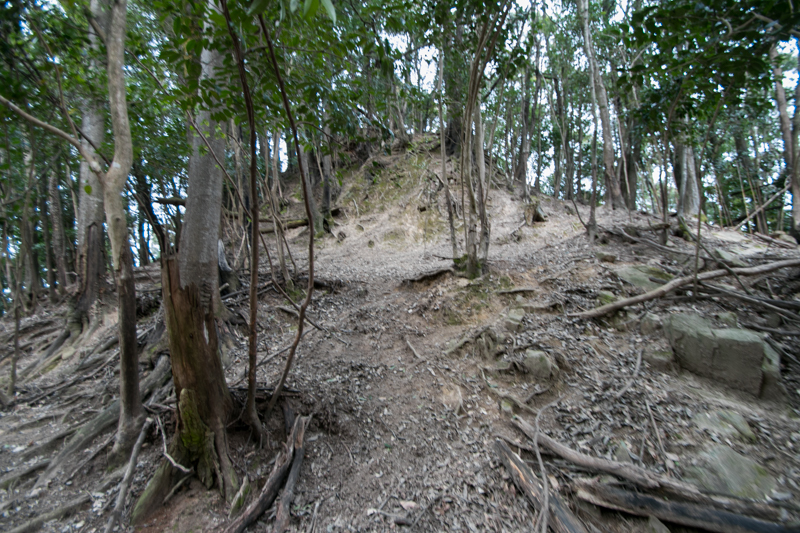 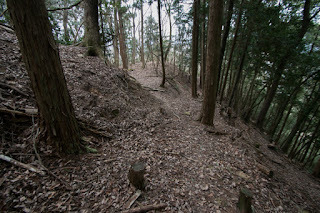 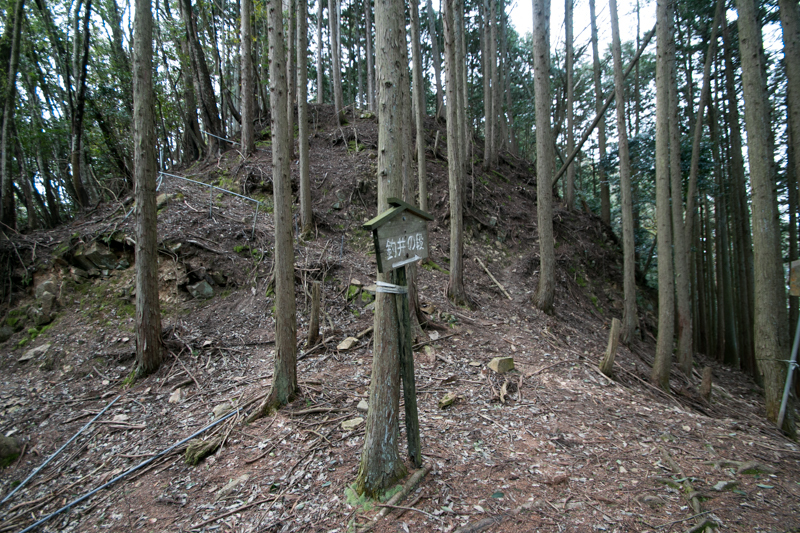 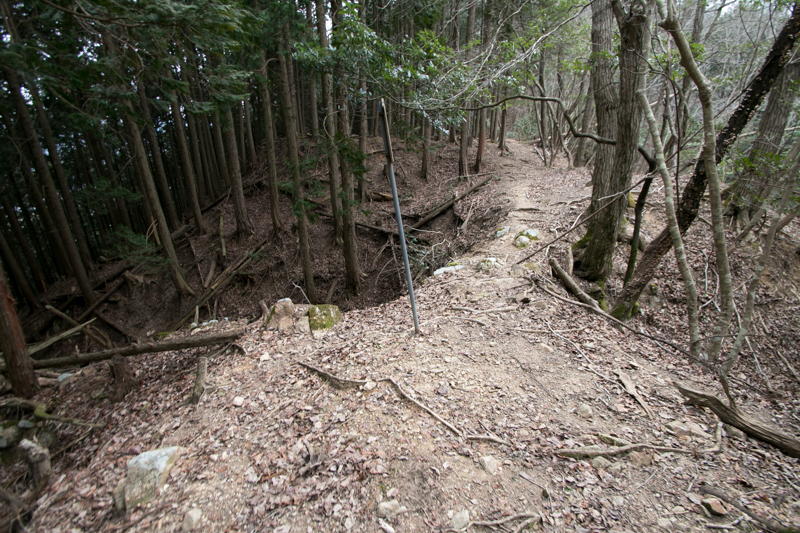 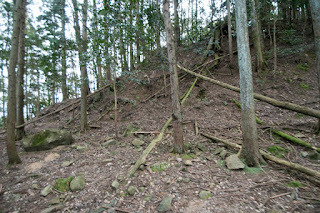 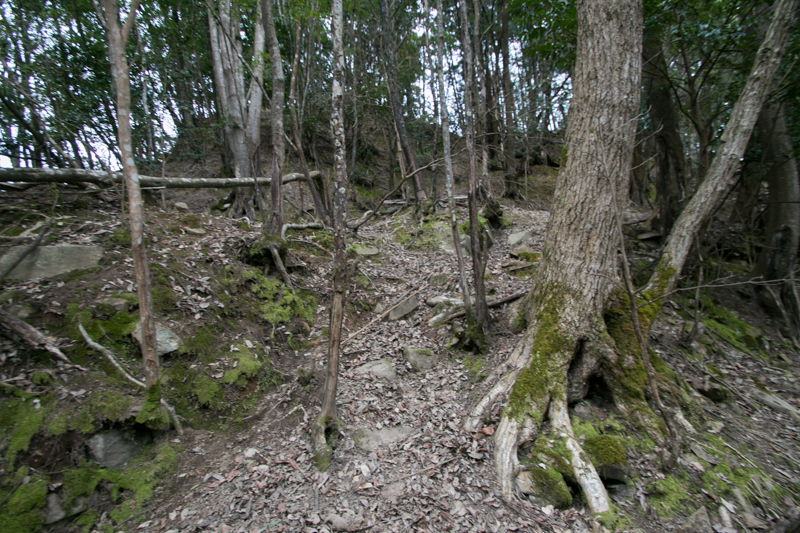 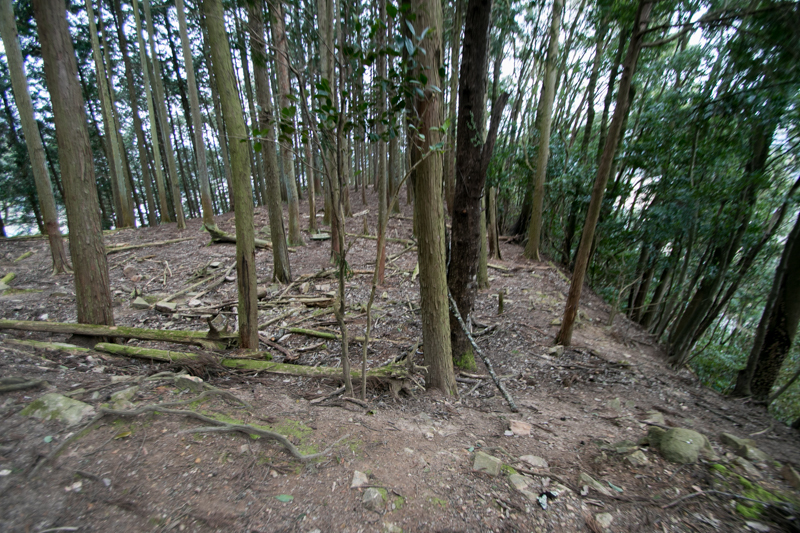 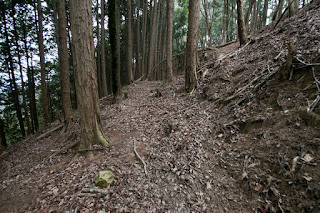 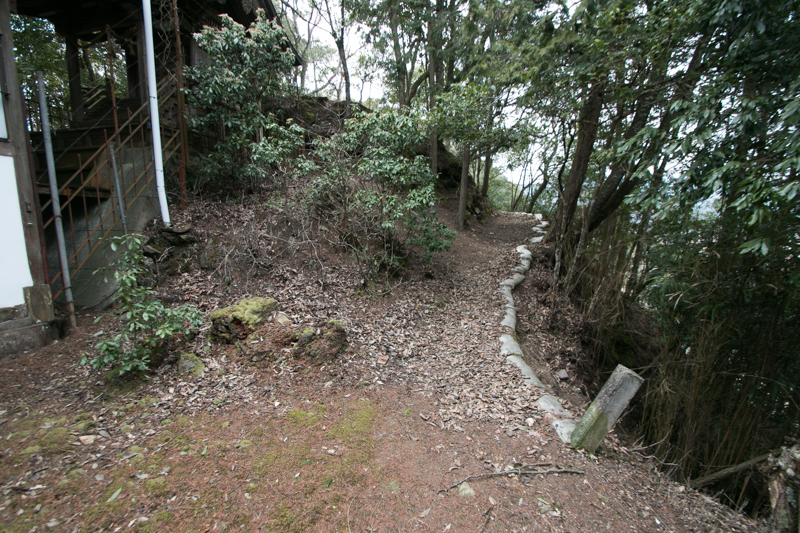 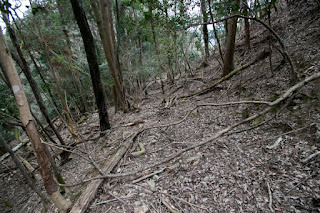 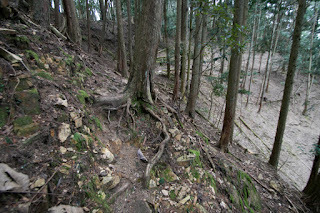 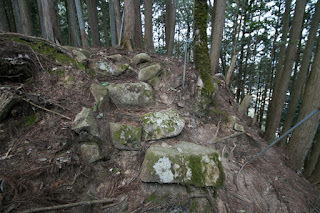 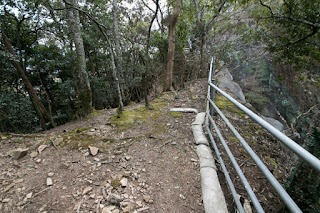 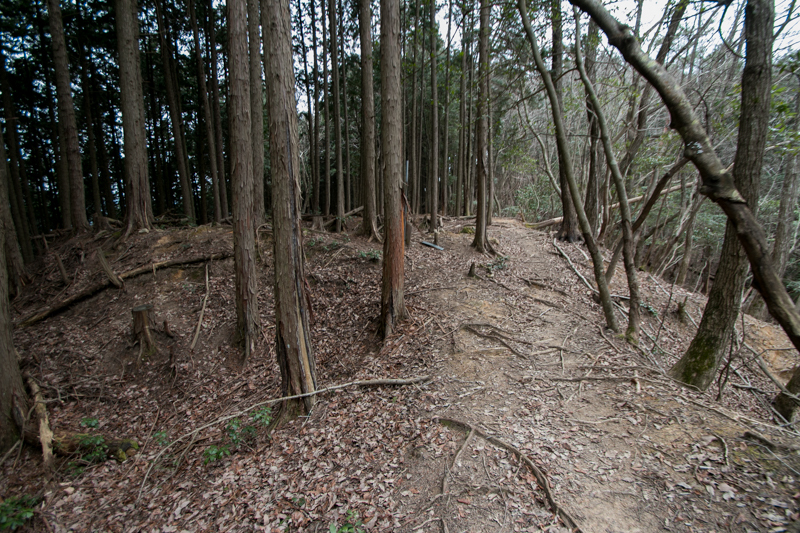 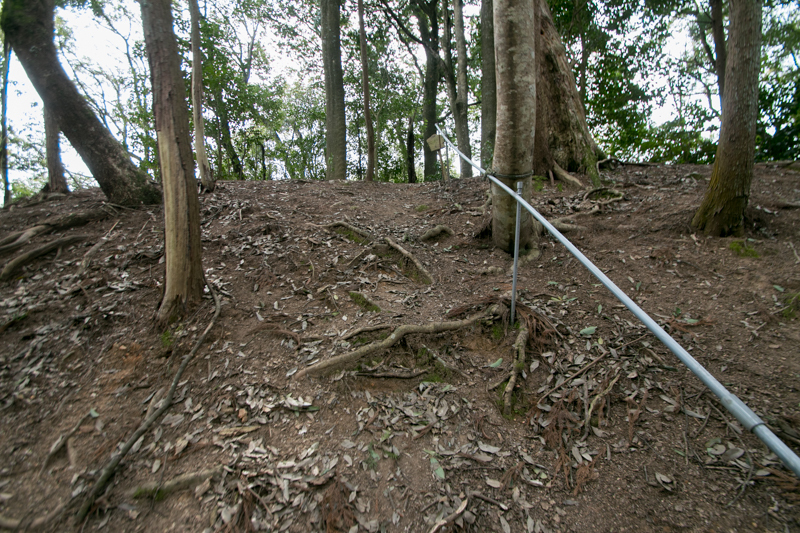 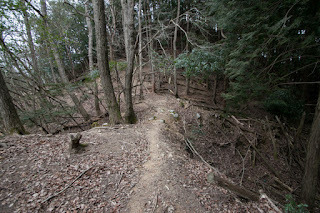 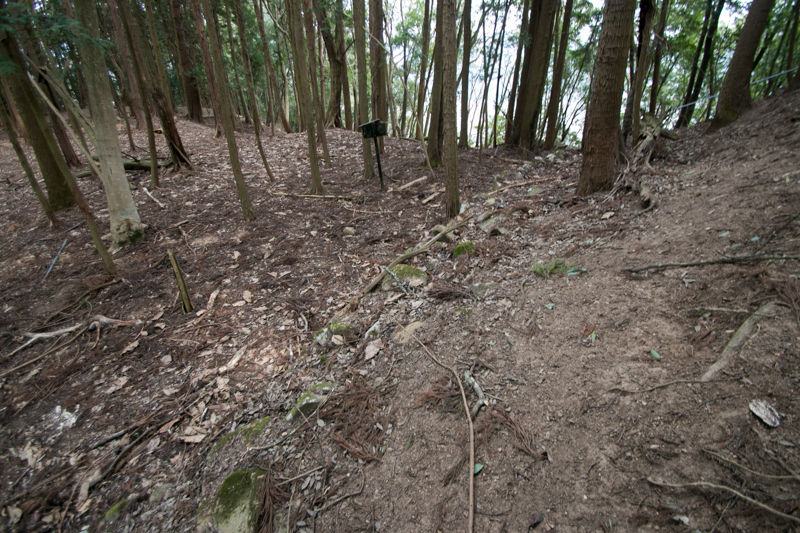 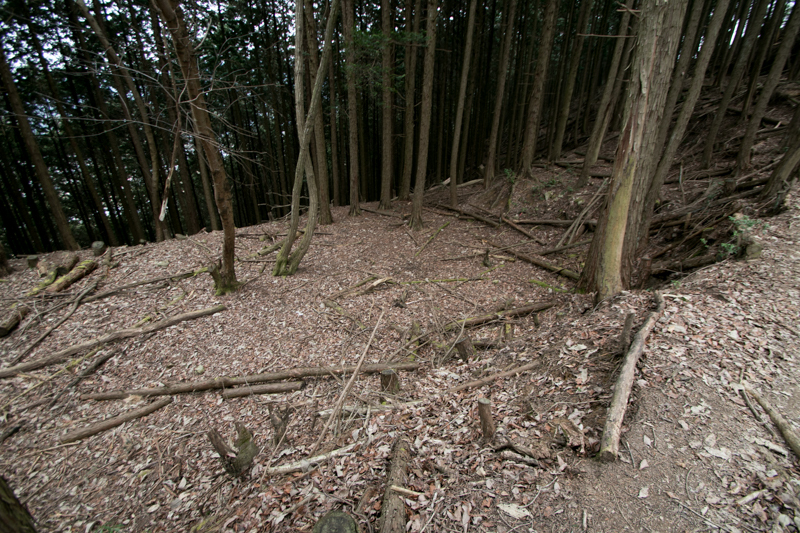 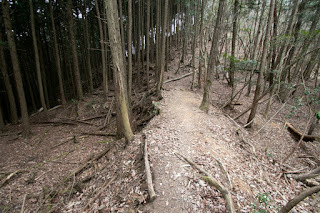 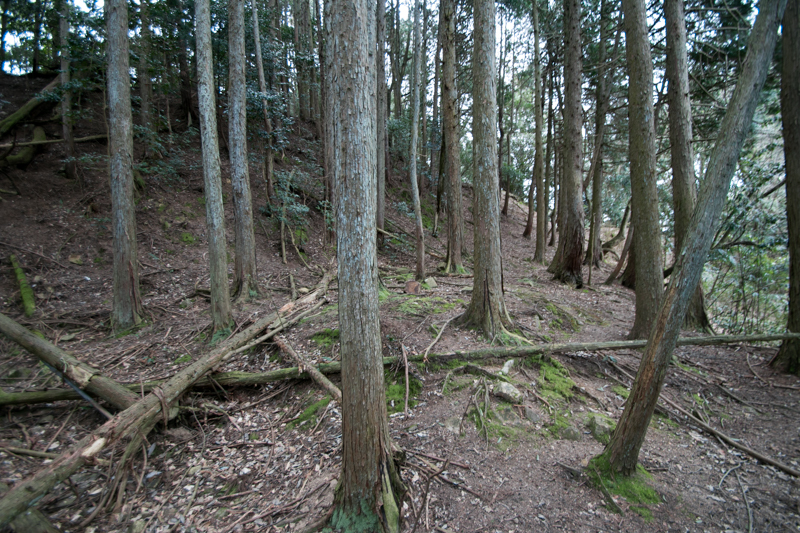 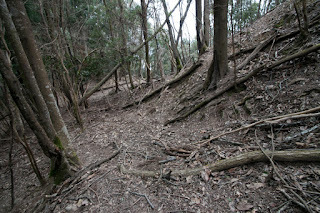 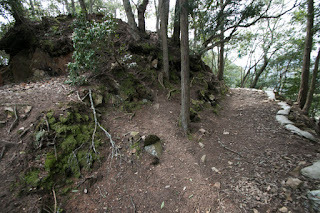 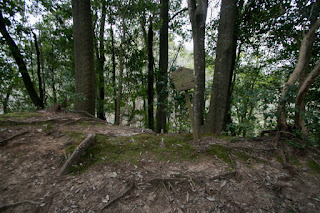 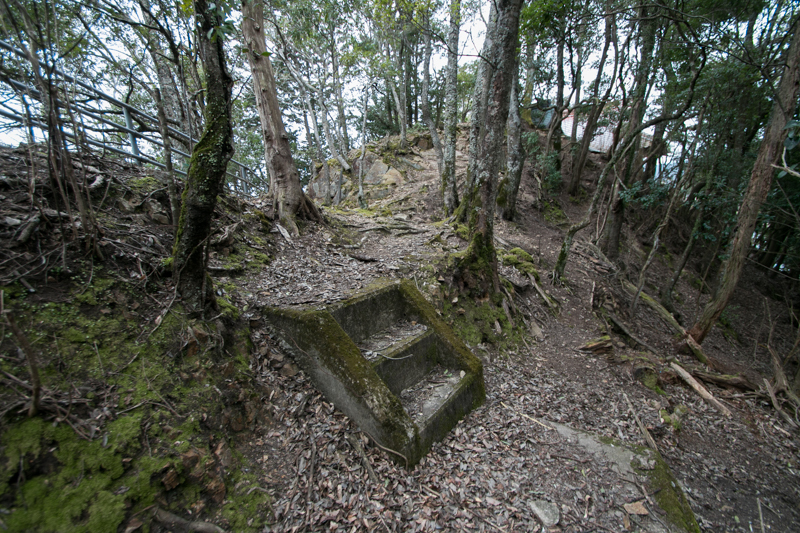 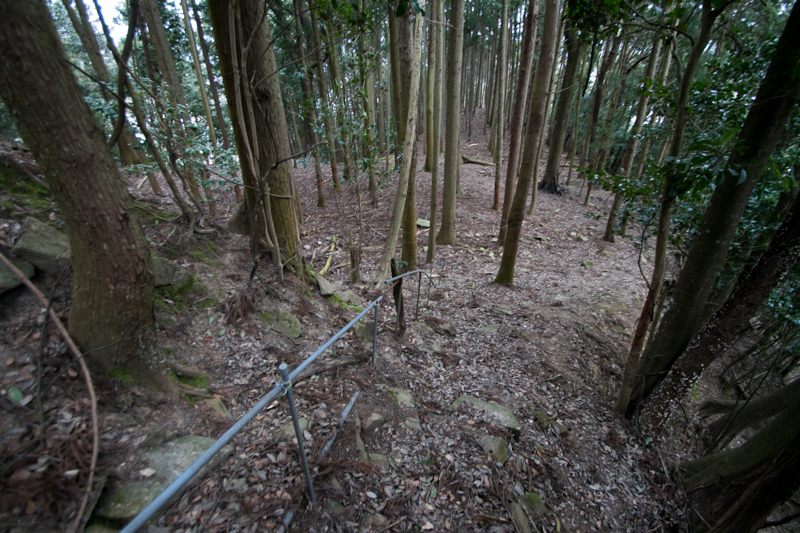 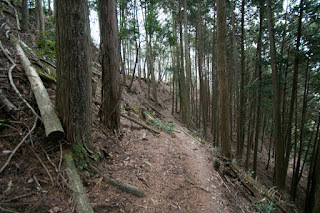 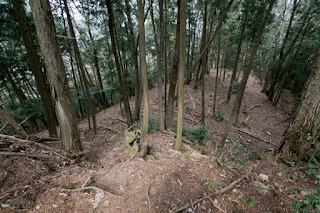 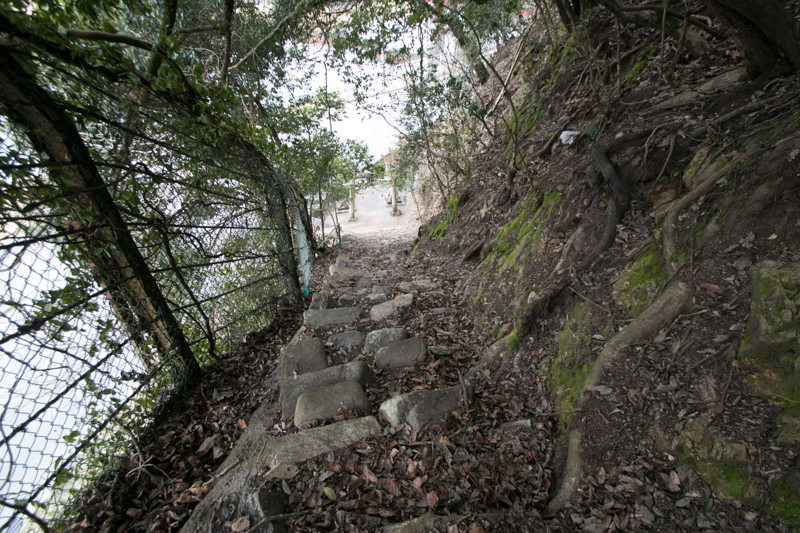 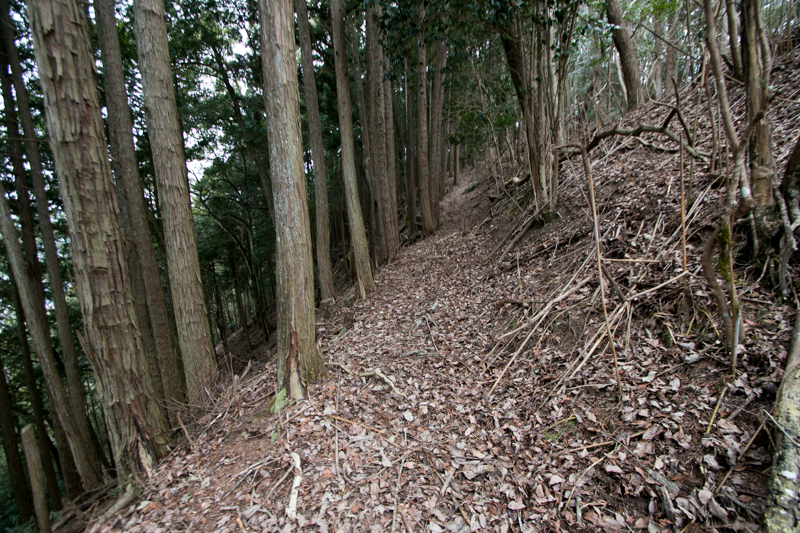 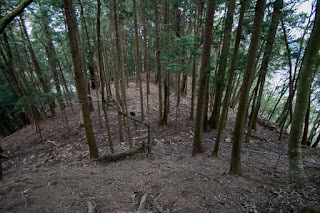 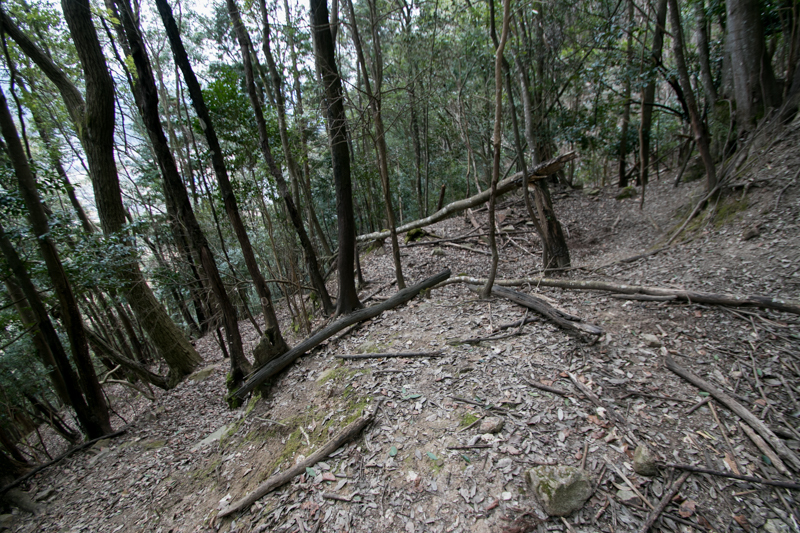 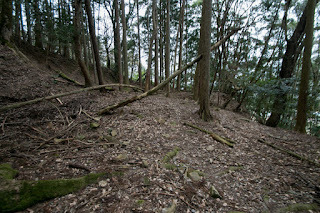 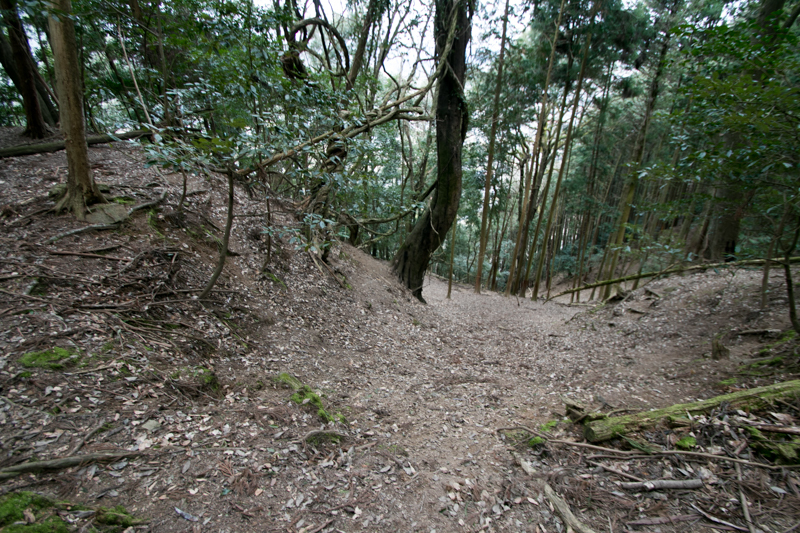 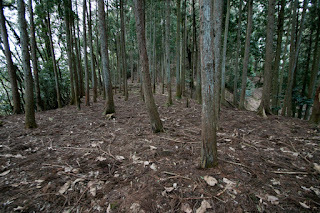 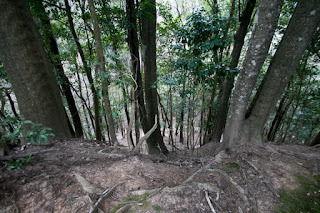 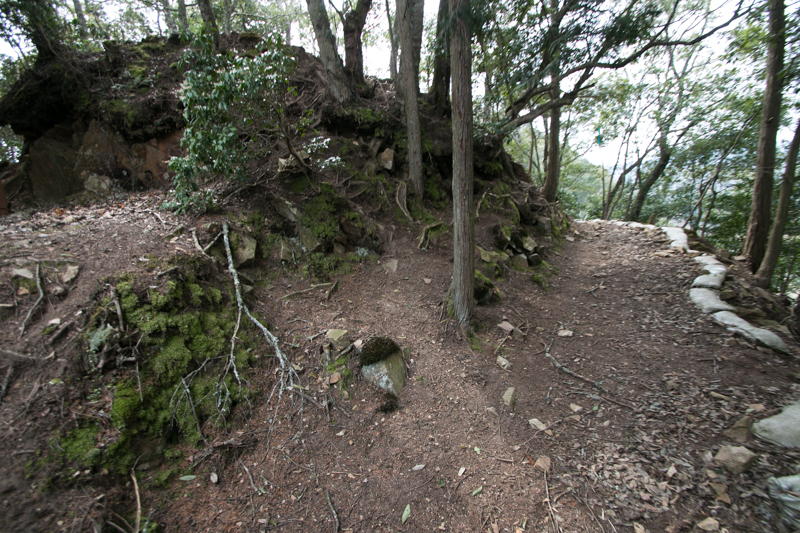 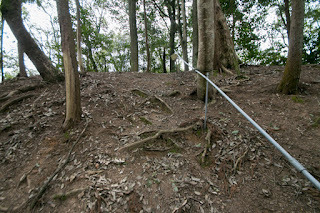 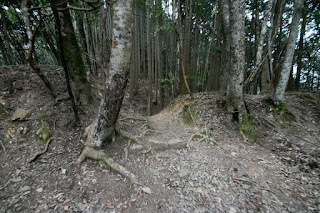 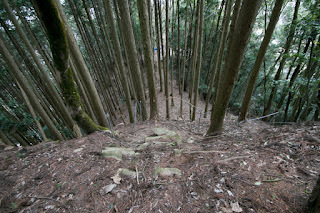 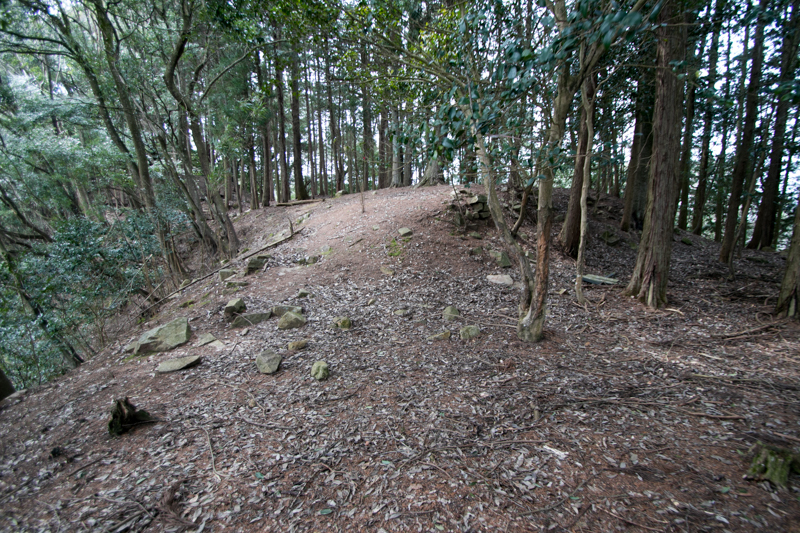 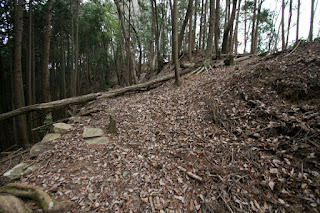 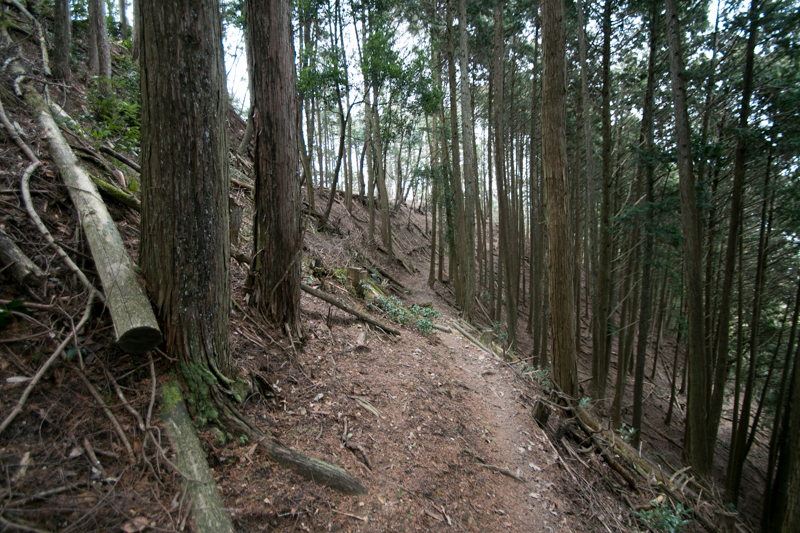 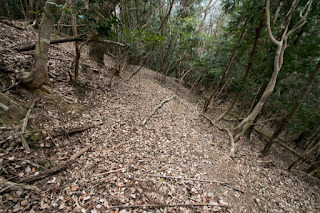 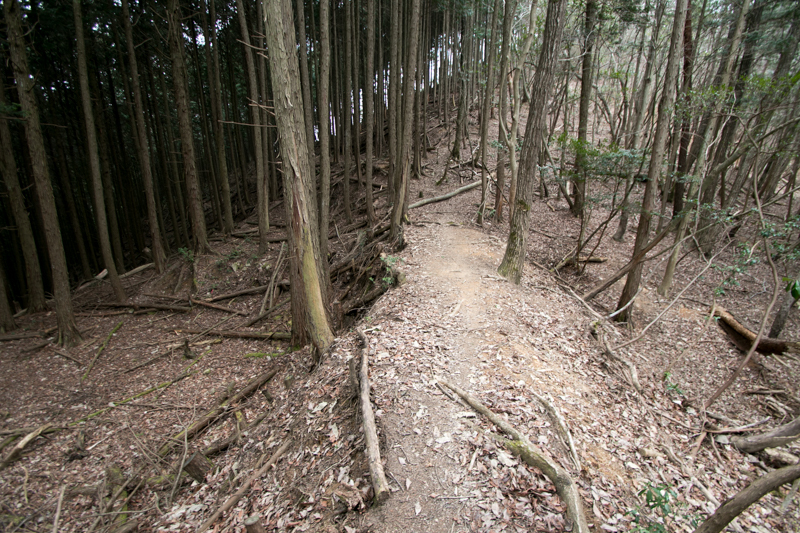 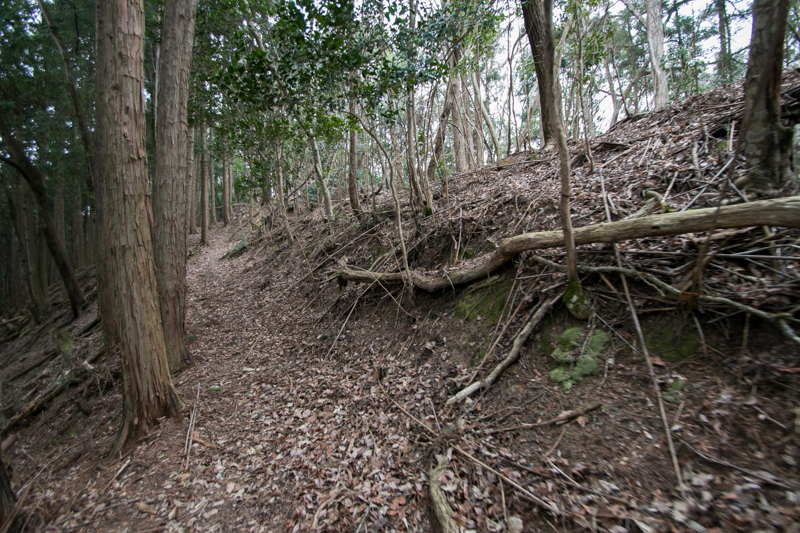 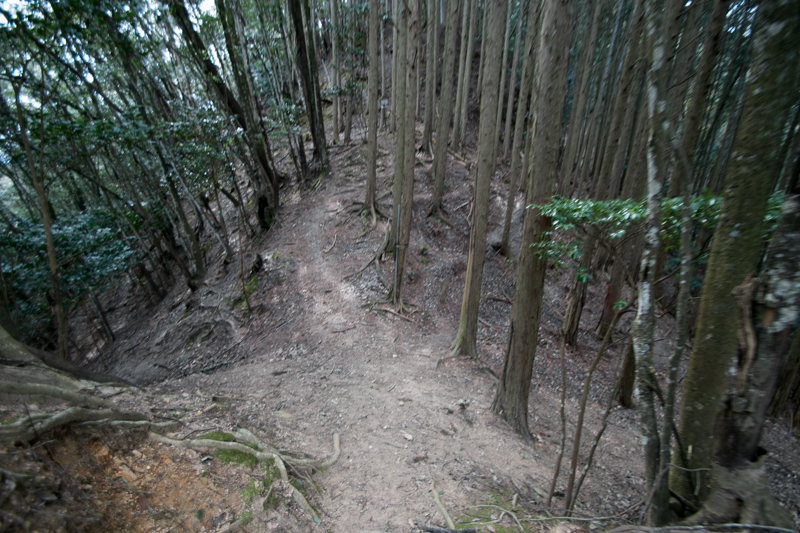 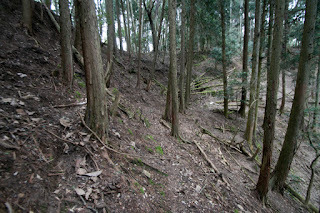 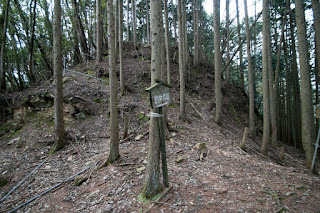 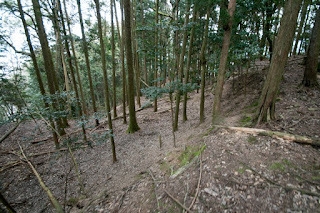 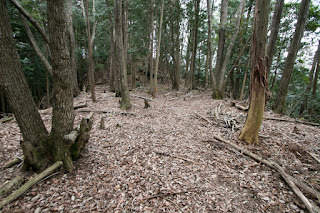 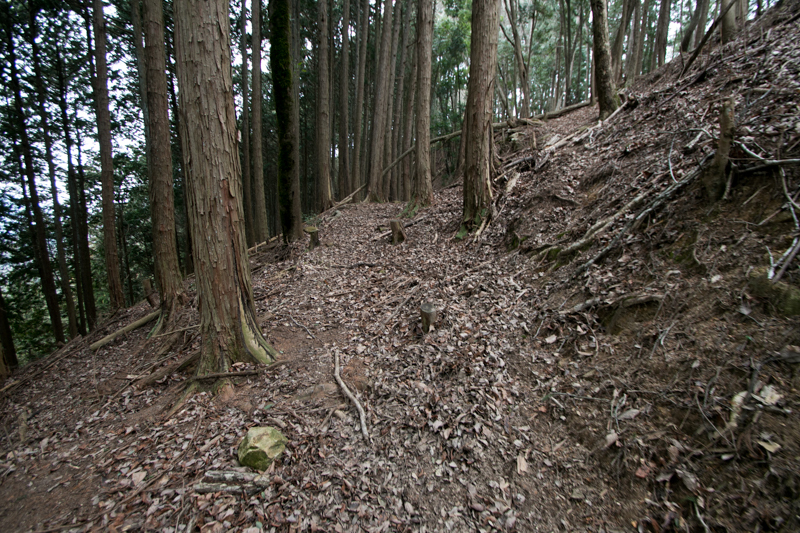 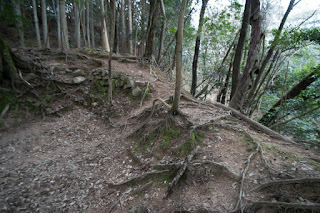 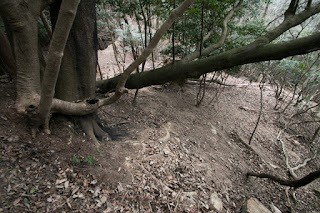 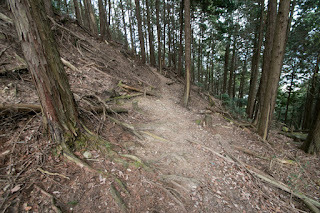 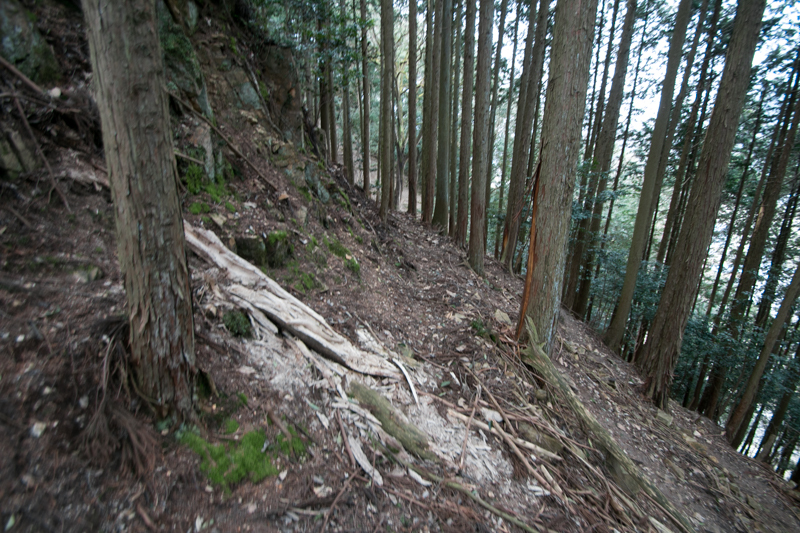 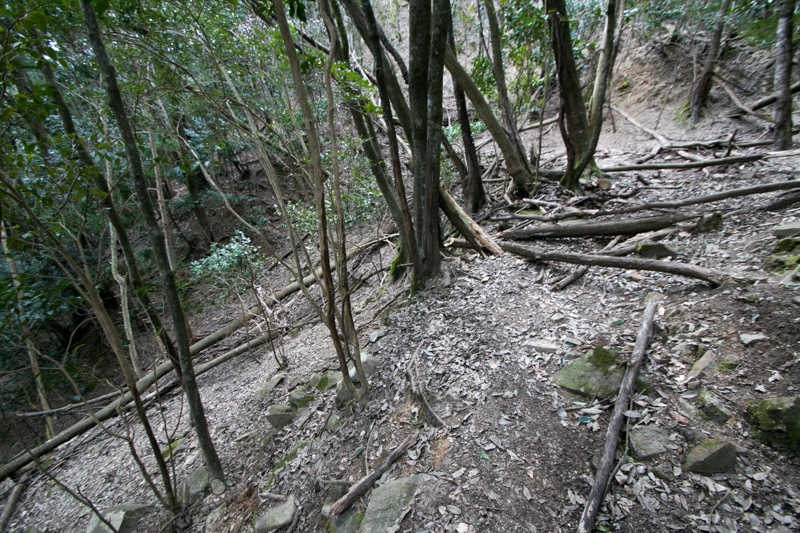 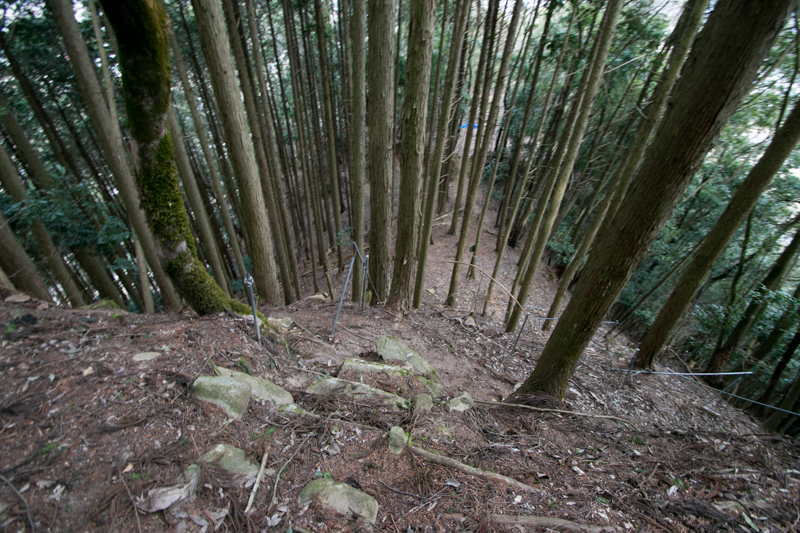 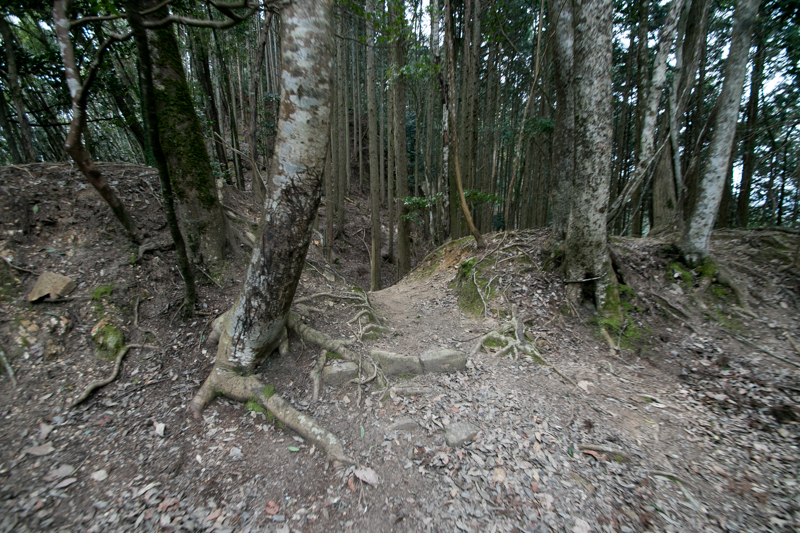 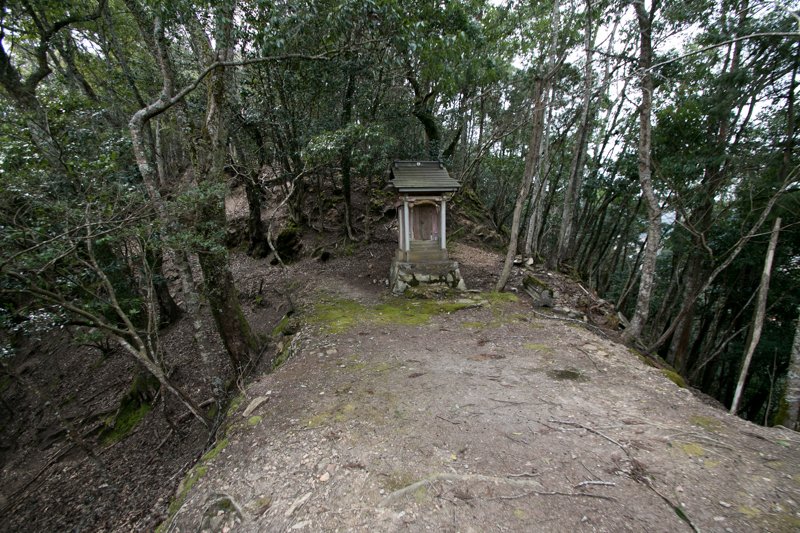 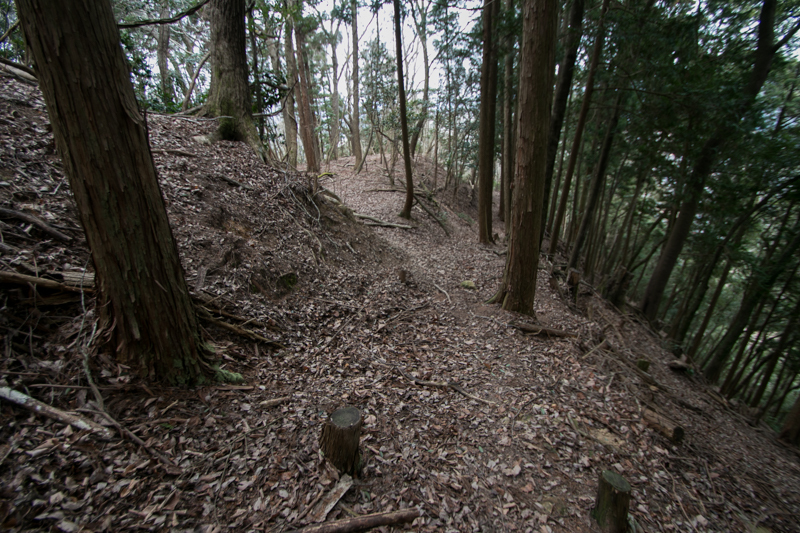 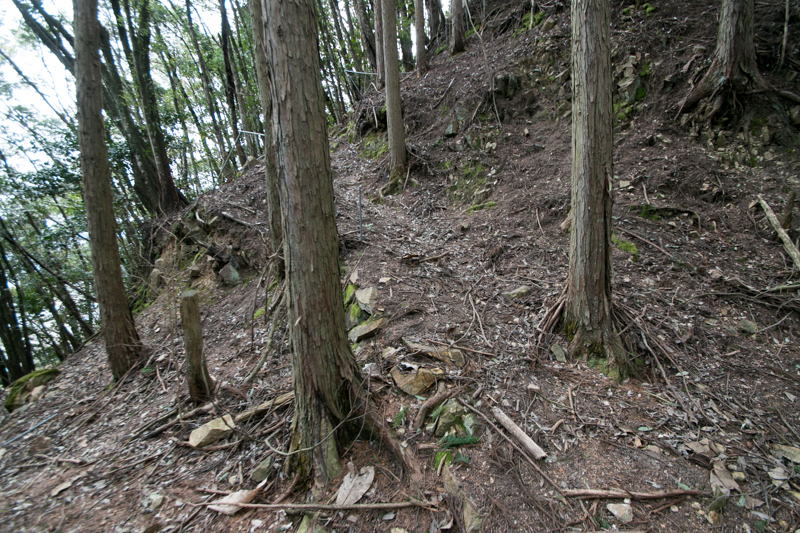 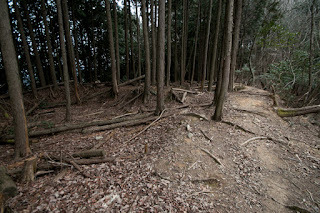 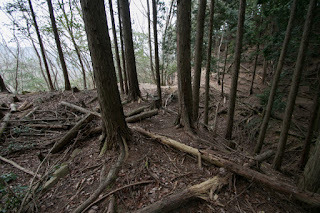 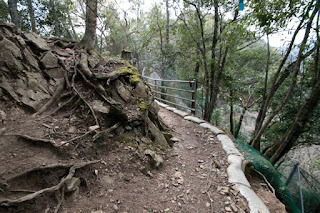 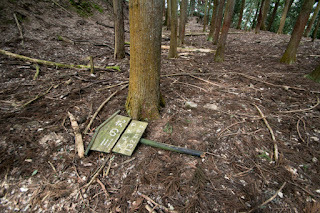 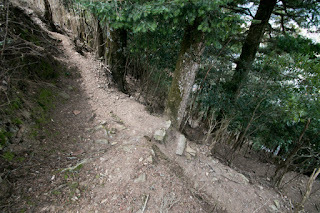 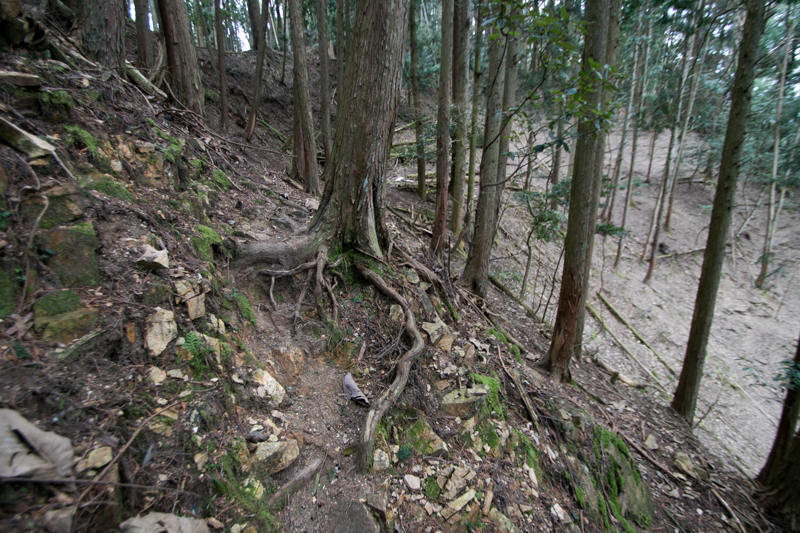 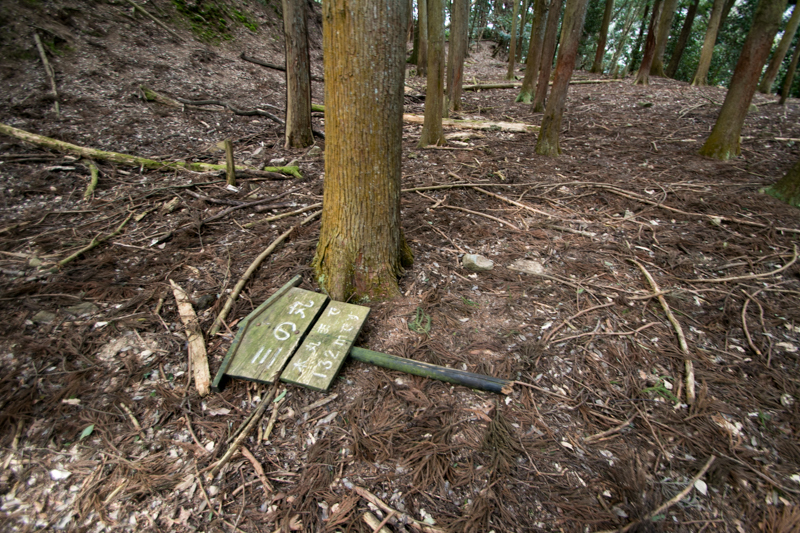 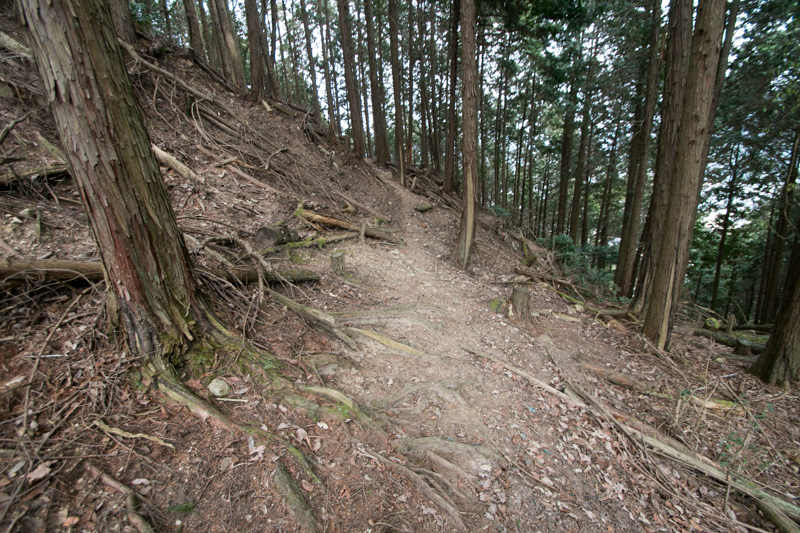 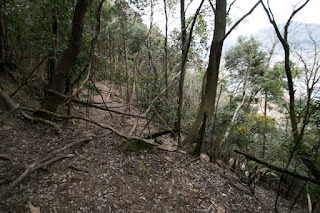 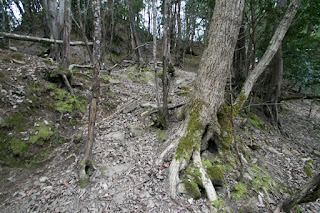 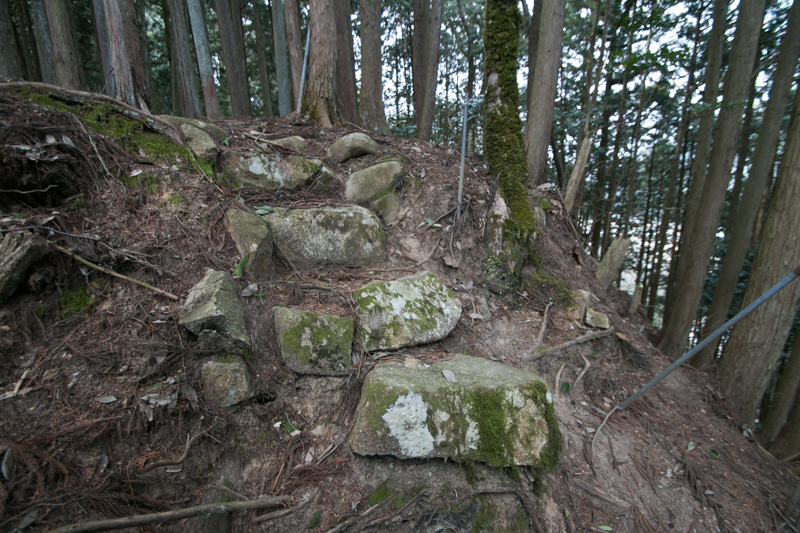 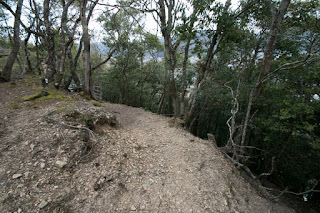 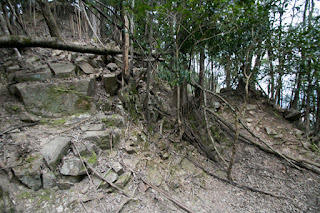 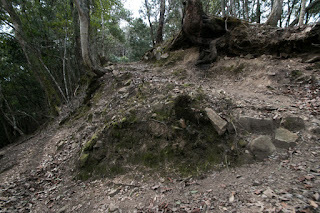 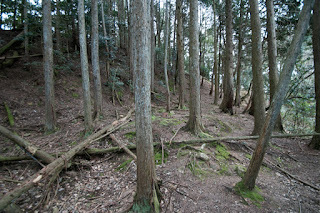 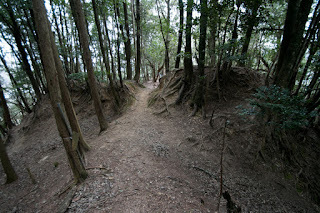 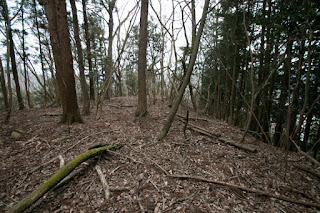 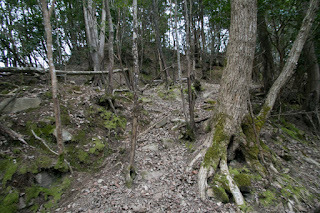 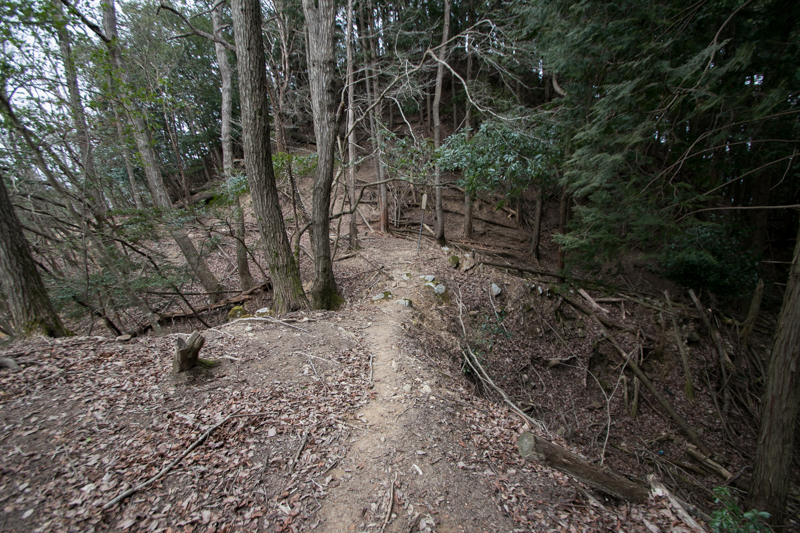 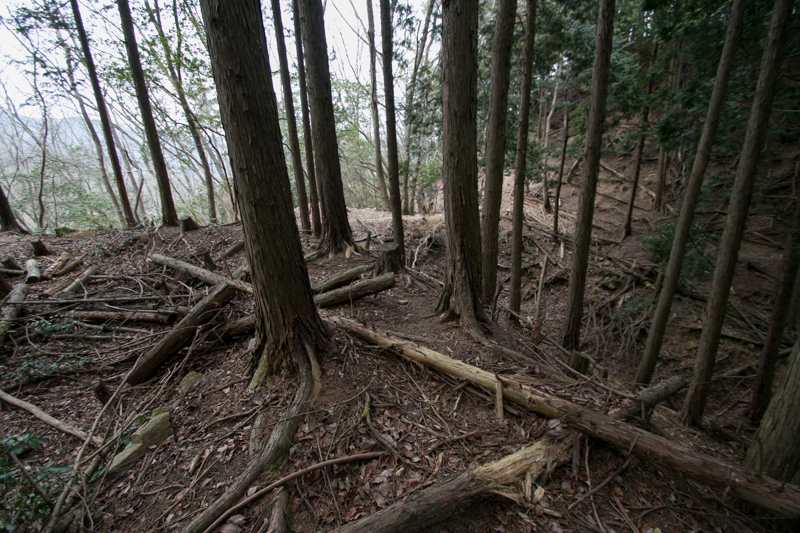 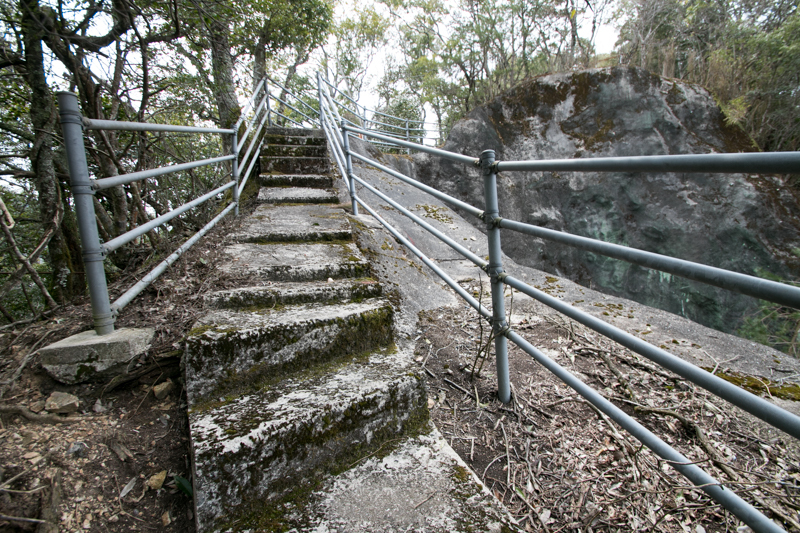 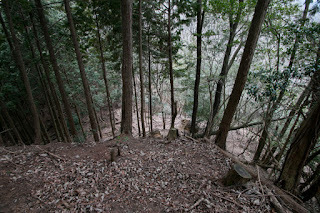 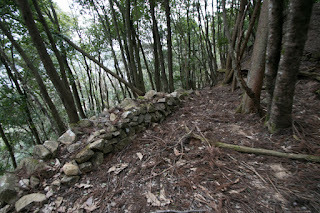 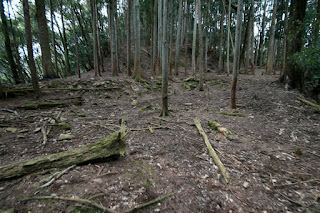 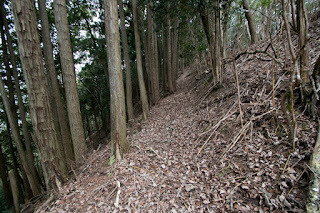 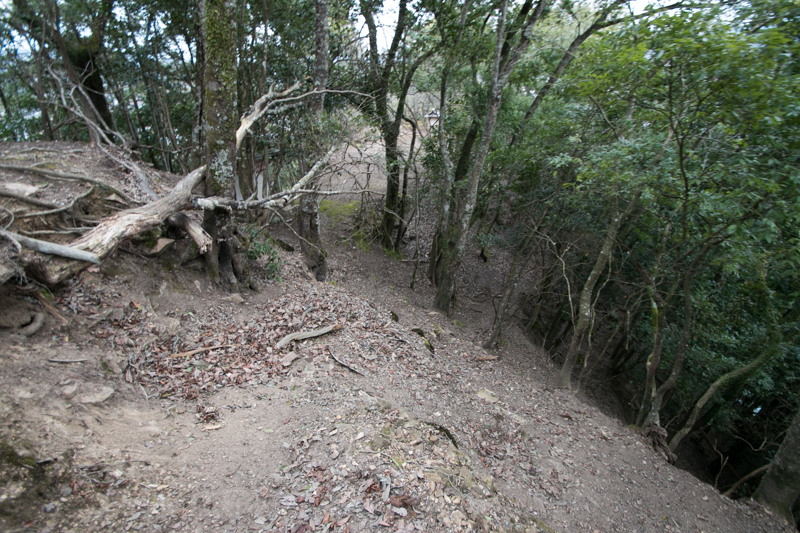 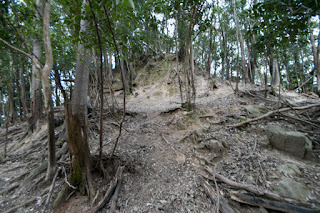 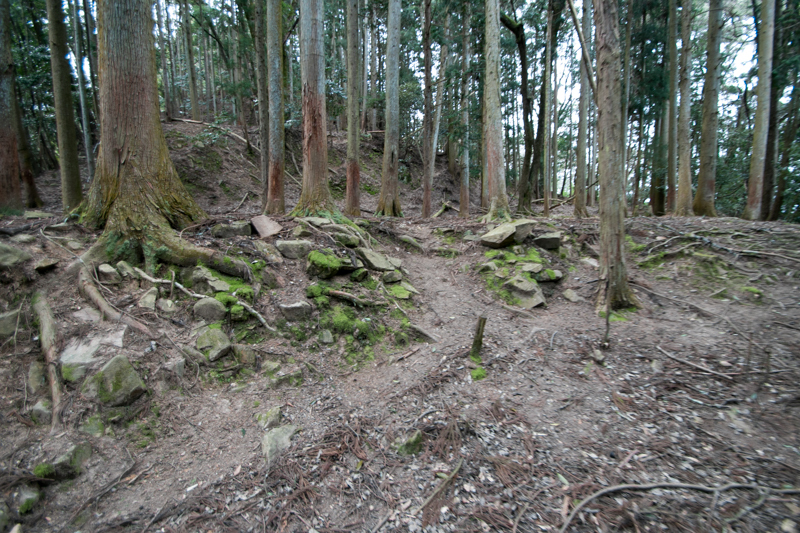 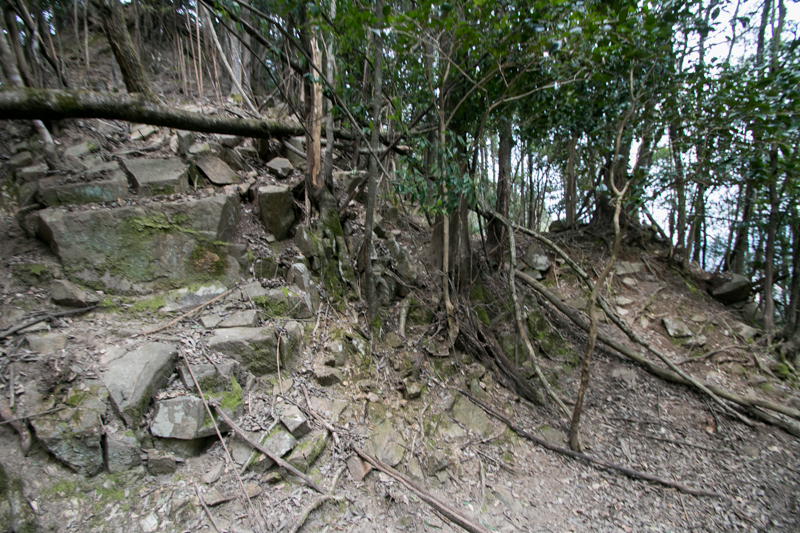 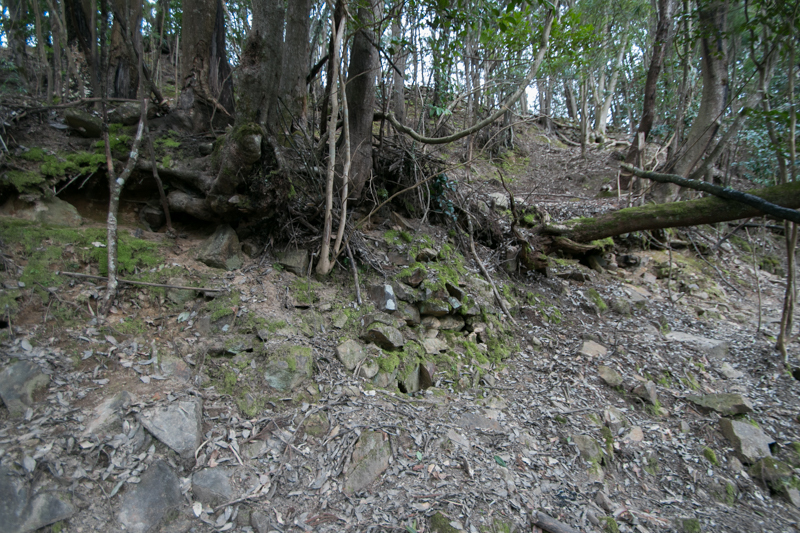 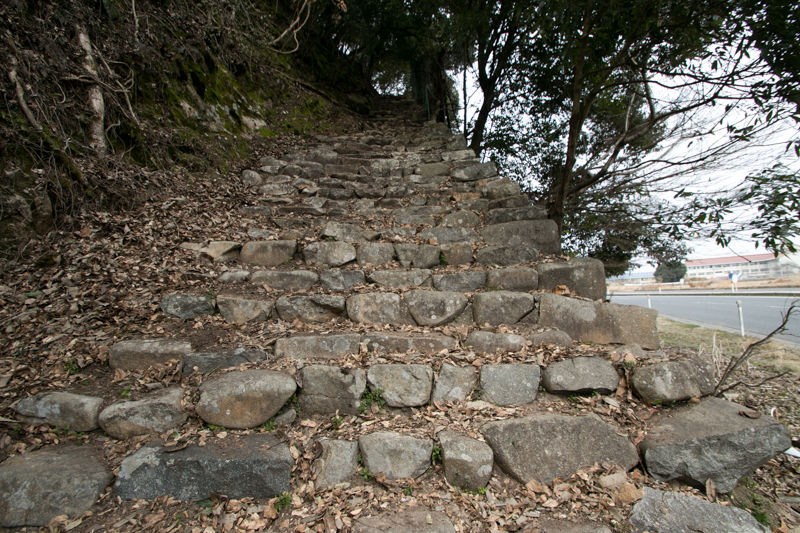 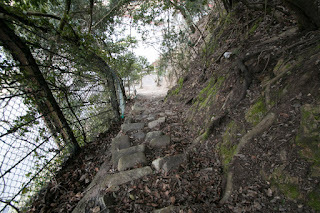 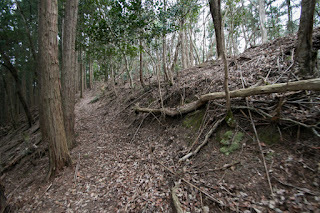 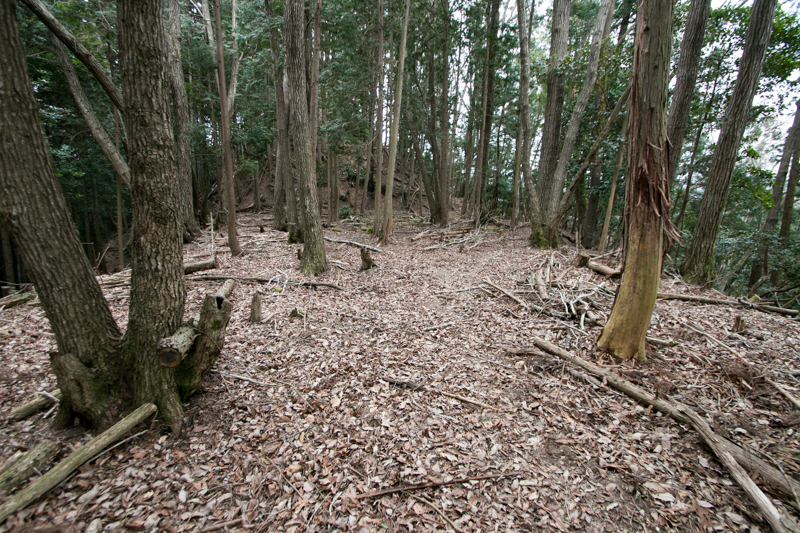 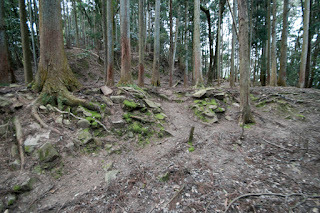 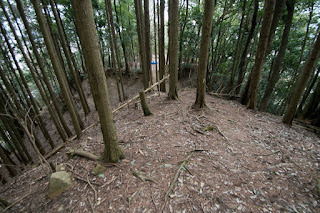 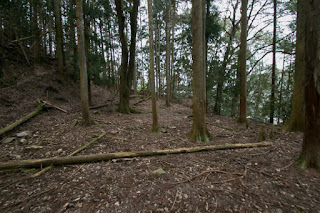 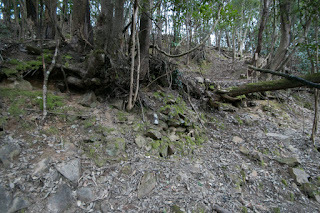 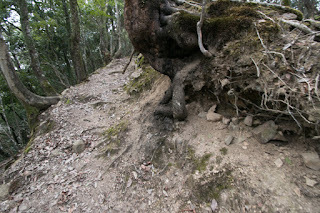 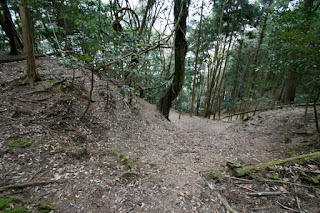 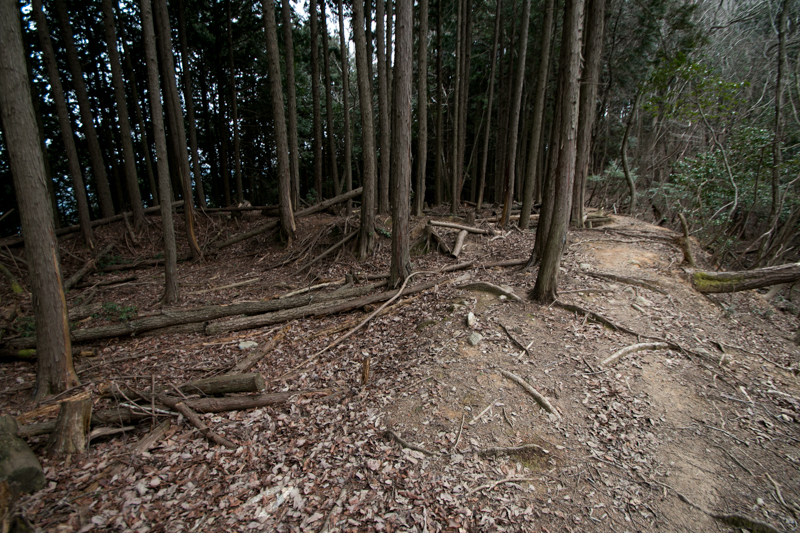 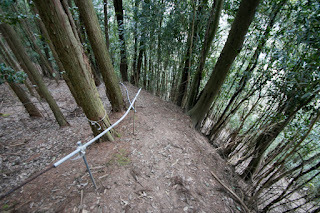 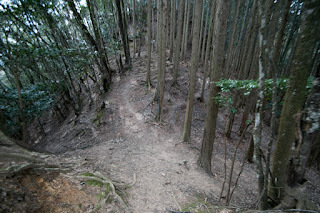 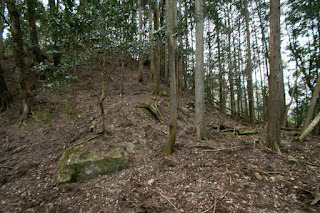 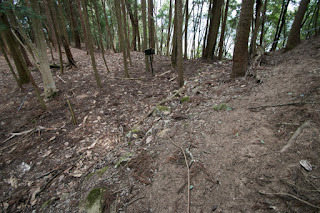 Walking road is well prepared from entrance at east end to central area, but there are only rough path at the backside. It is necessary to carefully walk around at western half of the castle, but remaining ruins are worth to do so. 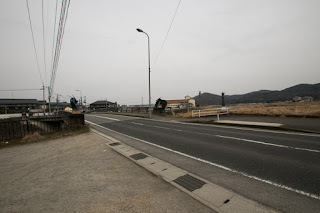 10 minutes walk from JR West Geibi-sen line Kotachi station. 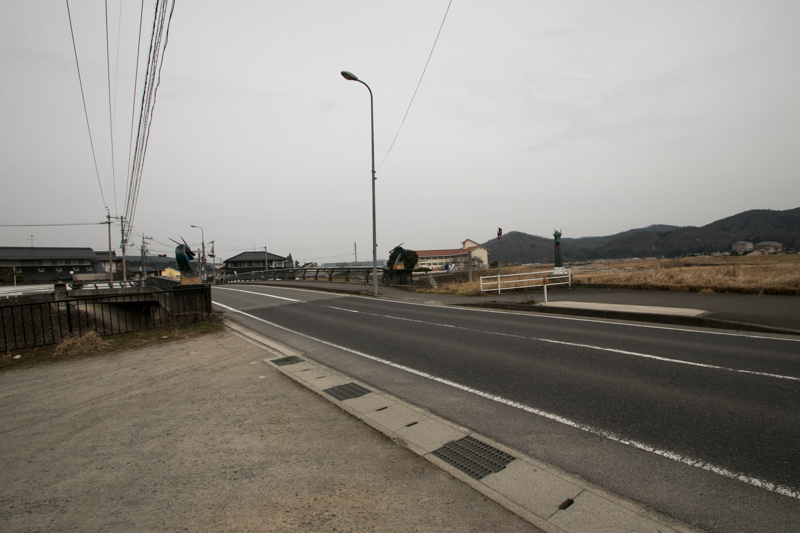 20 minutes drive from Chugoku Jidoshado Expressway Miyoshi interchange. 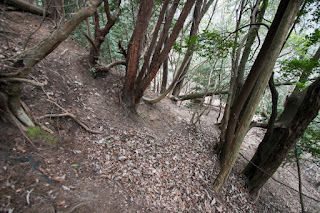 30 minutes walk from hillside entrance to hilltop inner castle.